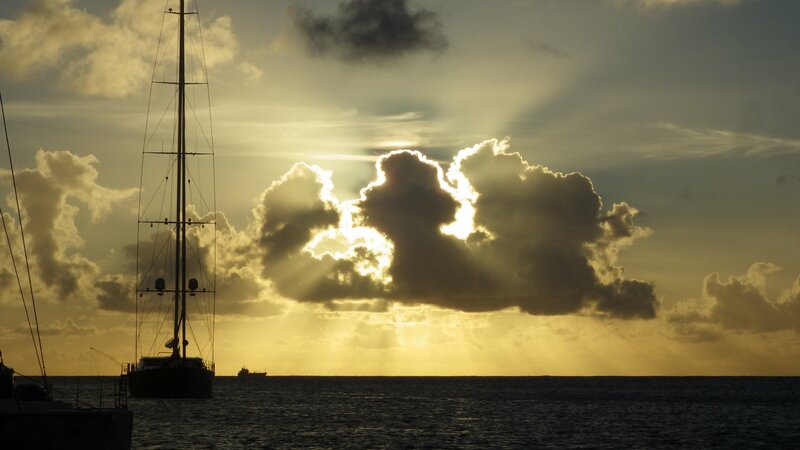 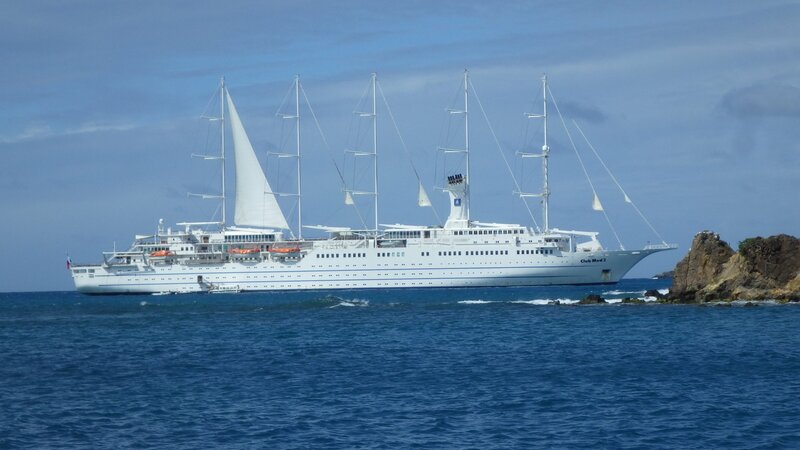 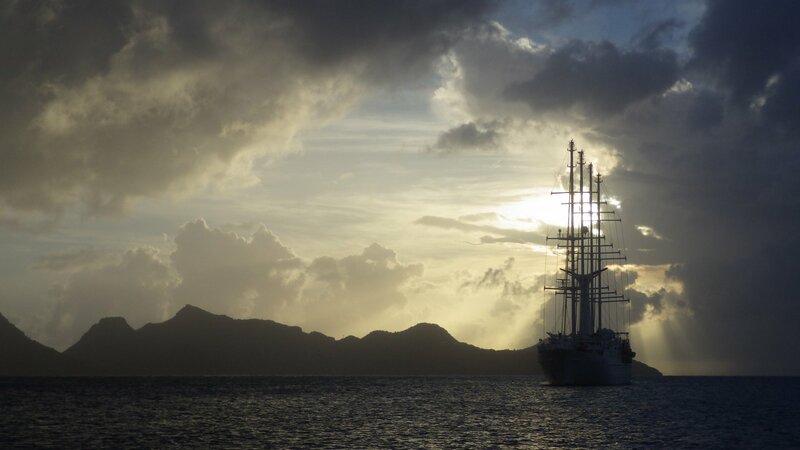 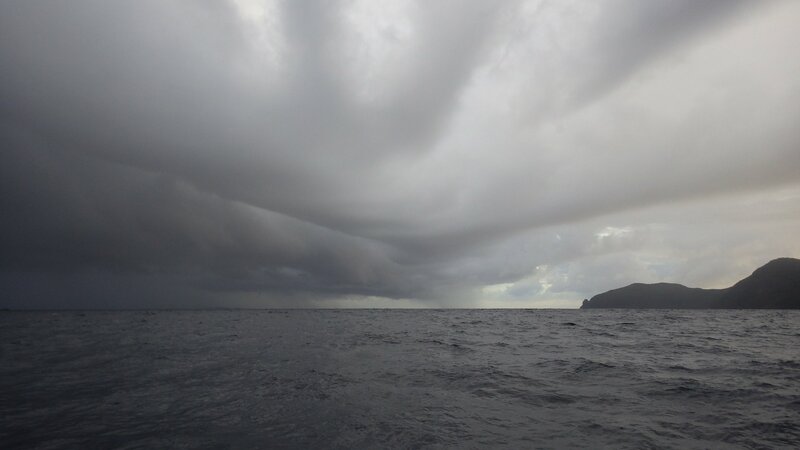 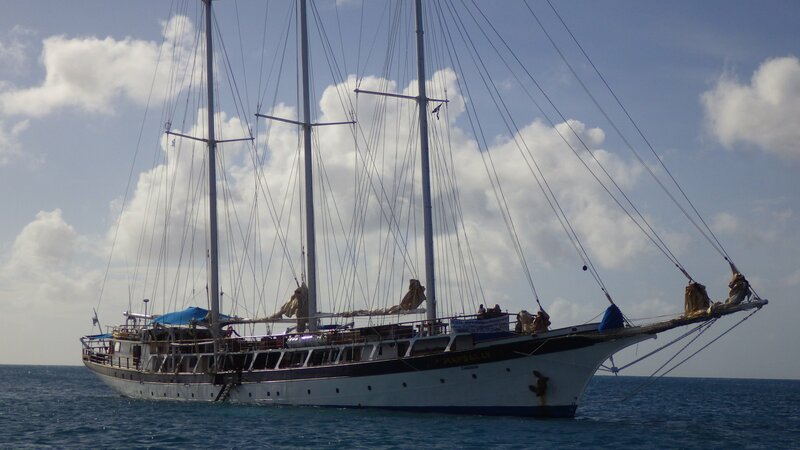 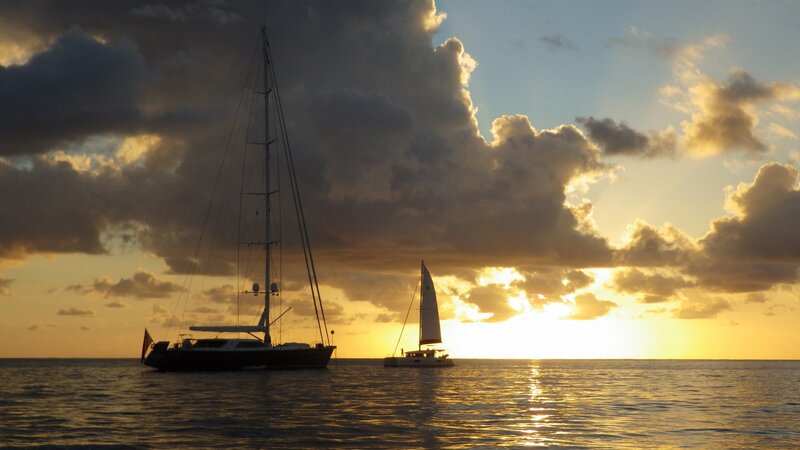 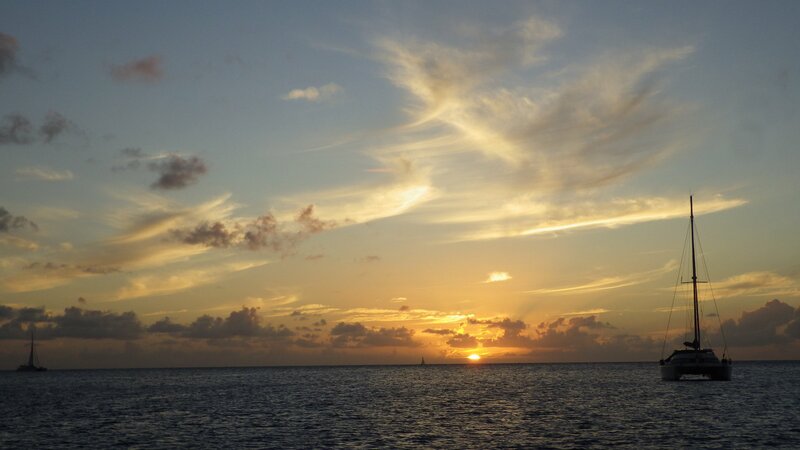 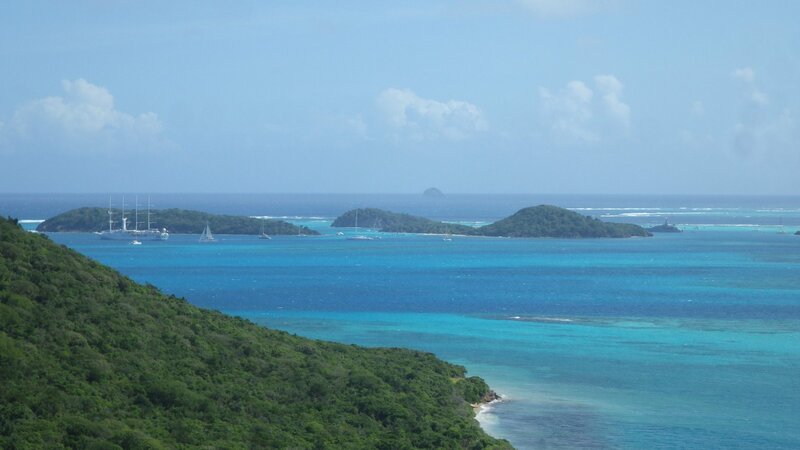 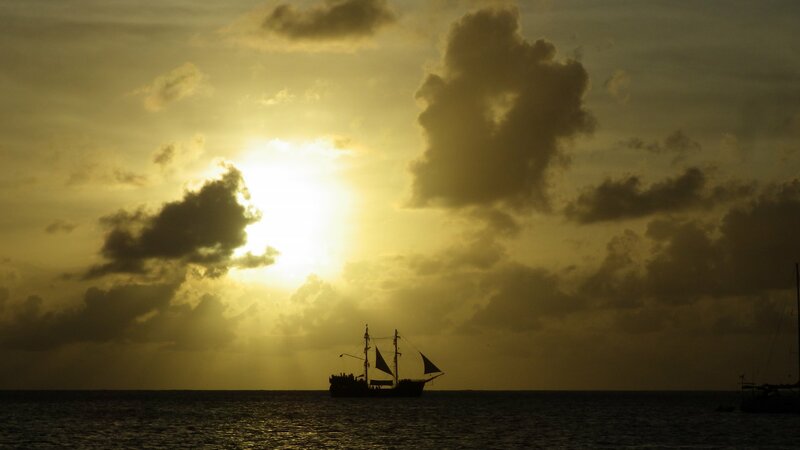 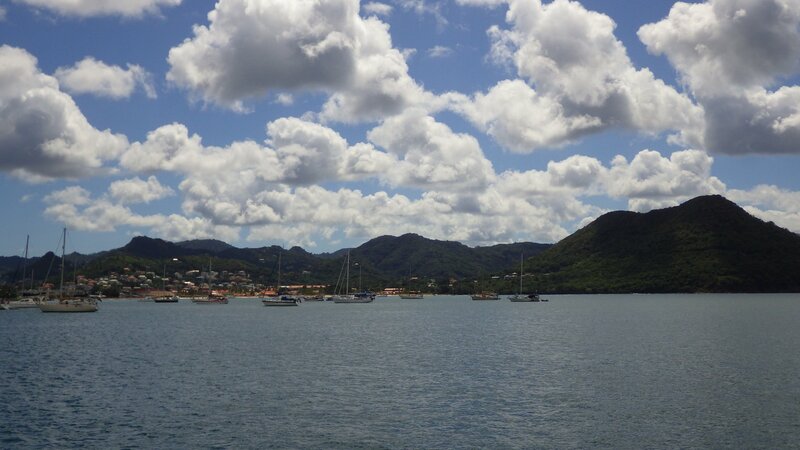 Northbound Cruising South Caribbean Islands - Grenadines, St. Liucia, Martinique. 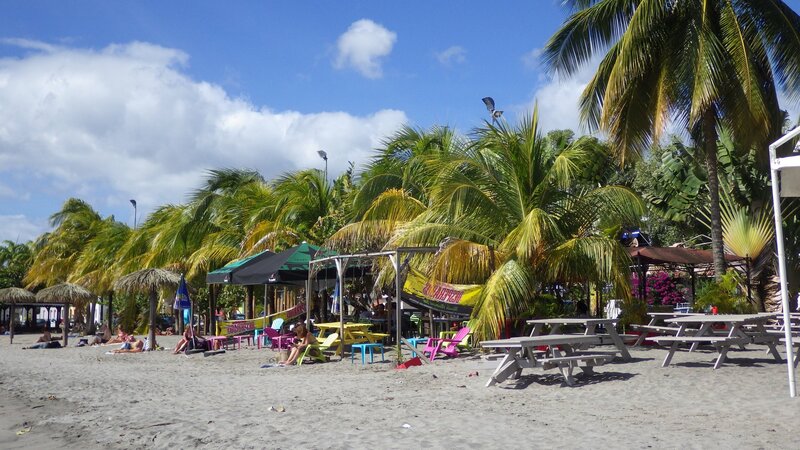 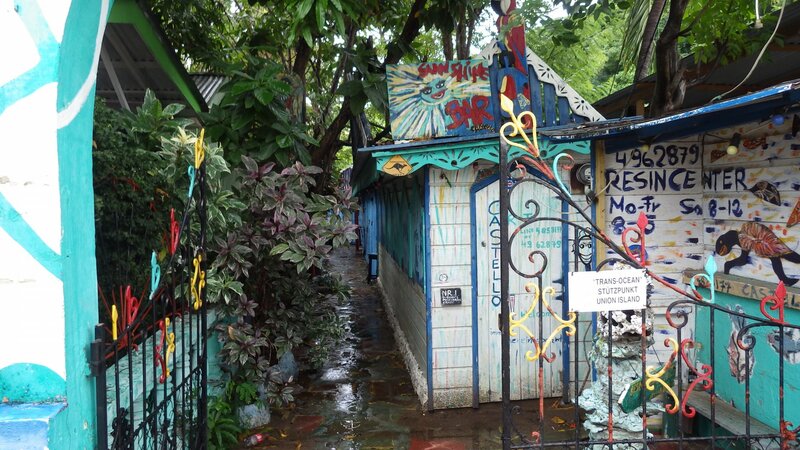 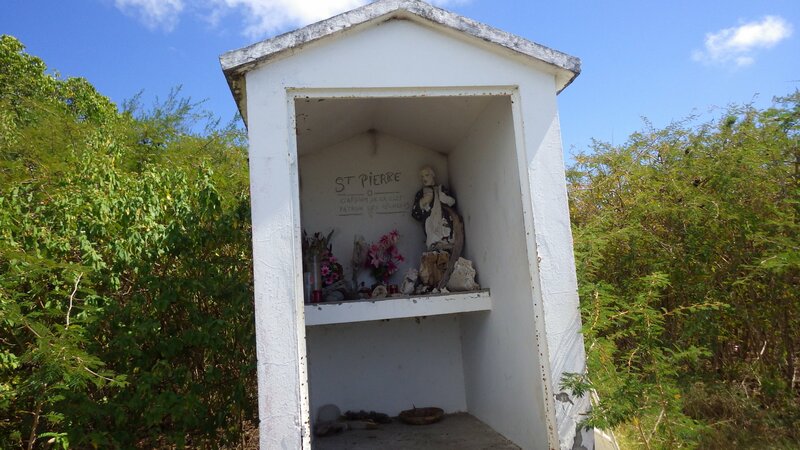 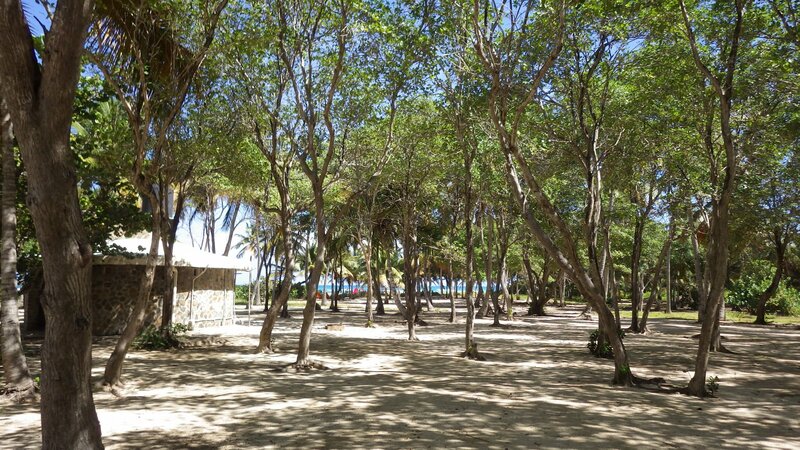 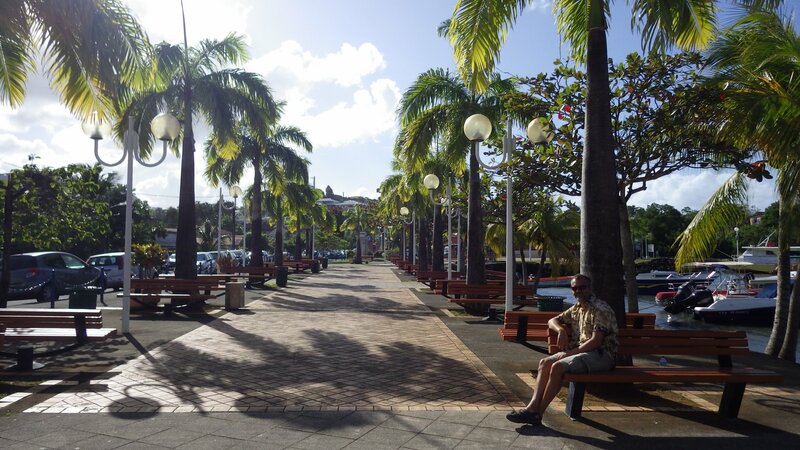 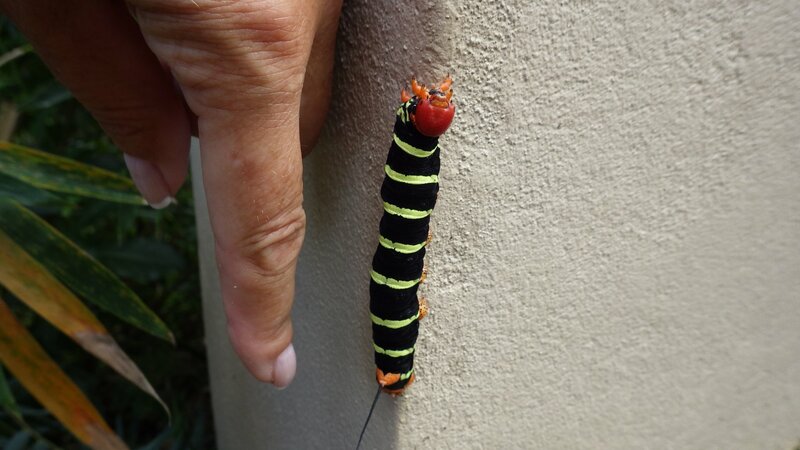 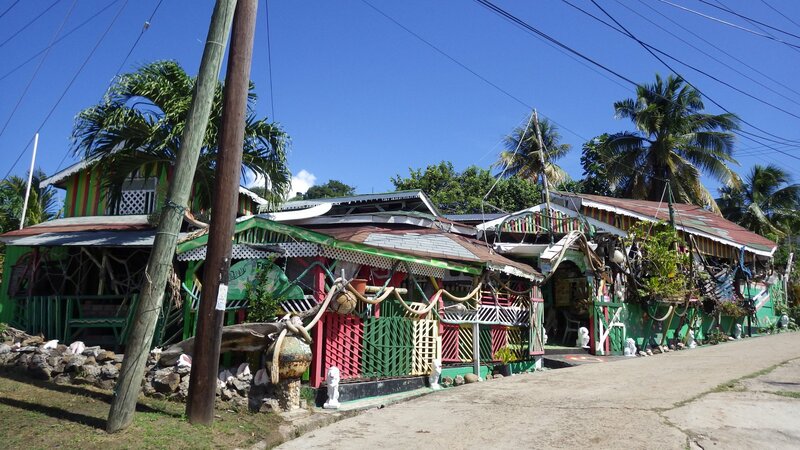 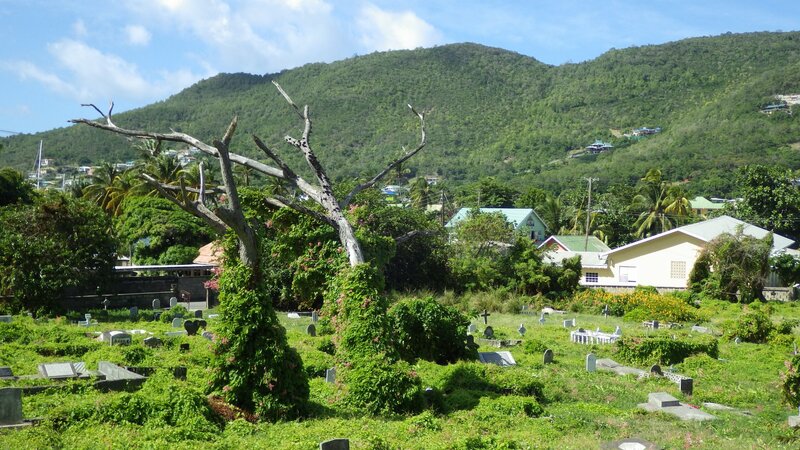 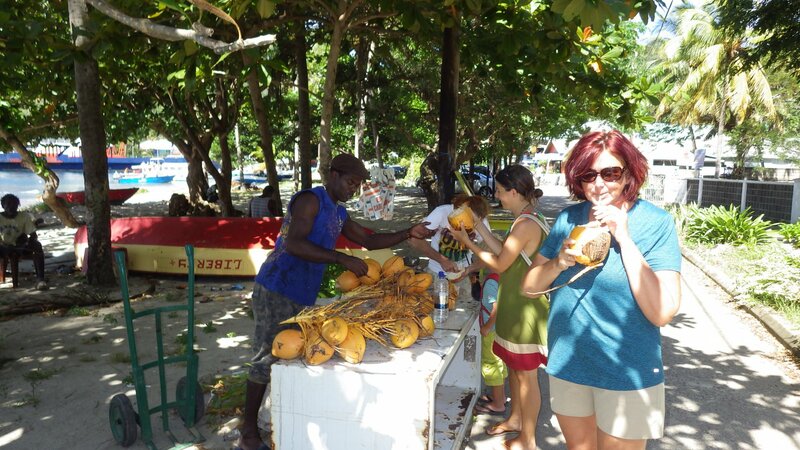 As we going back the Caribbean Islands chain northbound, we revisit places we liked, skip ones we didn't, and look for places we missed on our southbound trip. 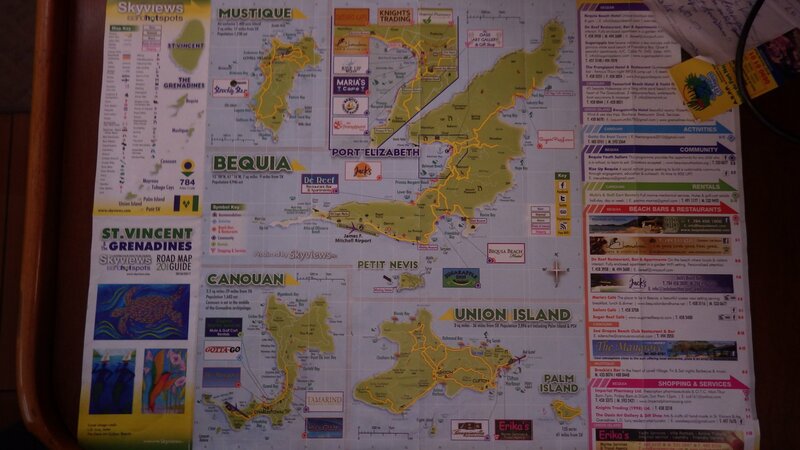 Since many of them are repeat visits, there will be fewer details here. 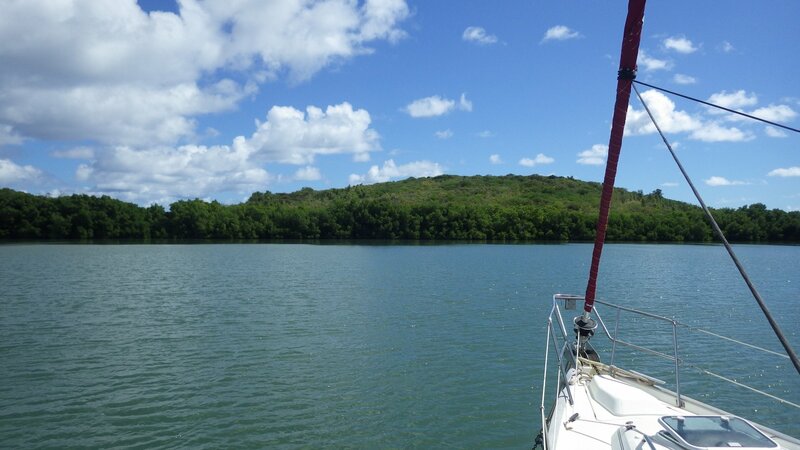 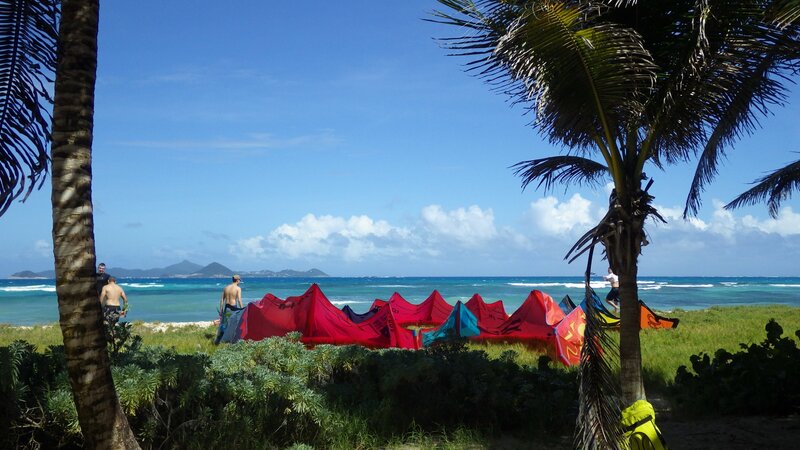 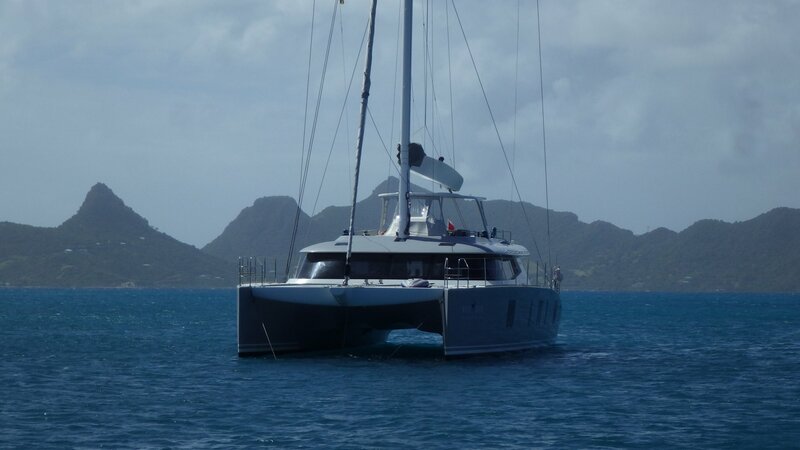 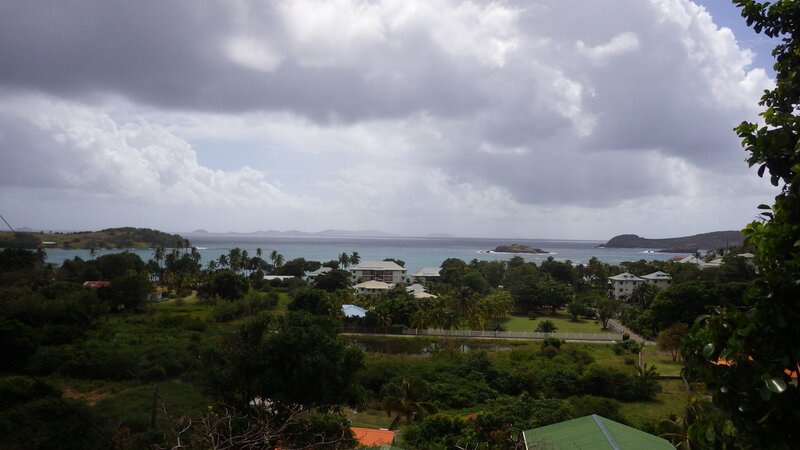 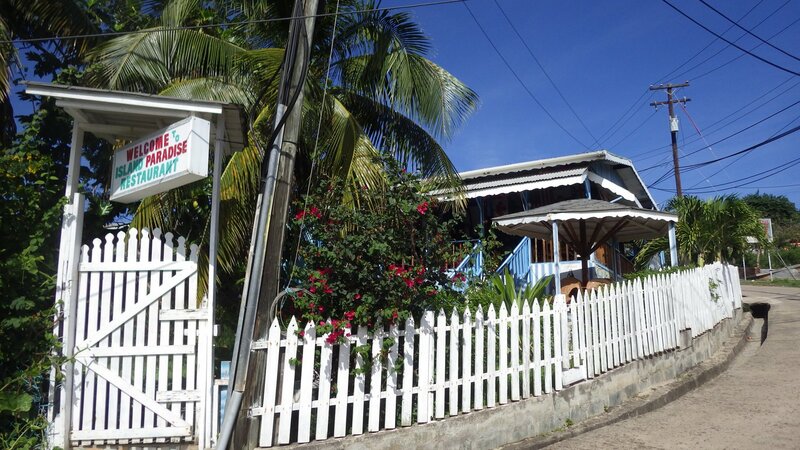 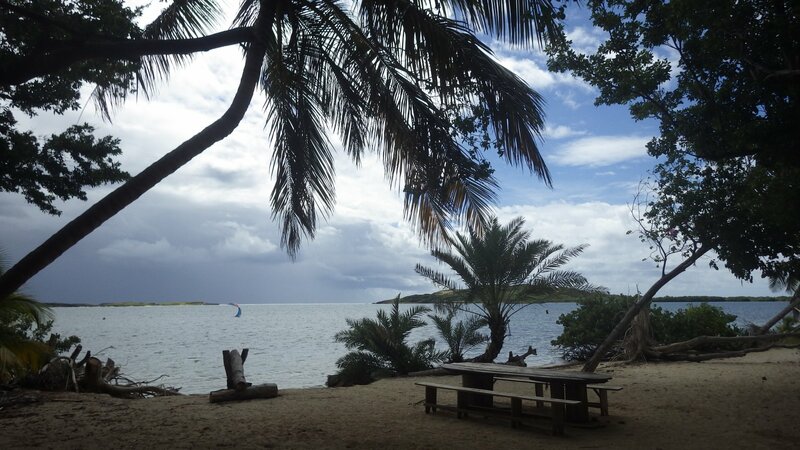 We checked-in at Clifton Harbour on Union Island. 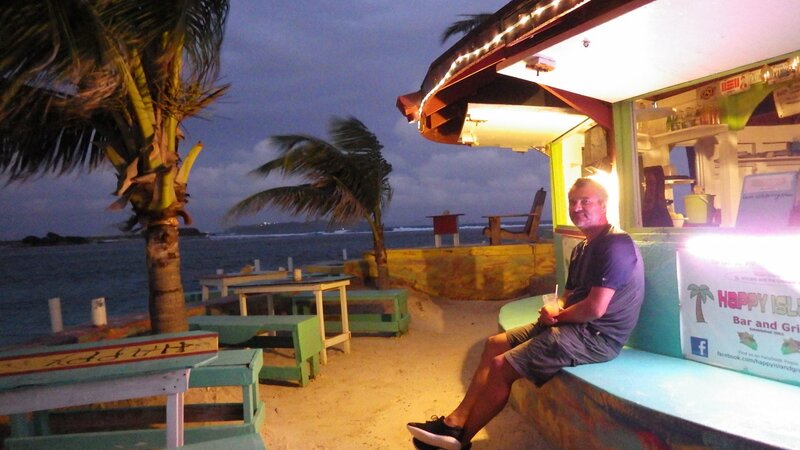 Visited a unique but expensive bar on the tiny island, called "Happy Island". 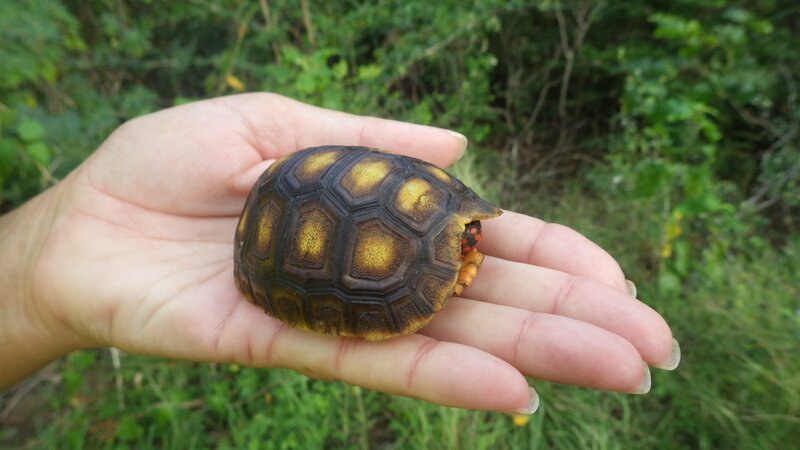 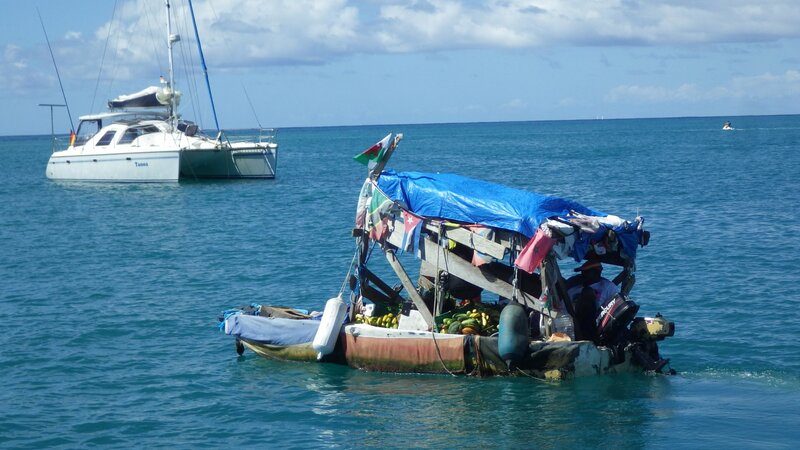 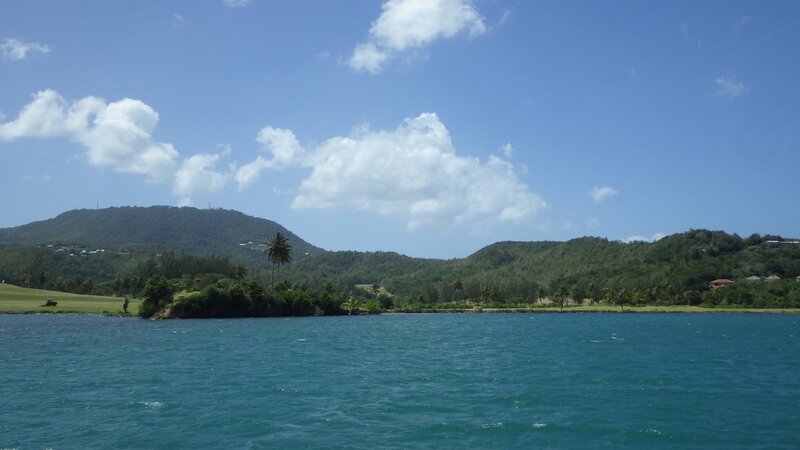 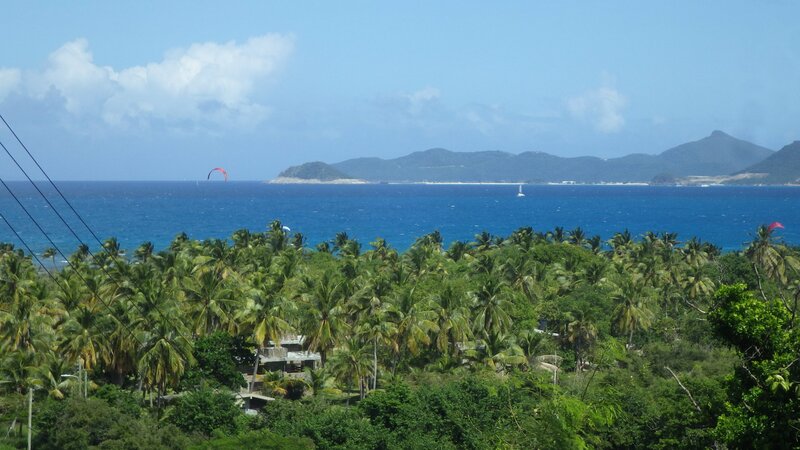 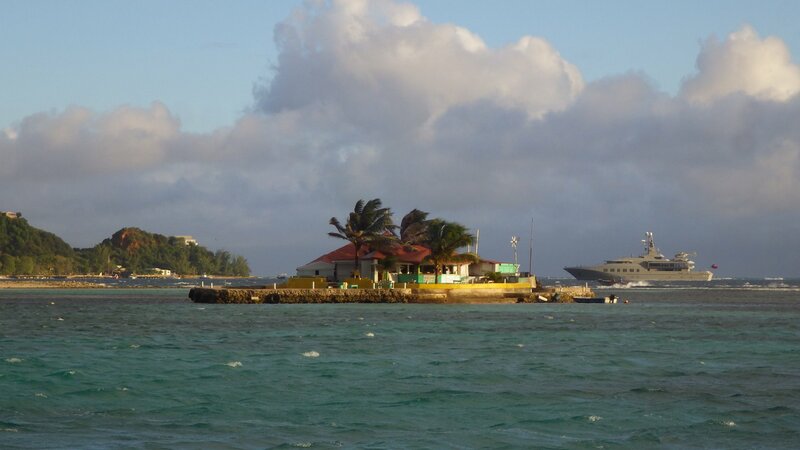 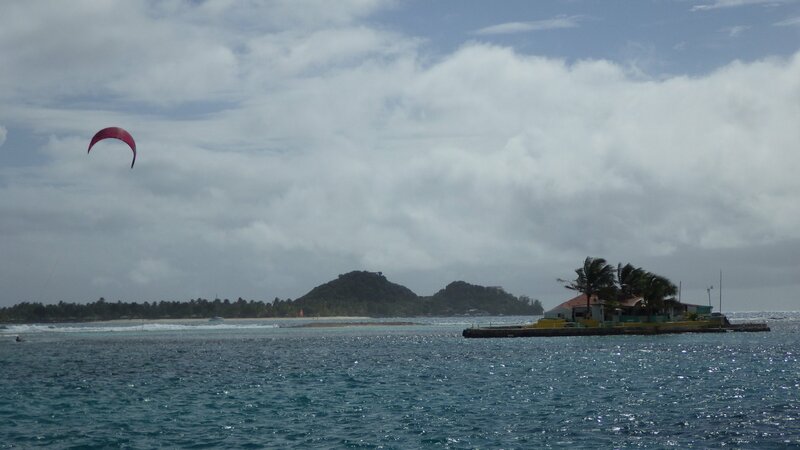 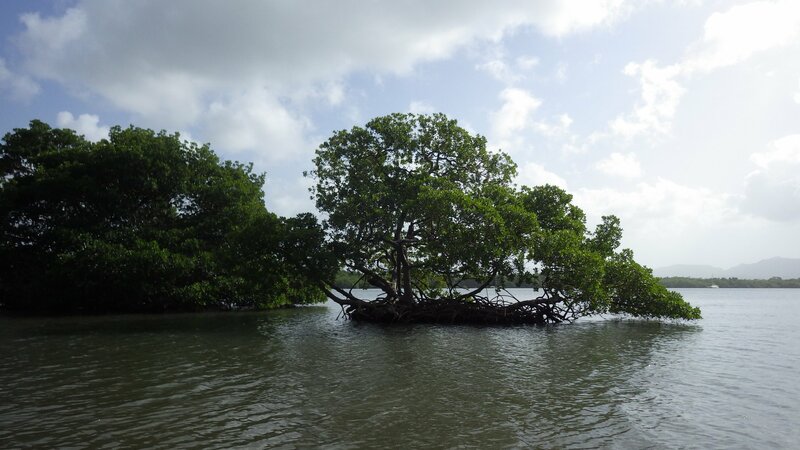 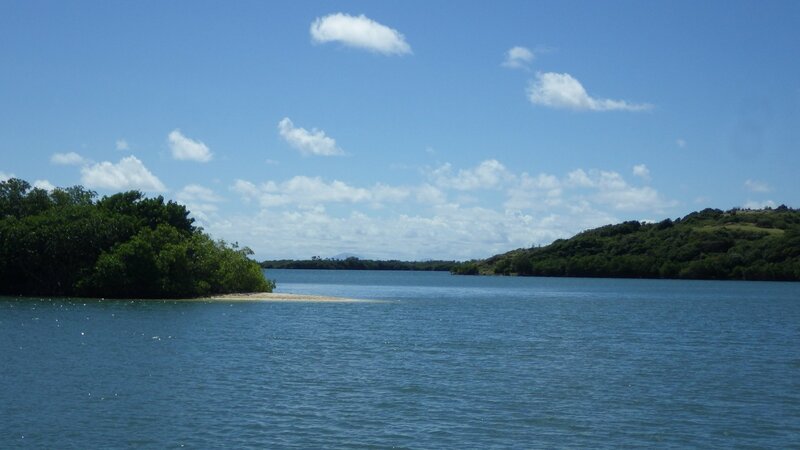 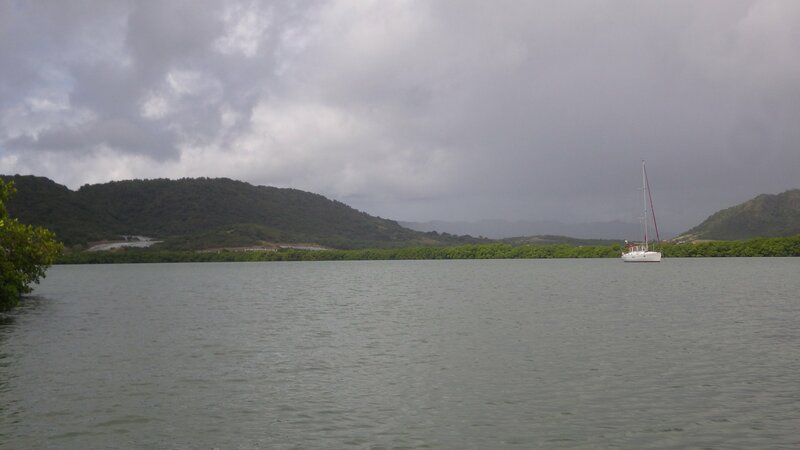 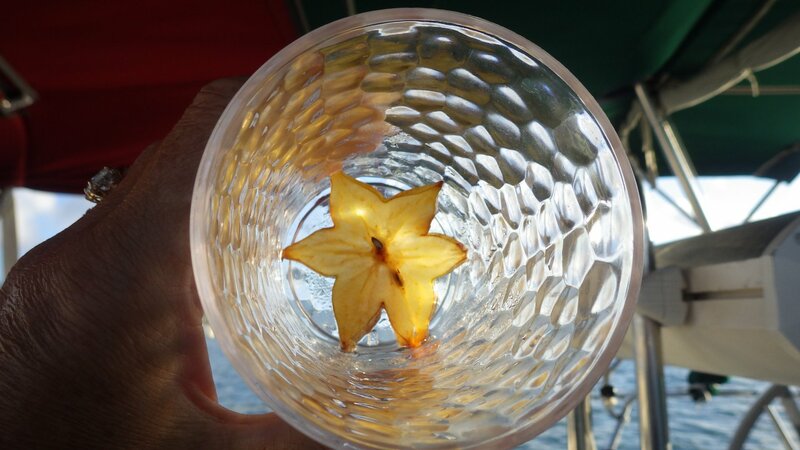 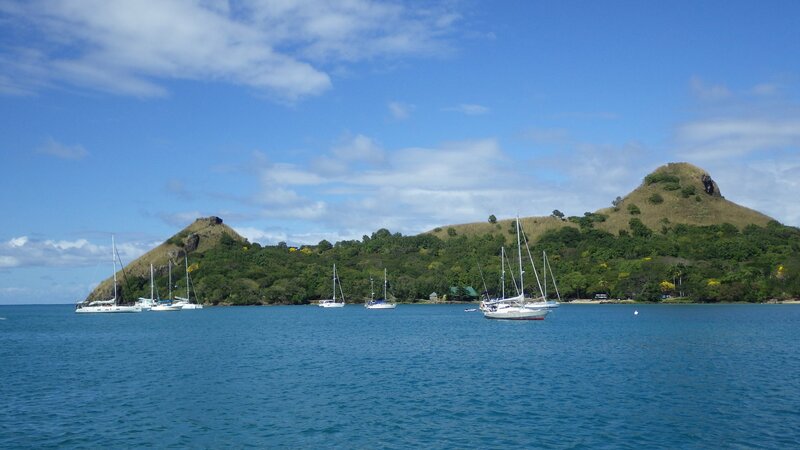 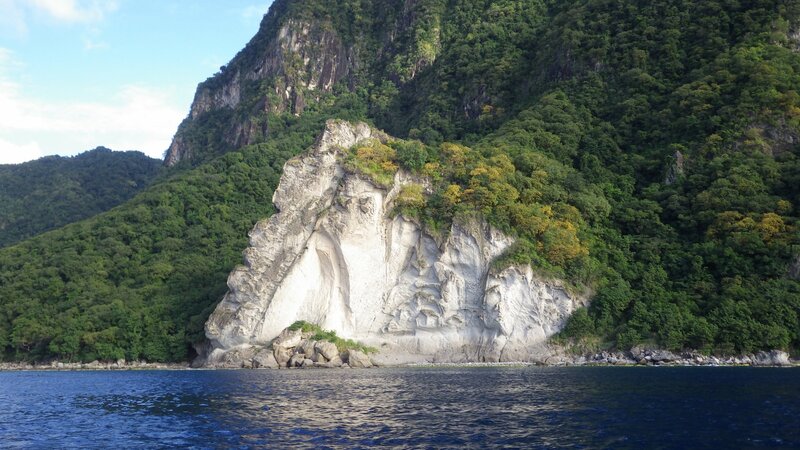 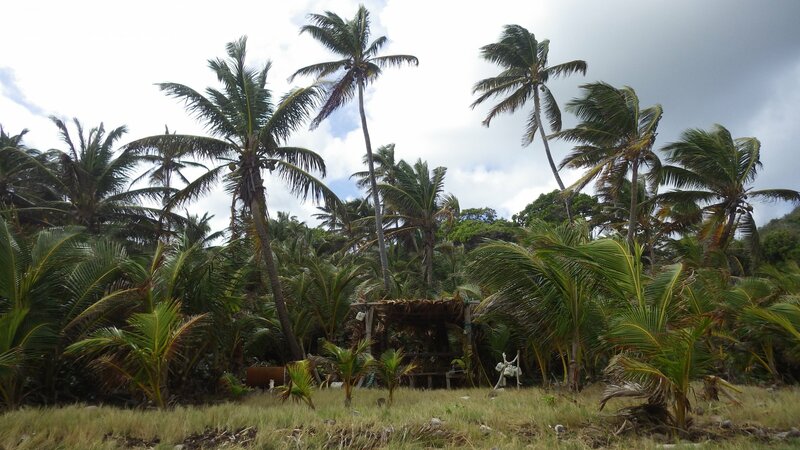 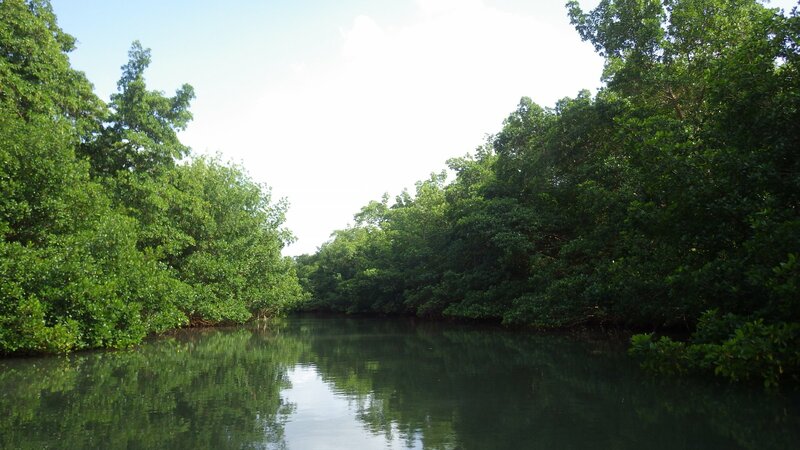 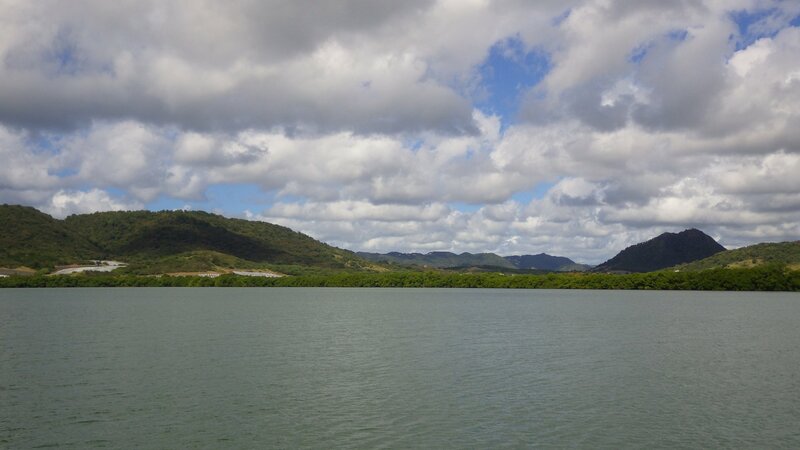 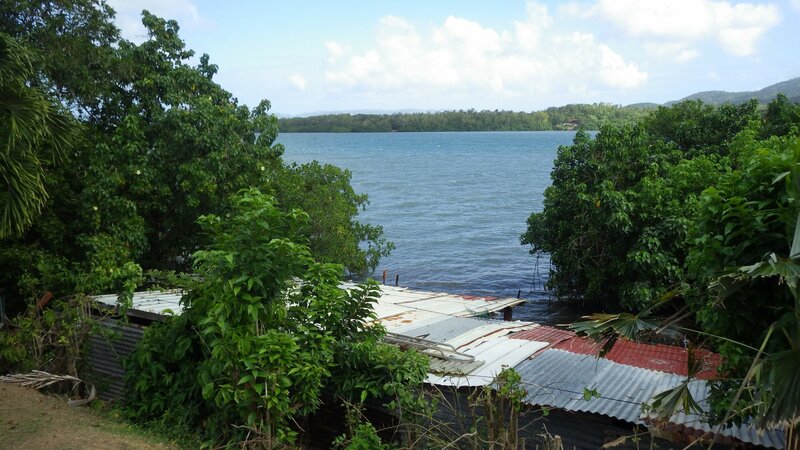 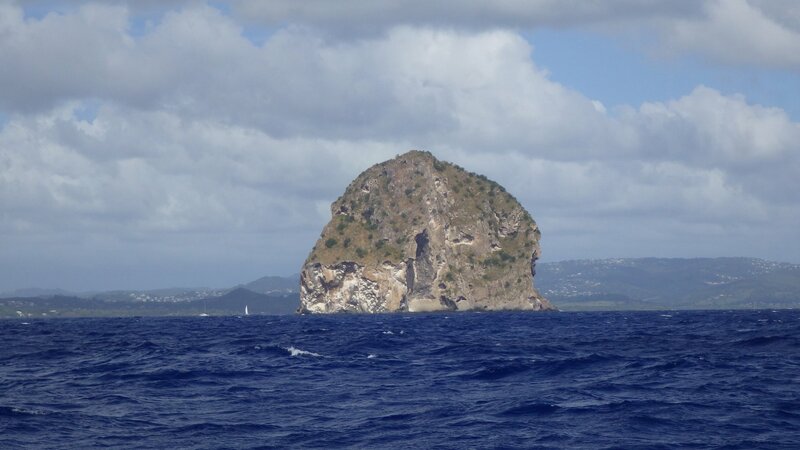 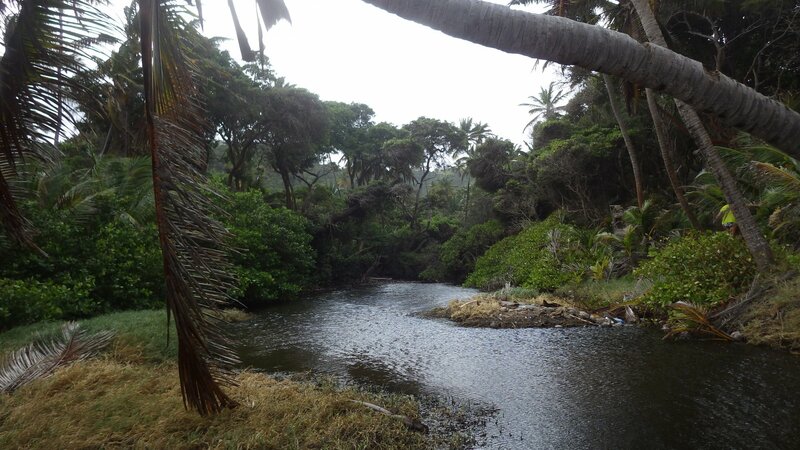 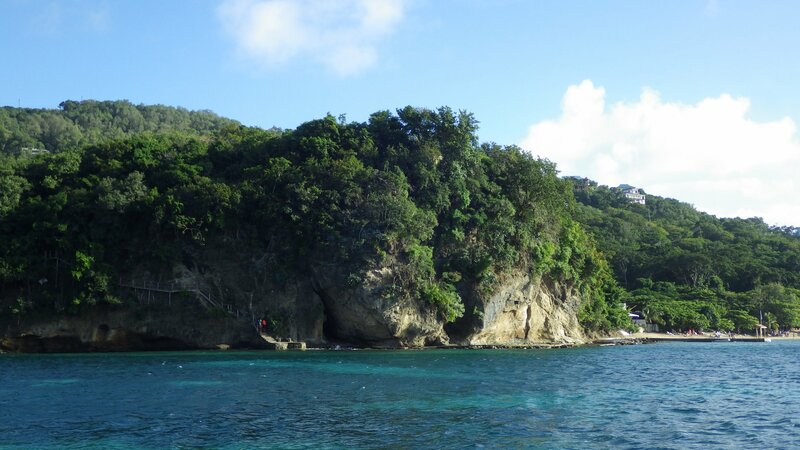 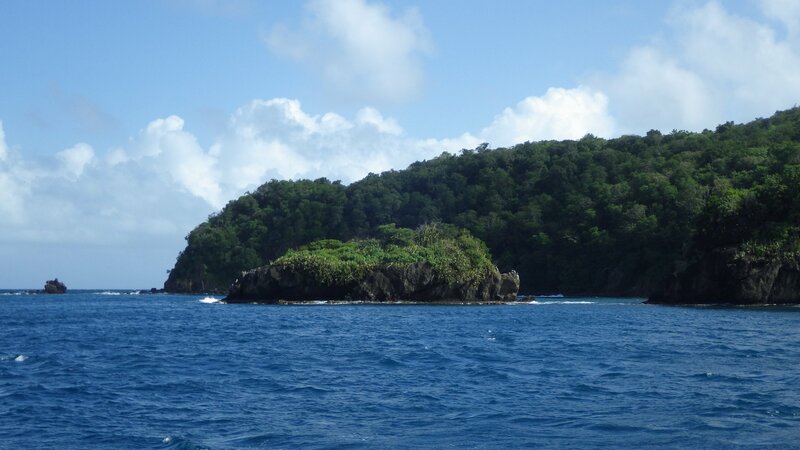 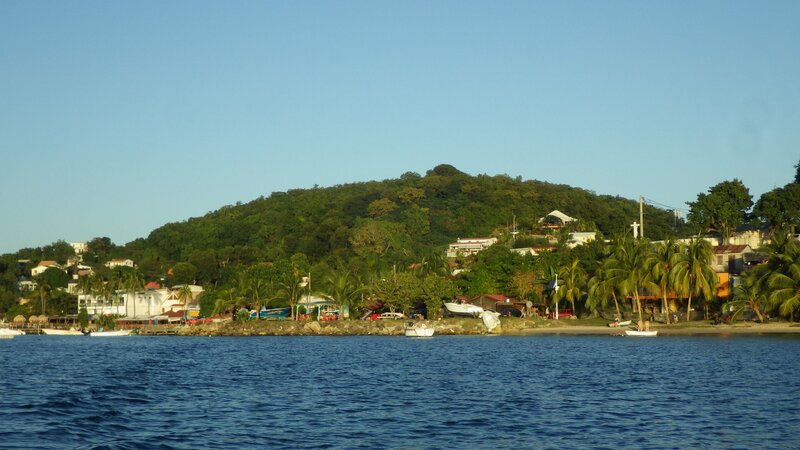 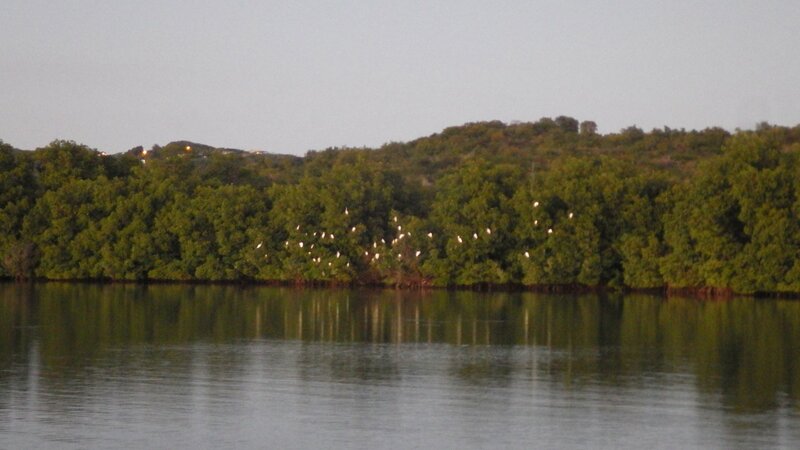 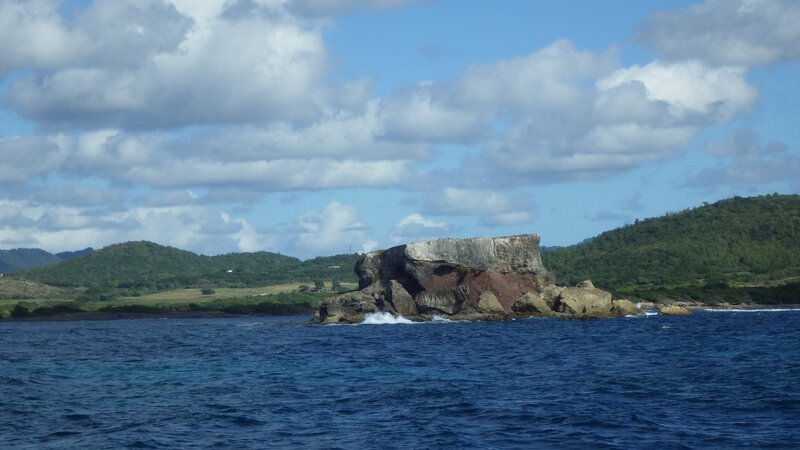 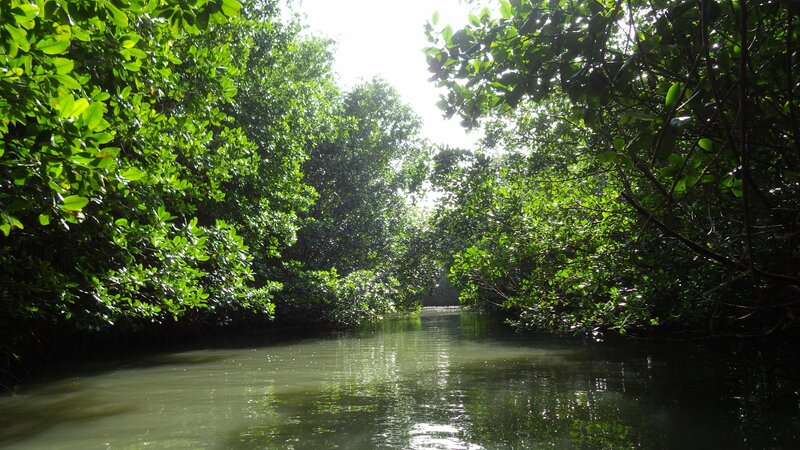 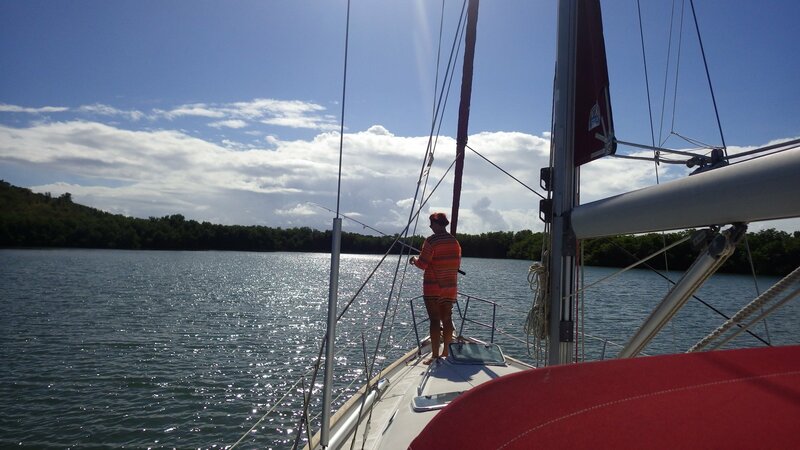 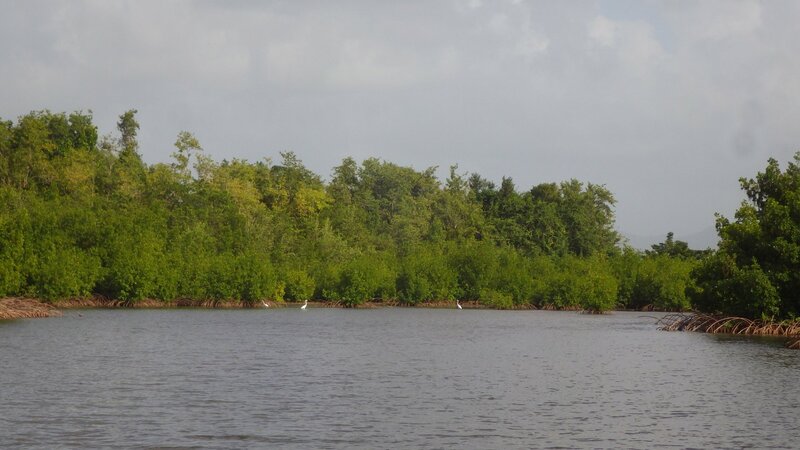 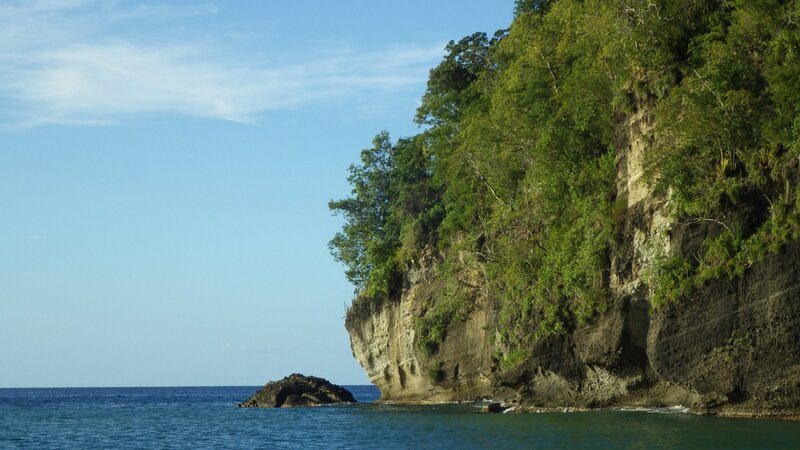 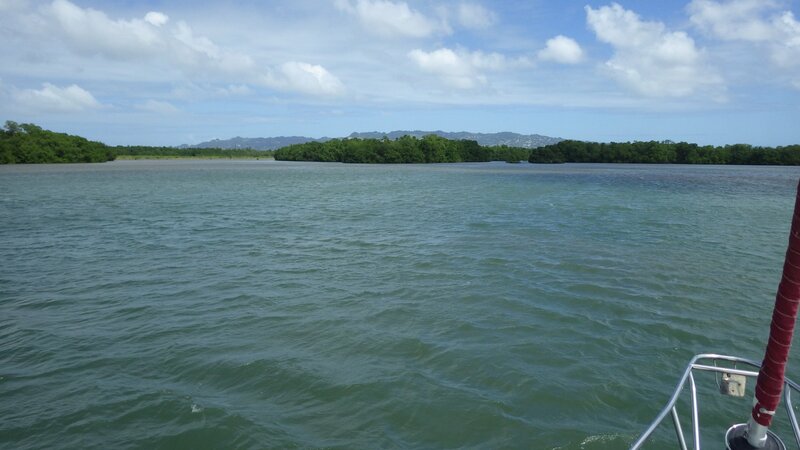 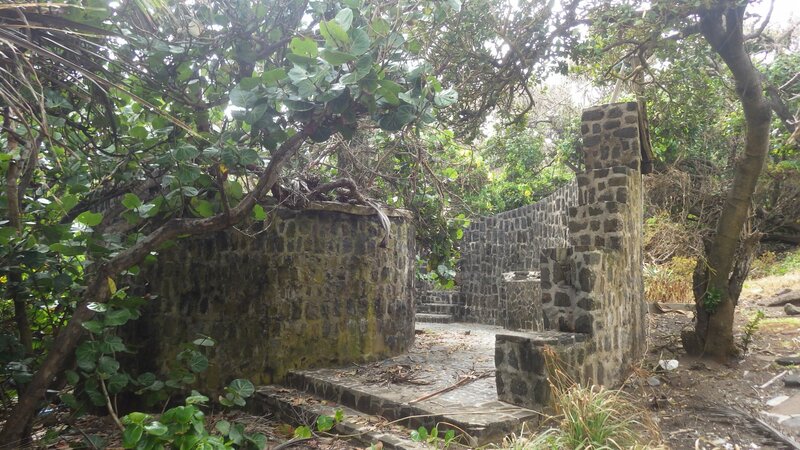 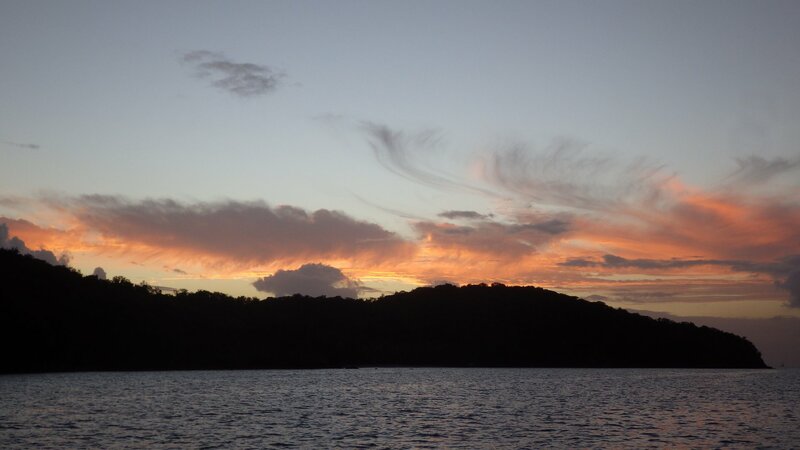 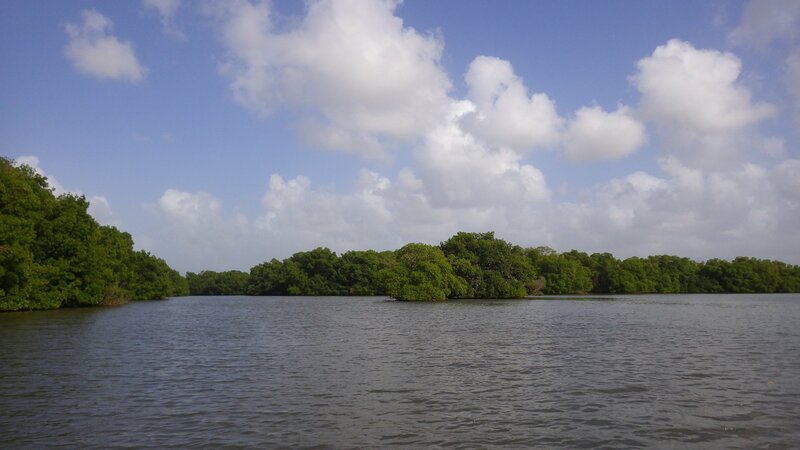 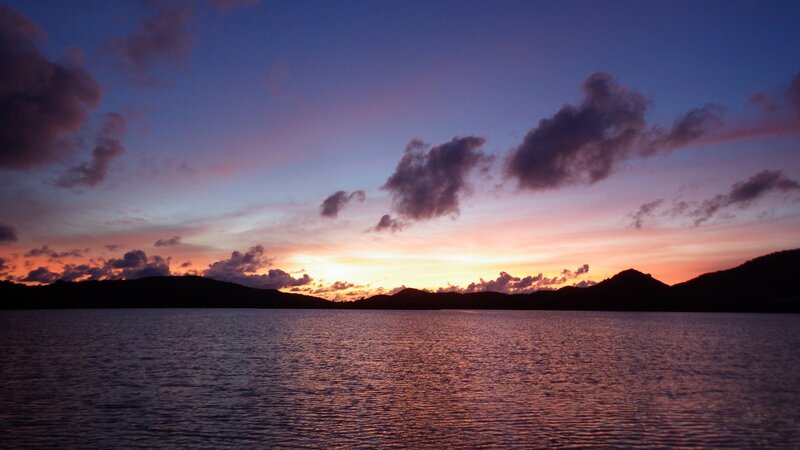 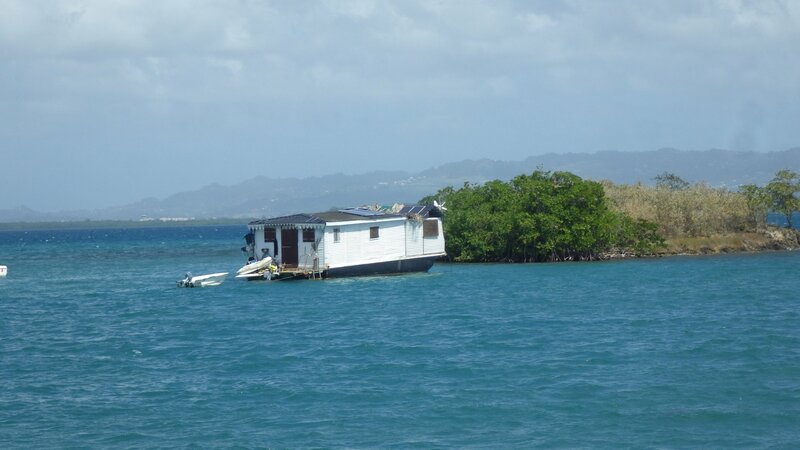 The island was man-made by the owner, from corals and conch shells. 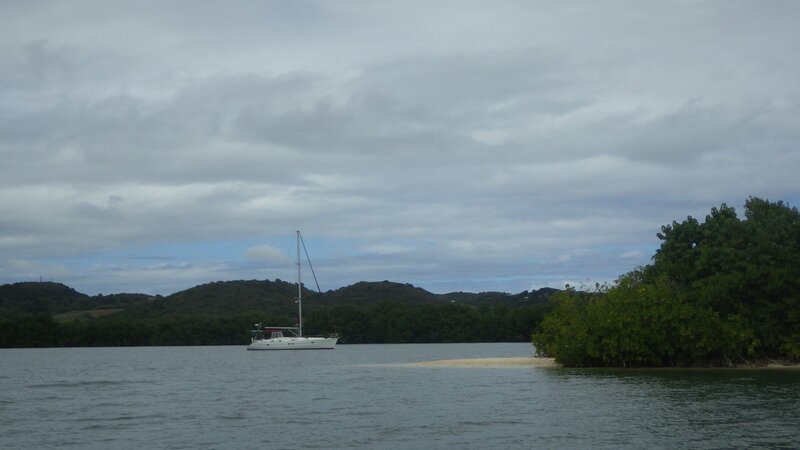 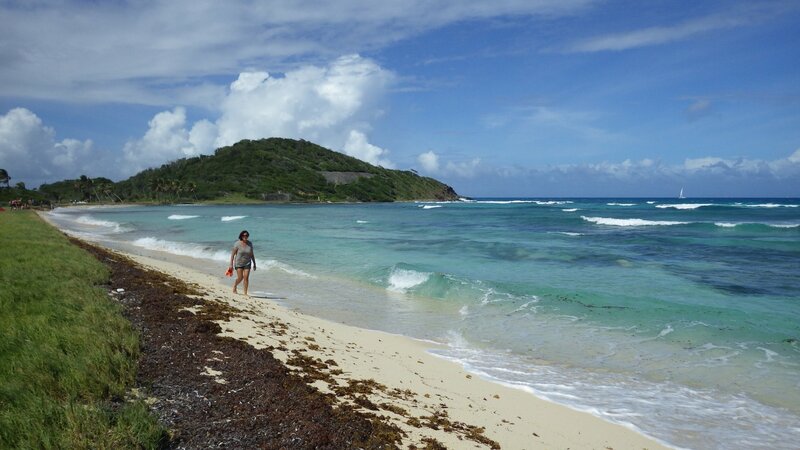 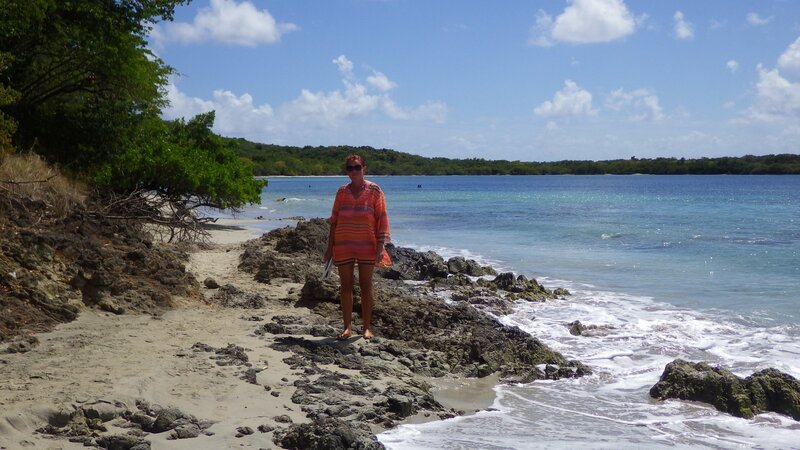 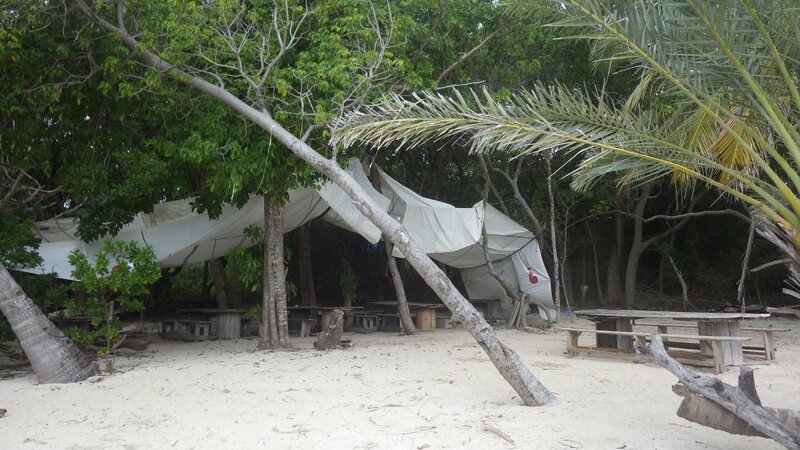 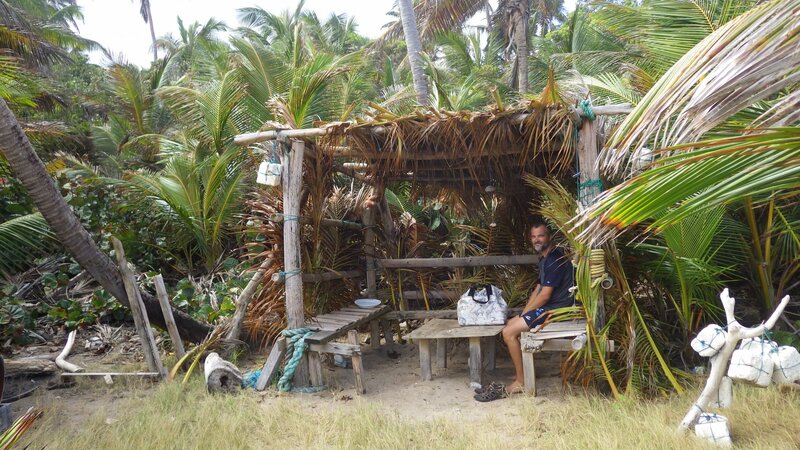 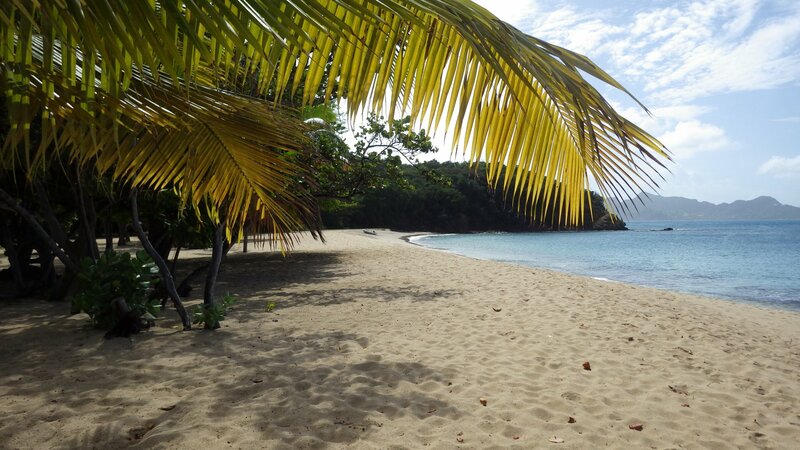 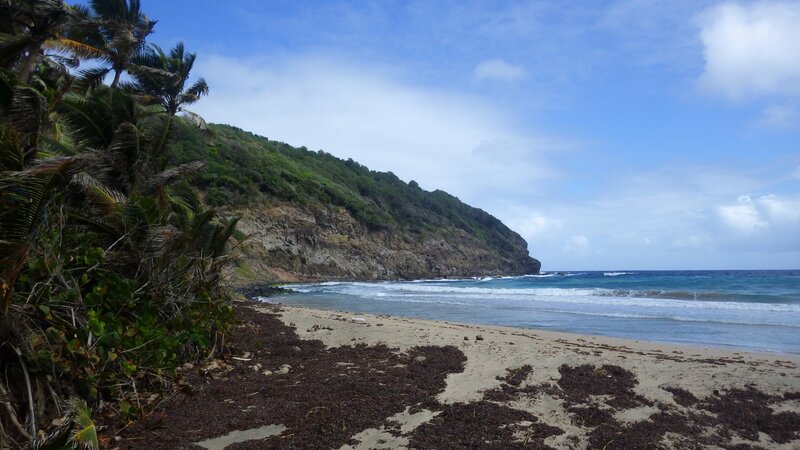 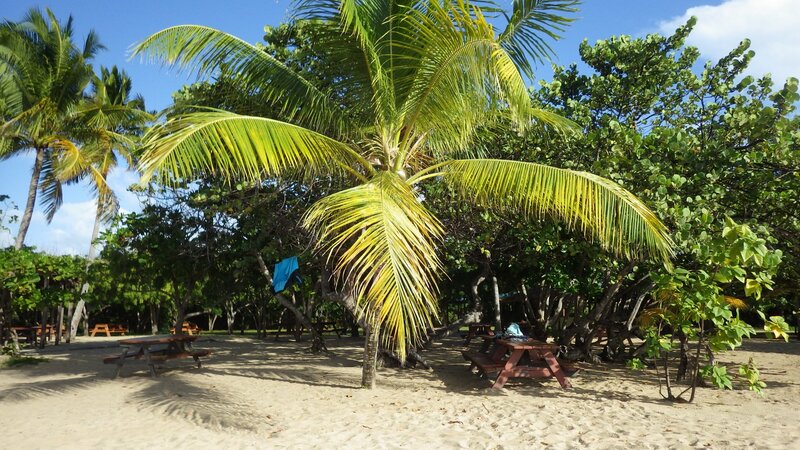 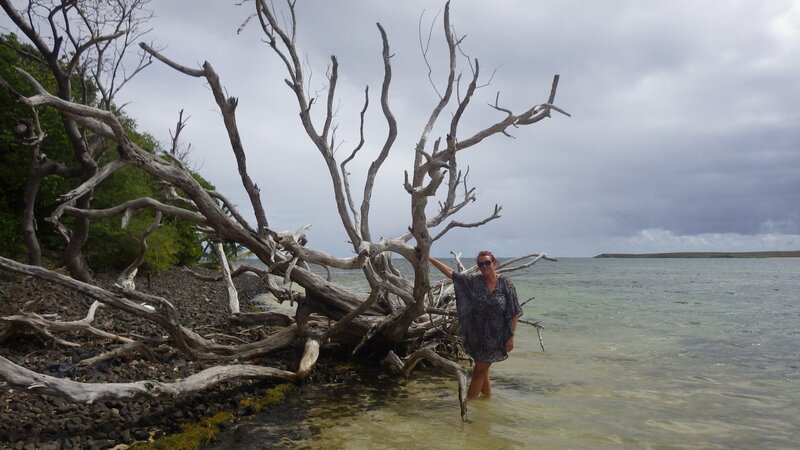 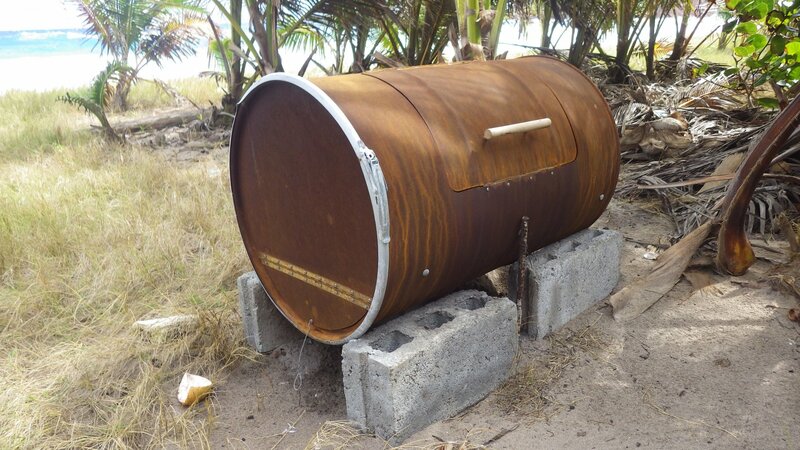 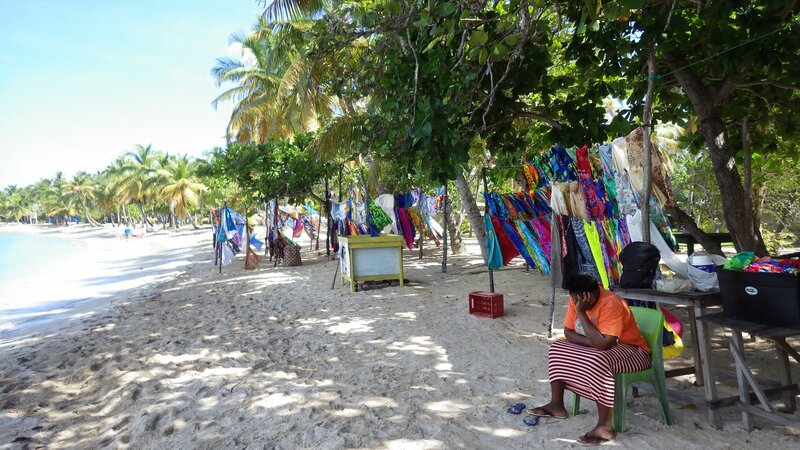 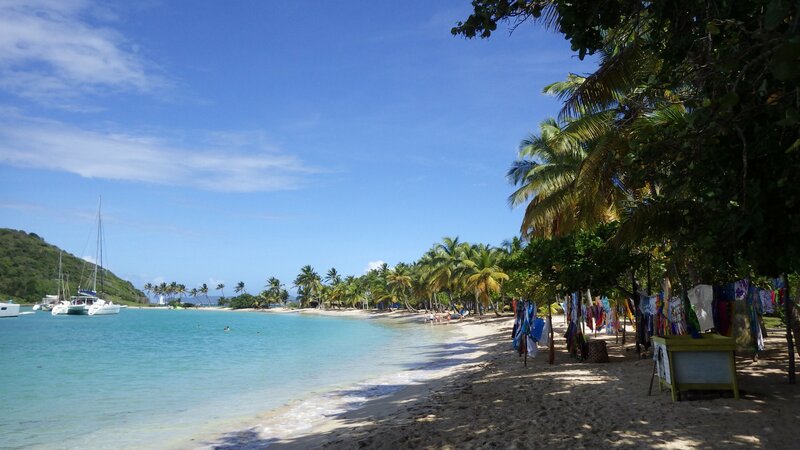 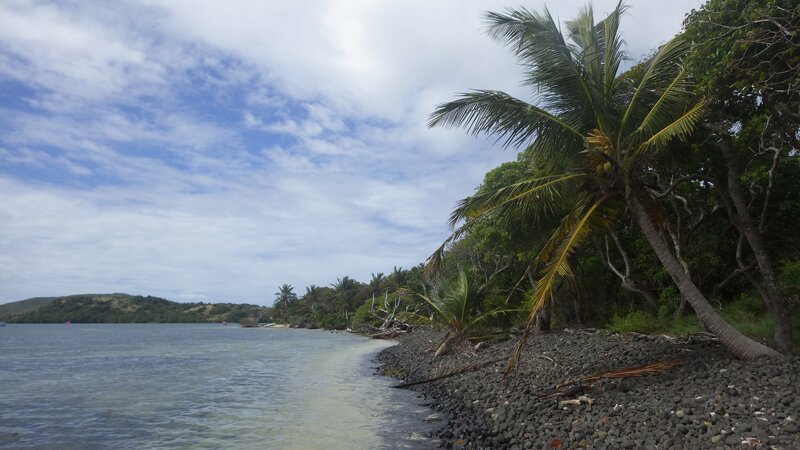 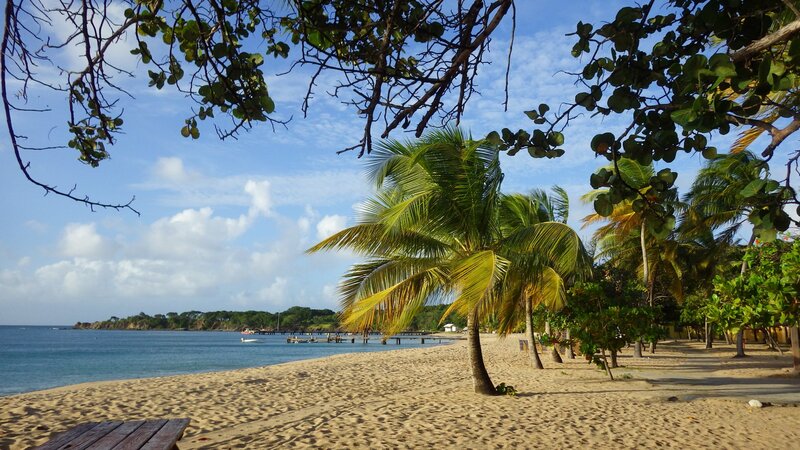 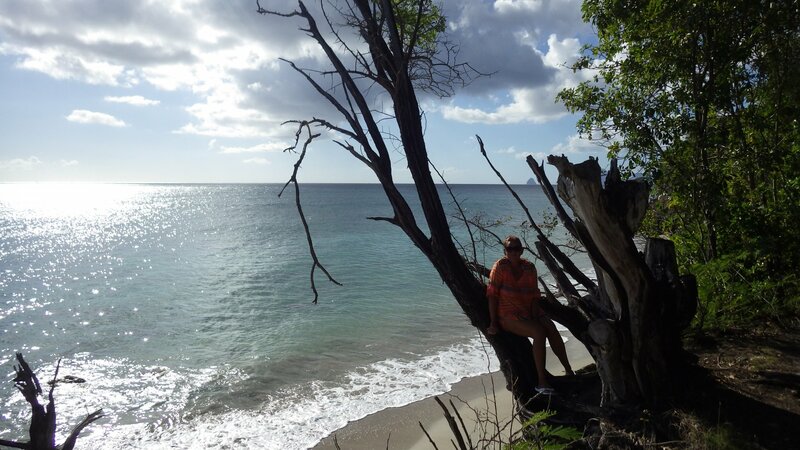 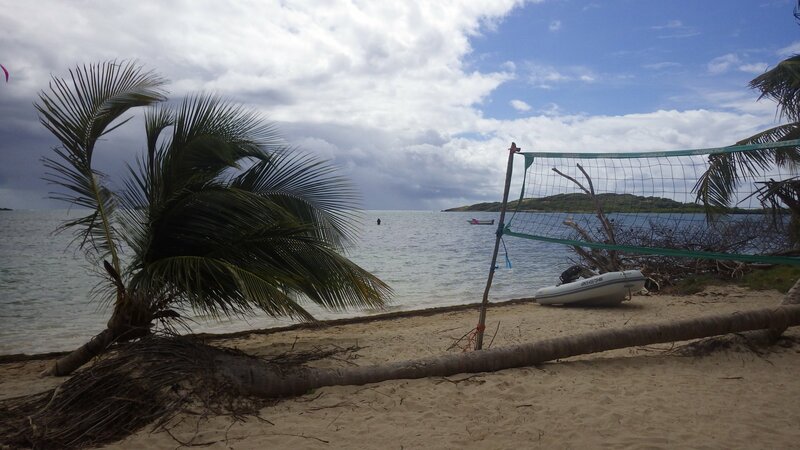 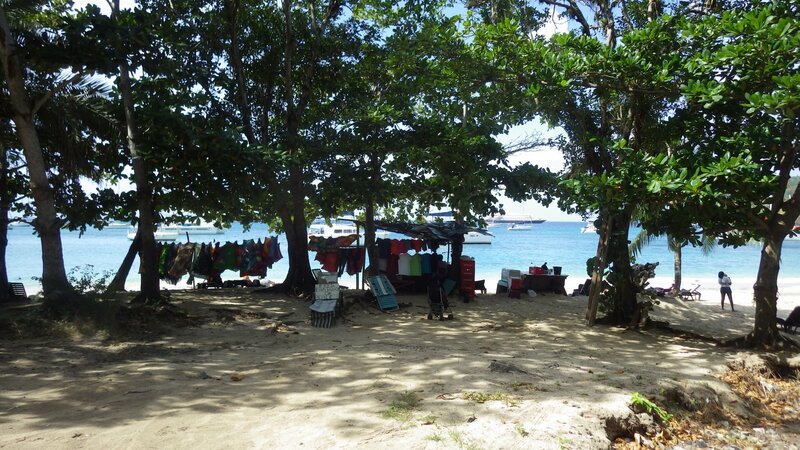 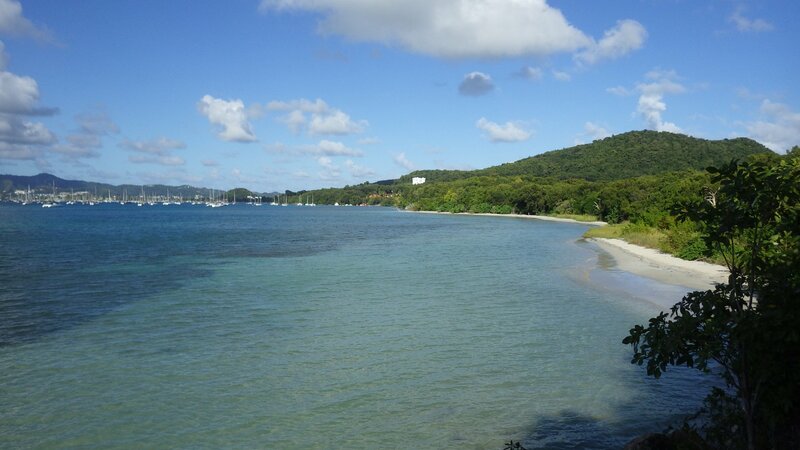 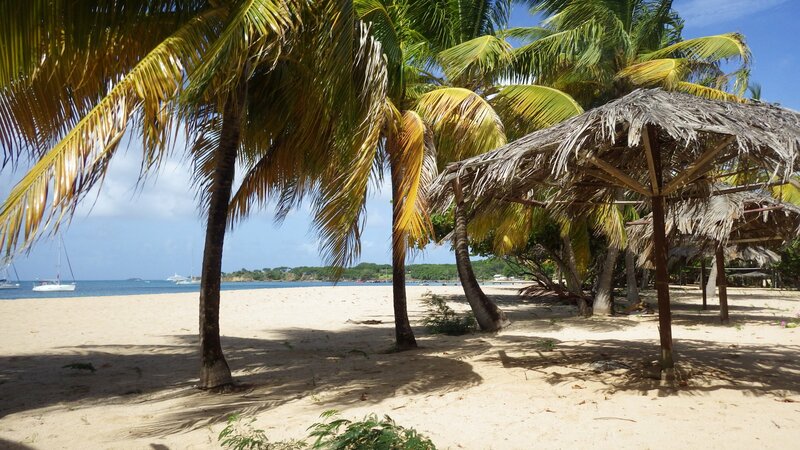 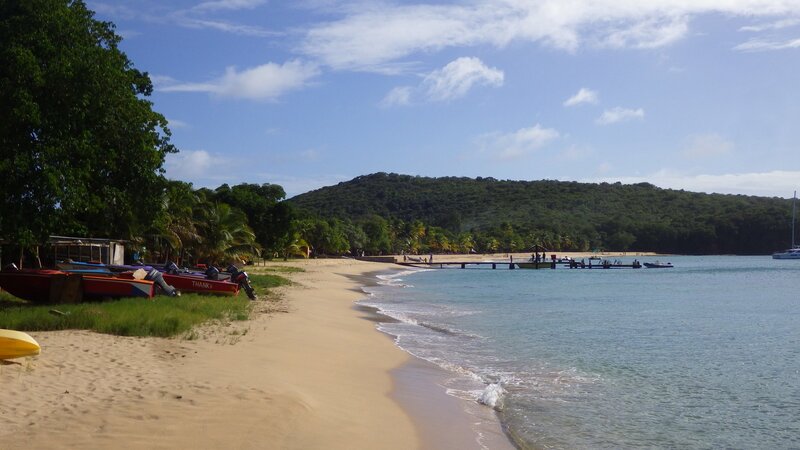 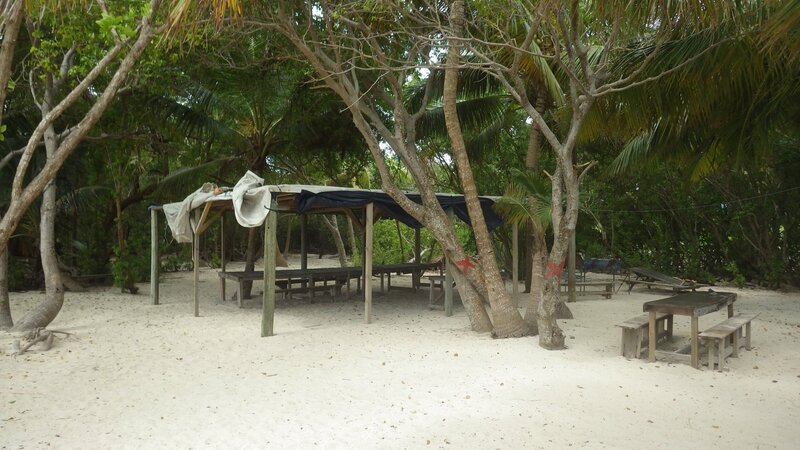 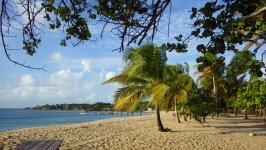 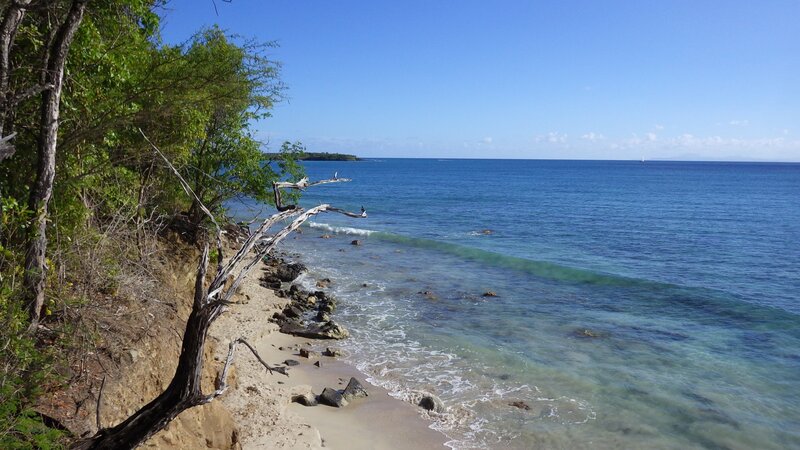 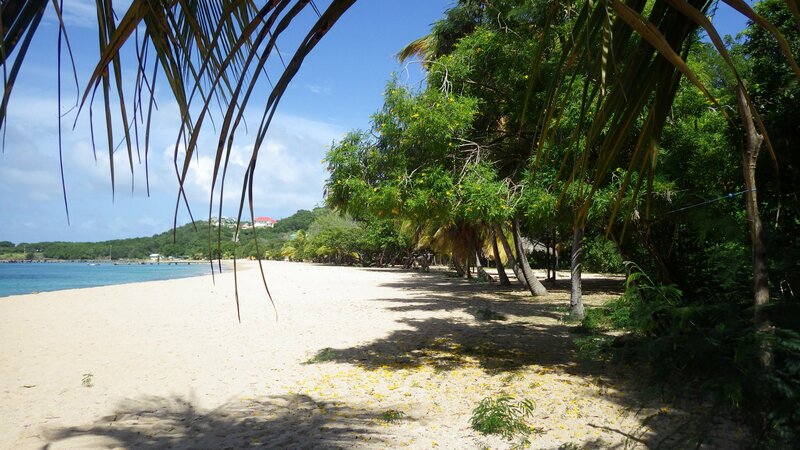 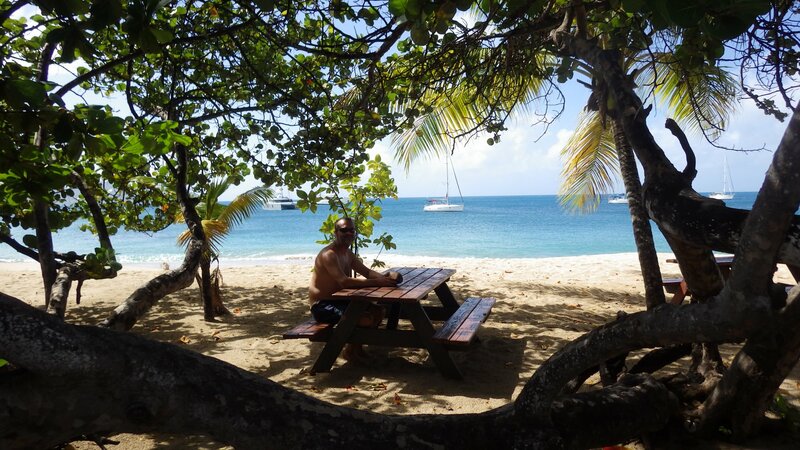 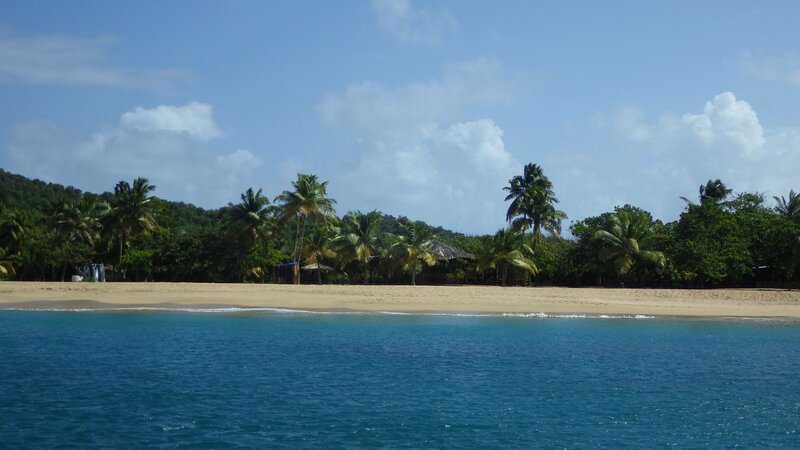 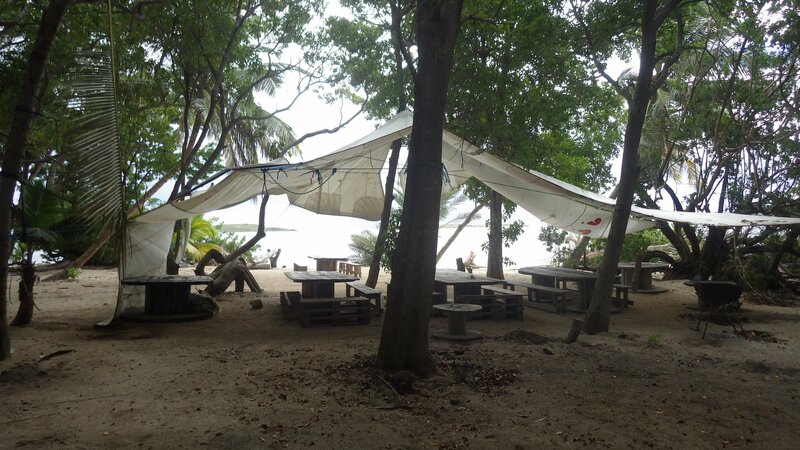 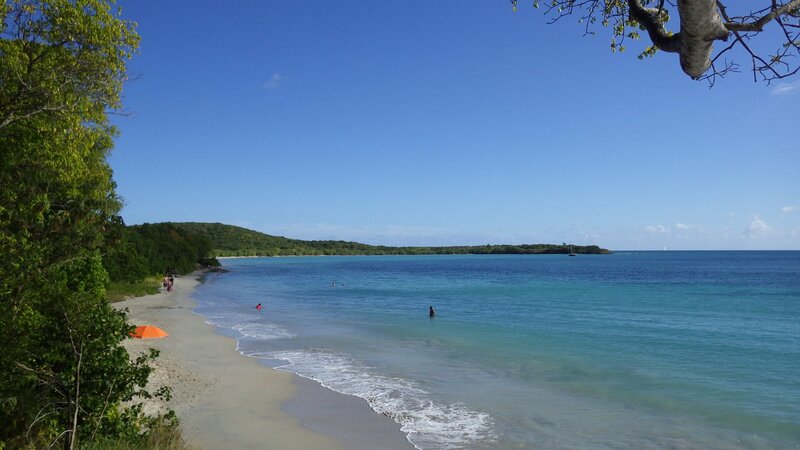 In Grenadines, we really liked the beach in Saline Bay, Mayreau. 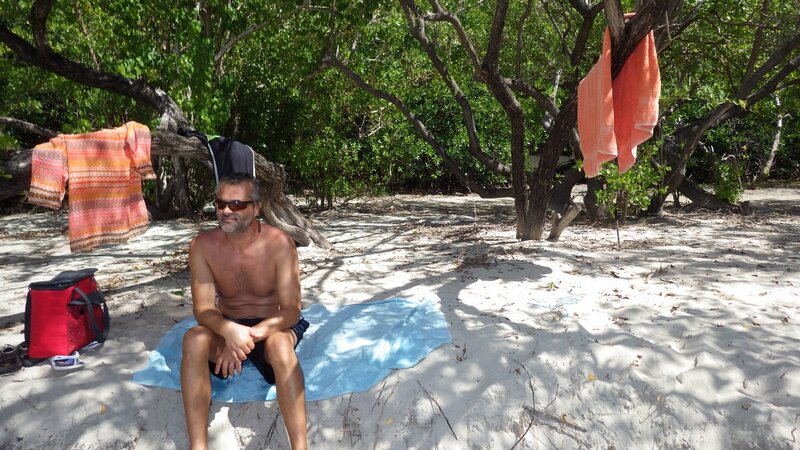 Back in June, in low season, the place was quiet, with calm seas and virtually no visitors. 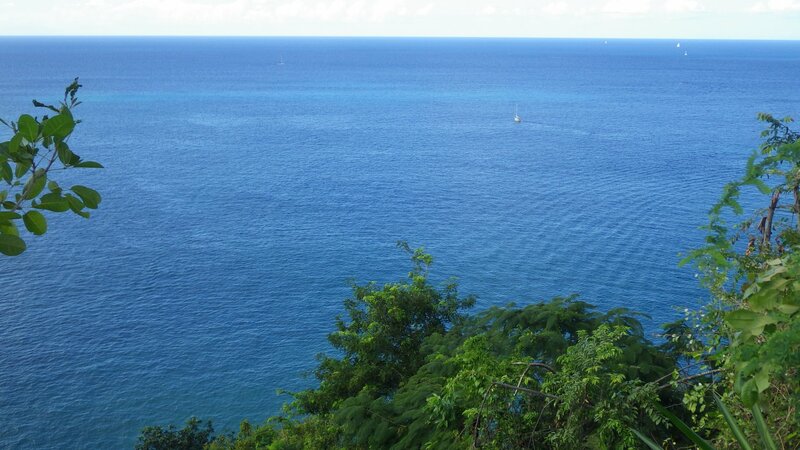 This time, we are here in high season. 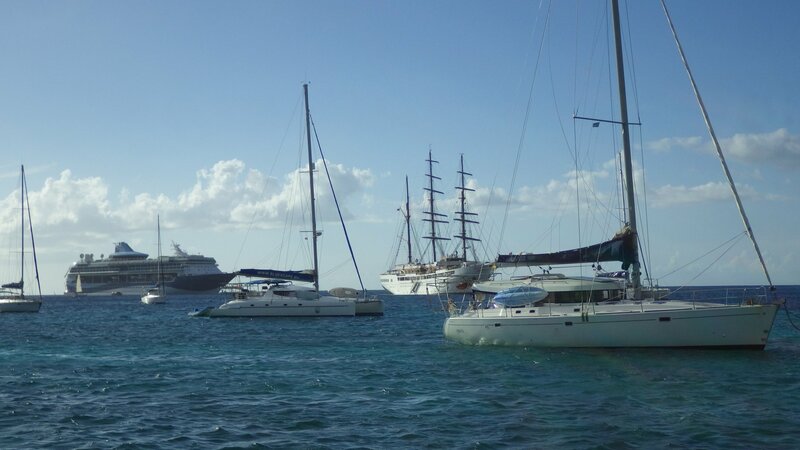 There are quite few boats at anchor, and over the week of our stay here, we had only two days when there were no crowds brought by the cruiseships. 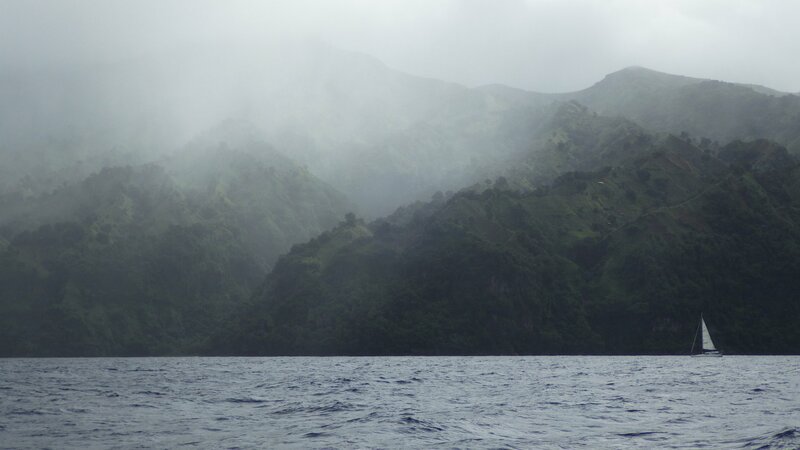 Also, the north swell at the tome made it somewhat uncomfortable. 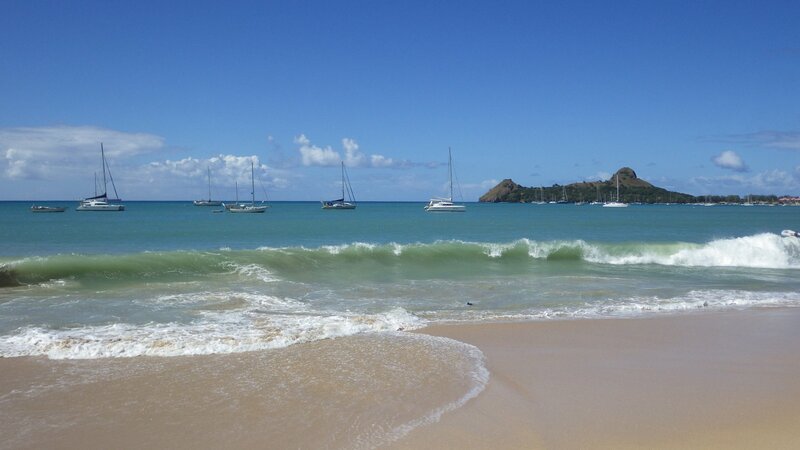 Nevertheless, we've managed to have quite decent Christmas Holidays there. 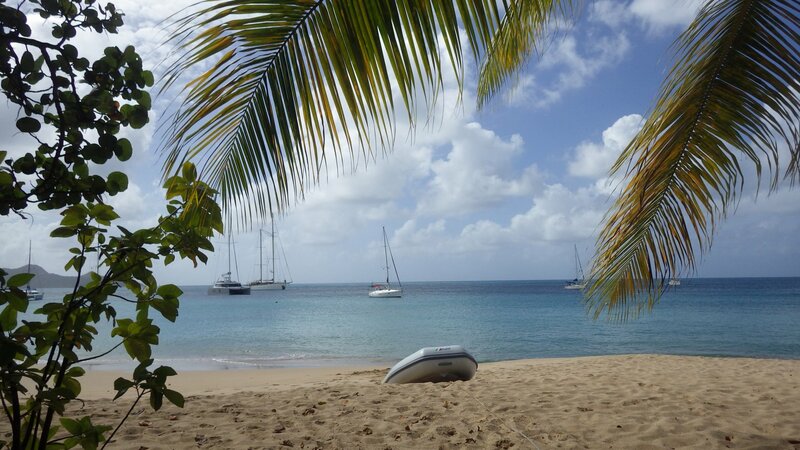 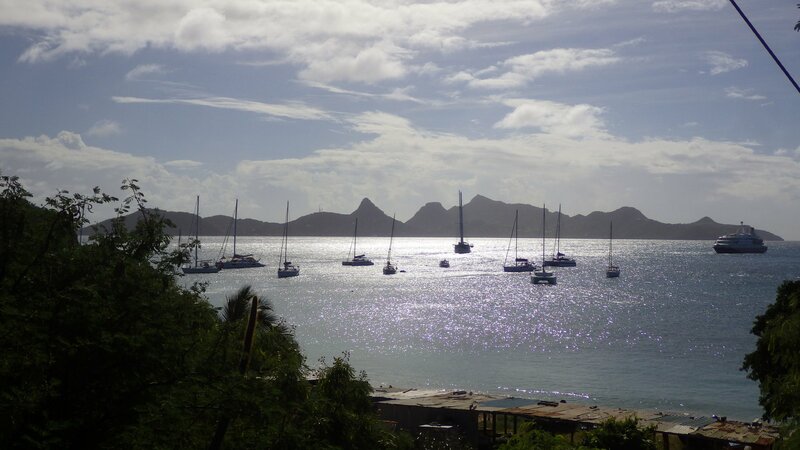 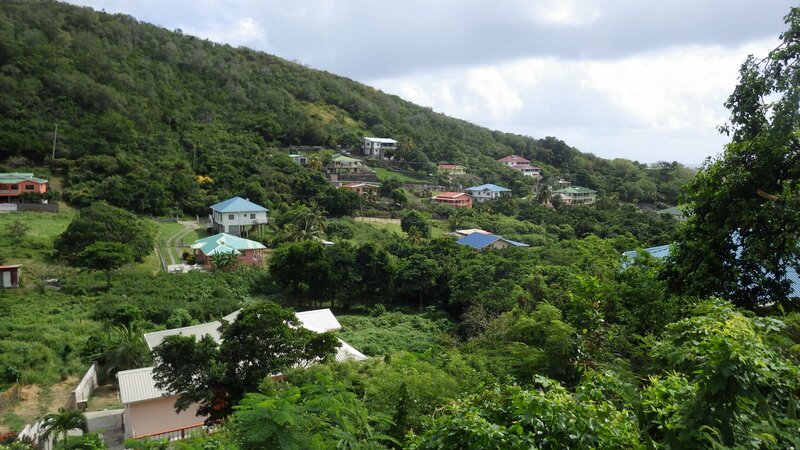 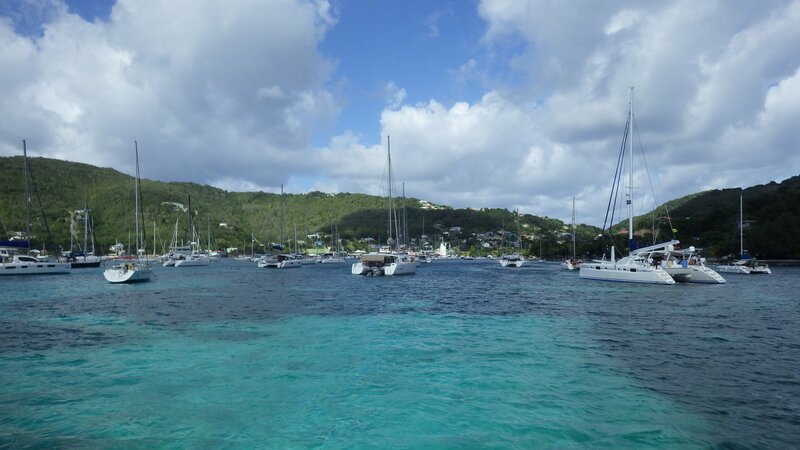 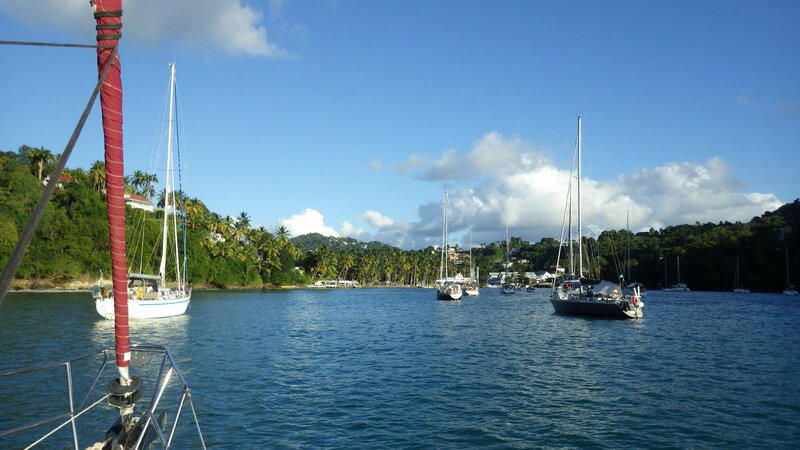 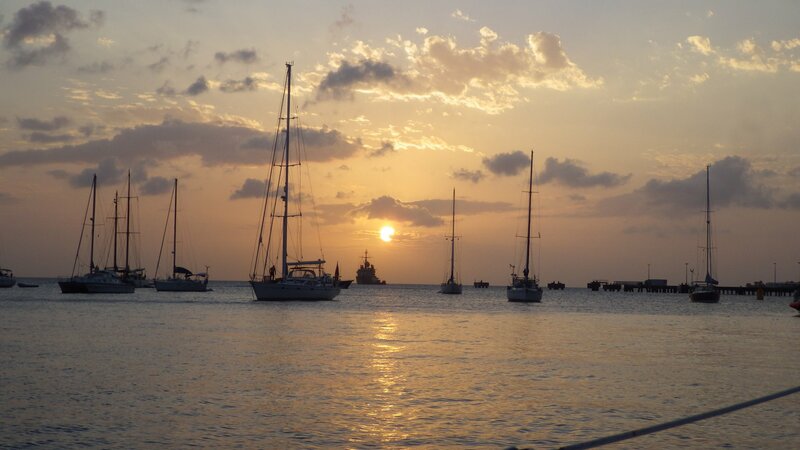 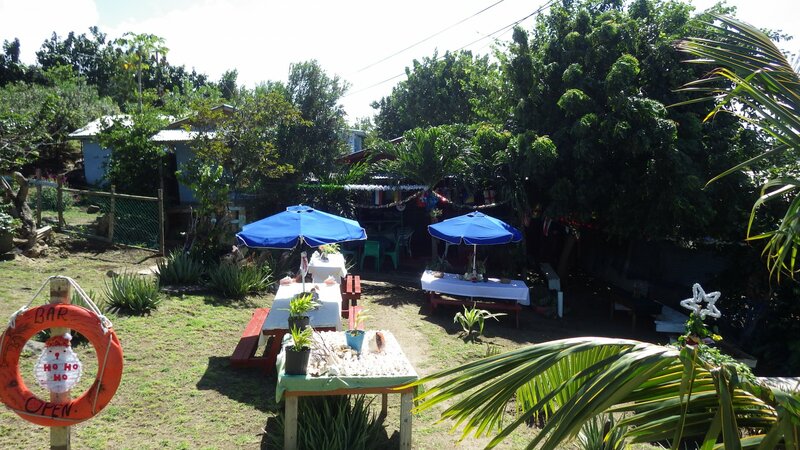 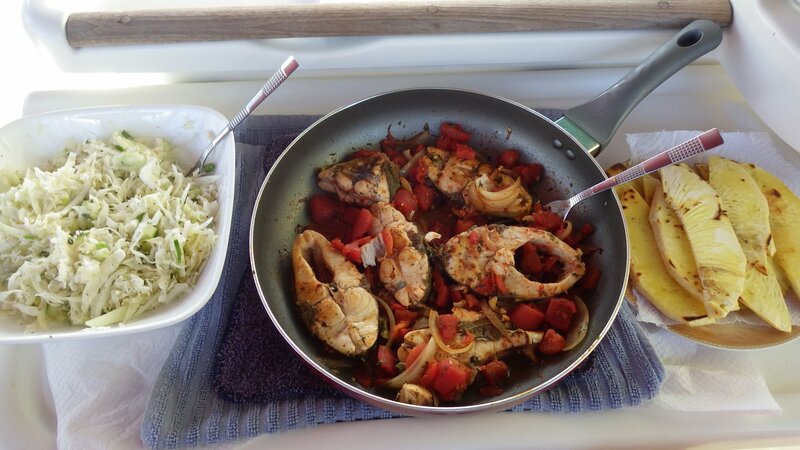 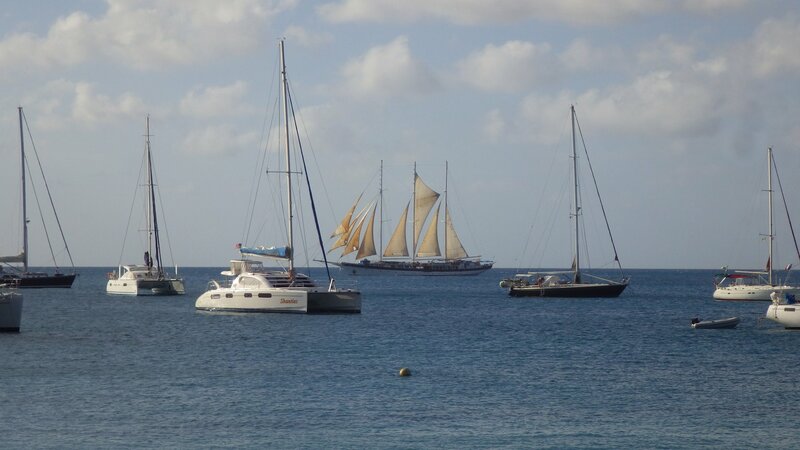 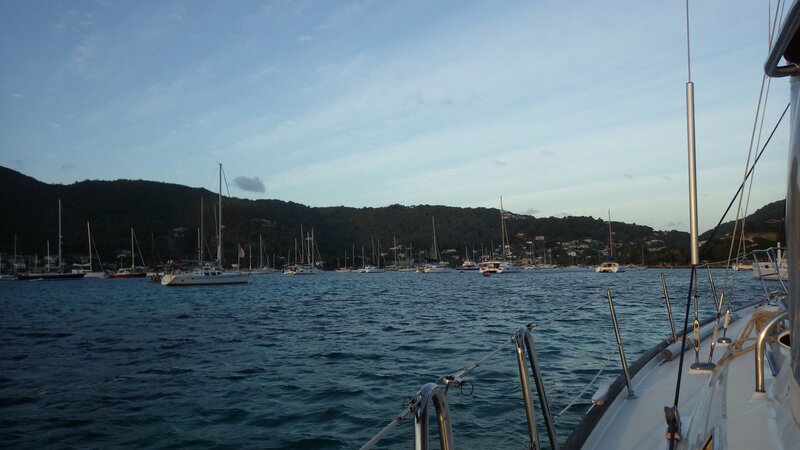 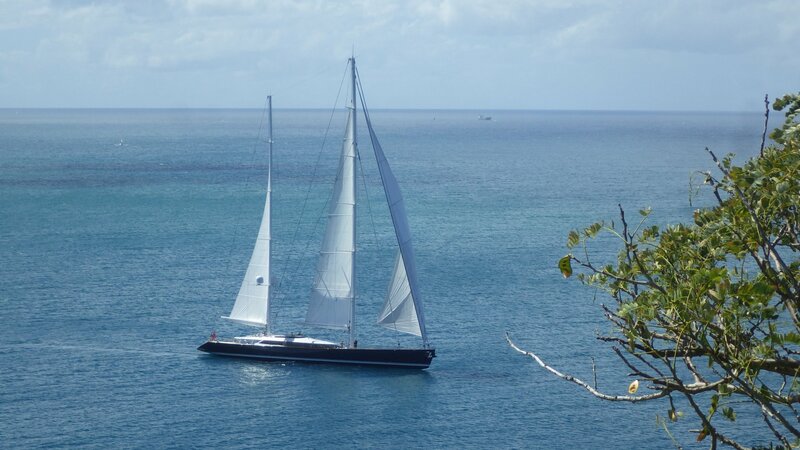 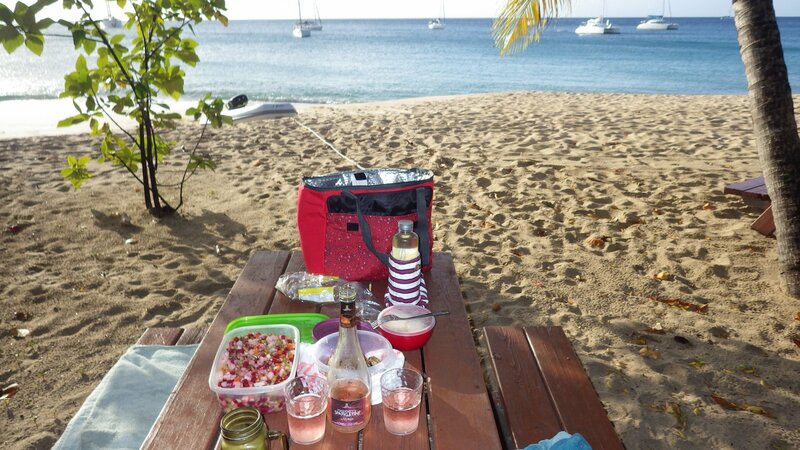 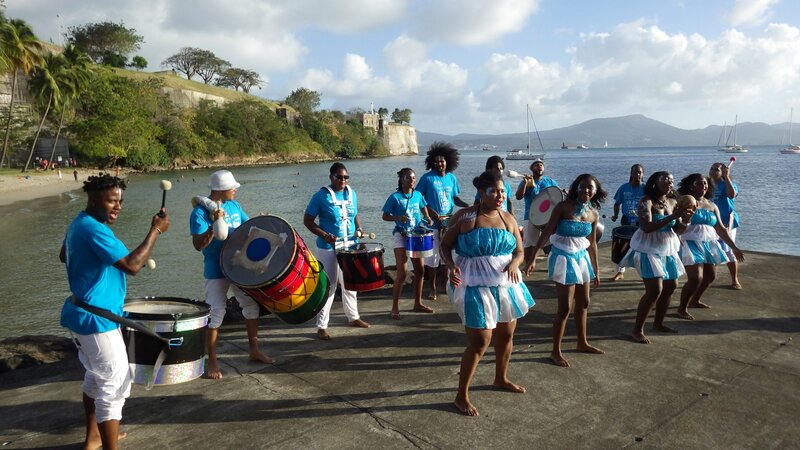 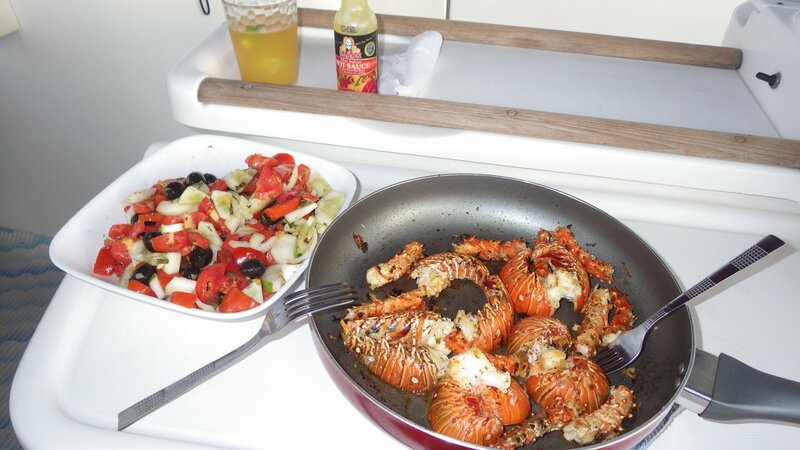 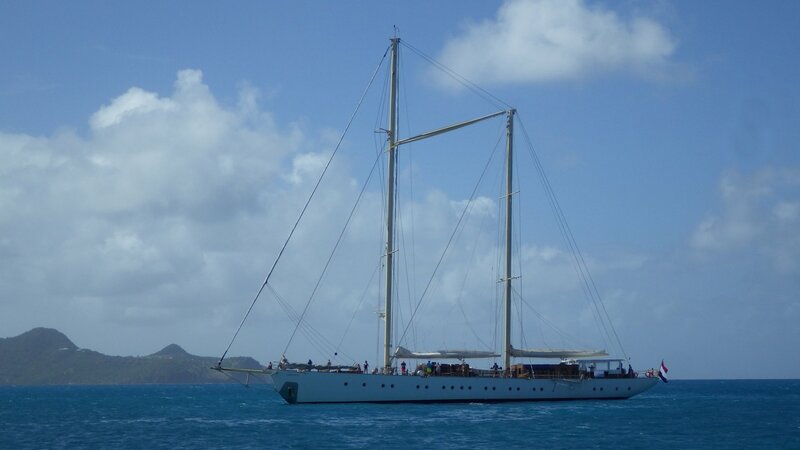 New Year we celebrated in Bequia. 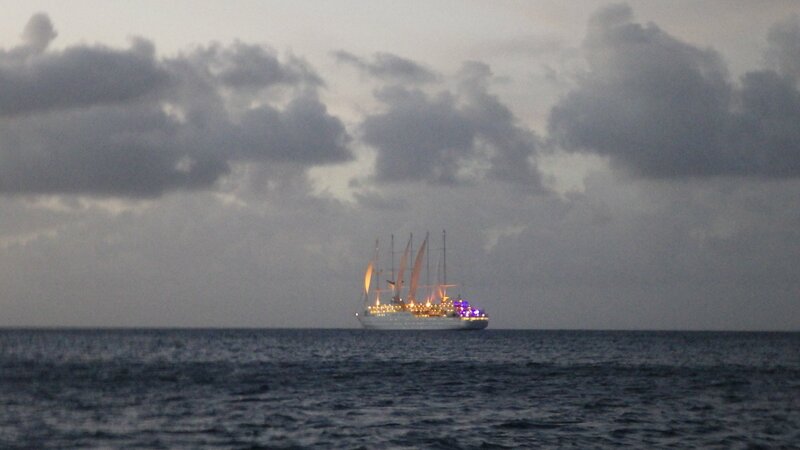 The fireworks were quite spectacular, rivaling some we've seen back home in Canada. 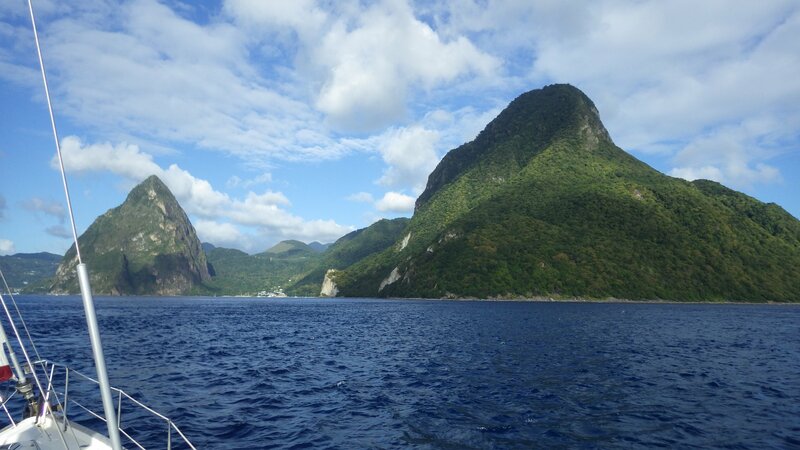 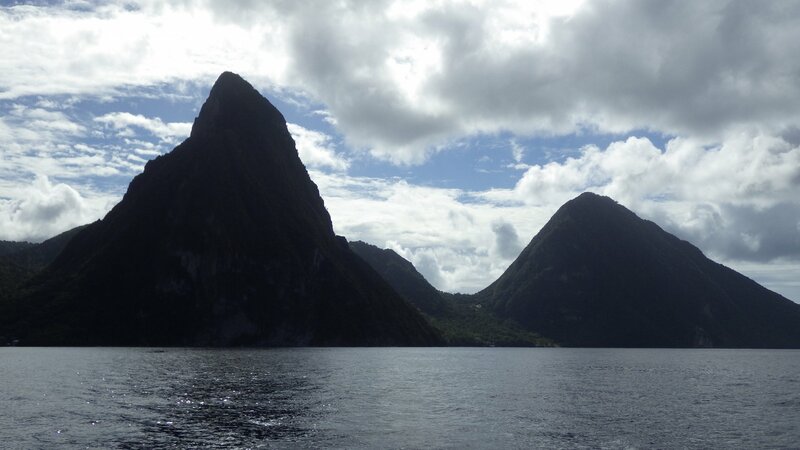 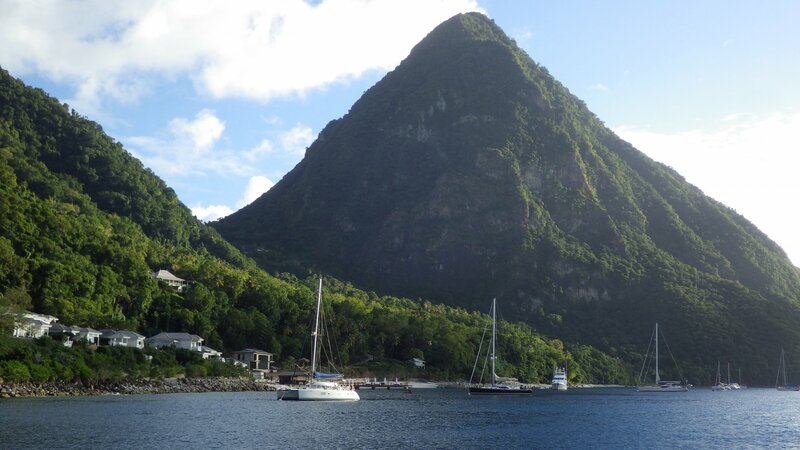 The St Lucia's Pitons is one of the magnificent sights in Caribbean. 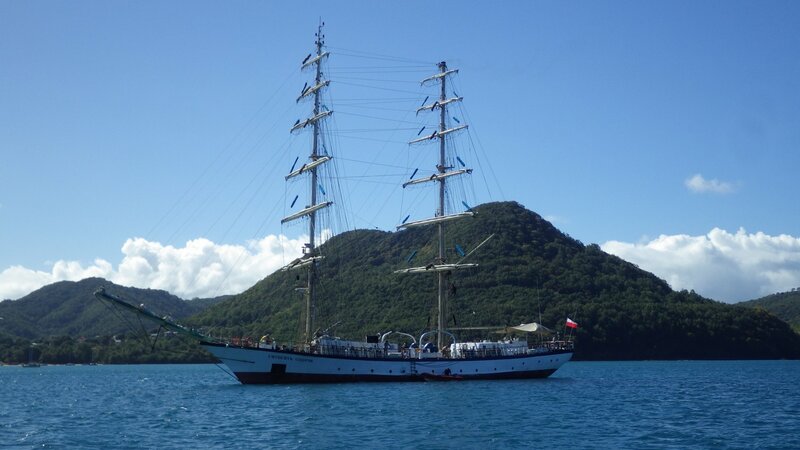 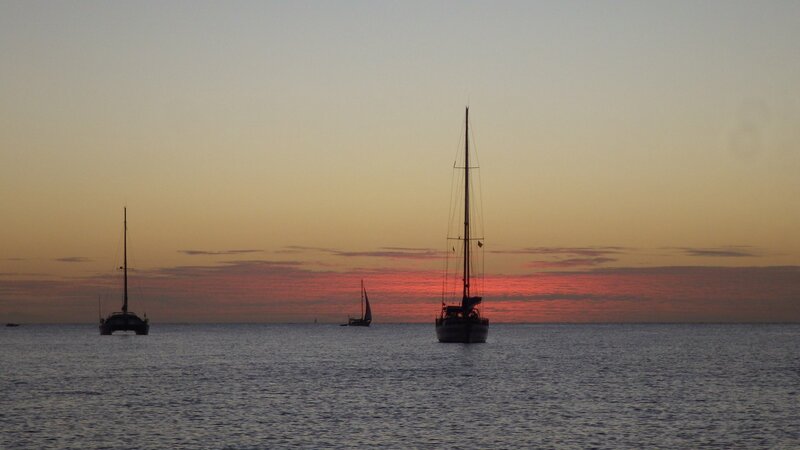 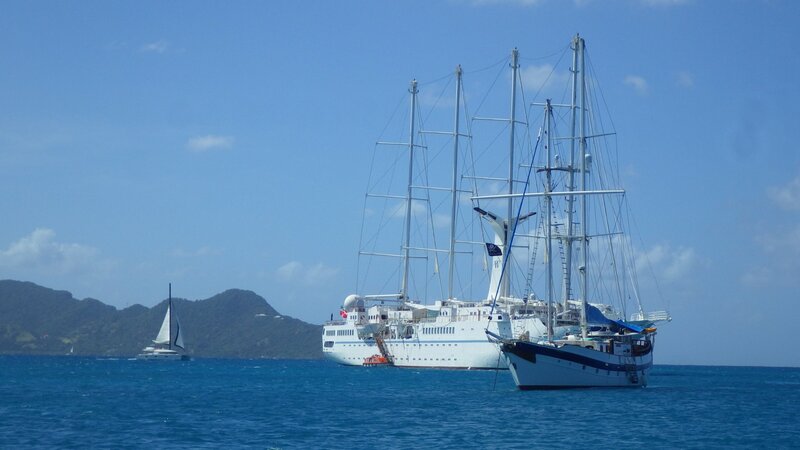 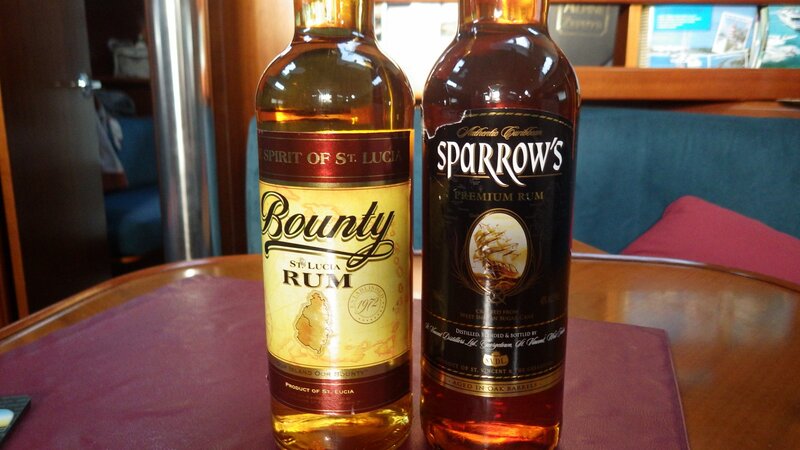 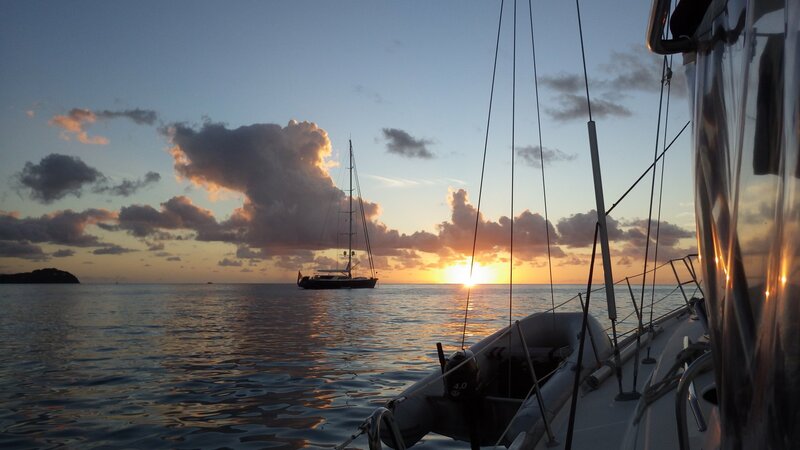 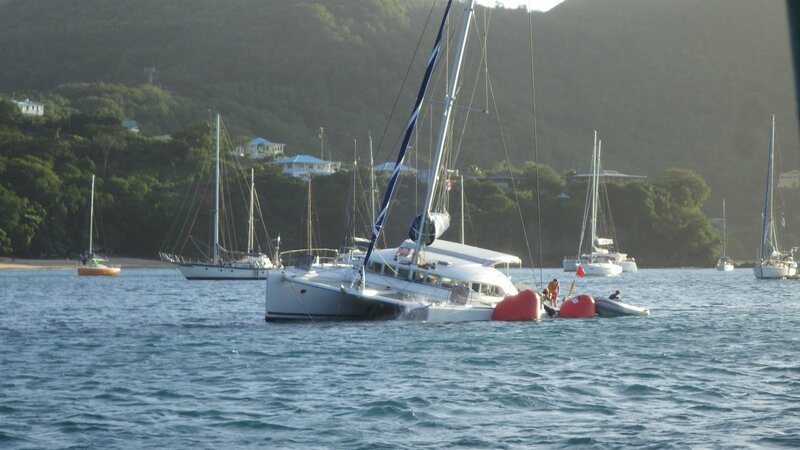 Being at anchor (mooring ball) between them gives a special feeling. 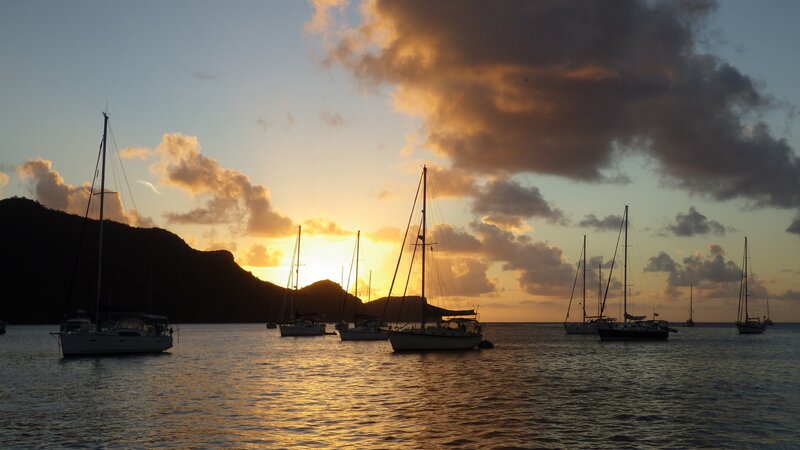 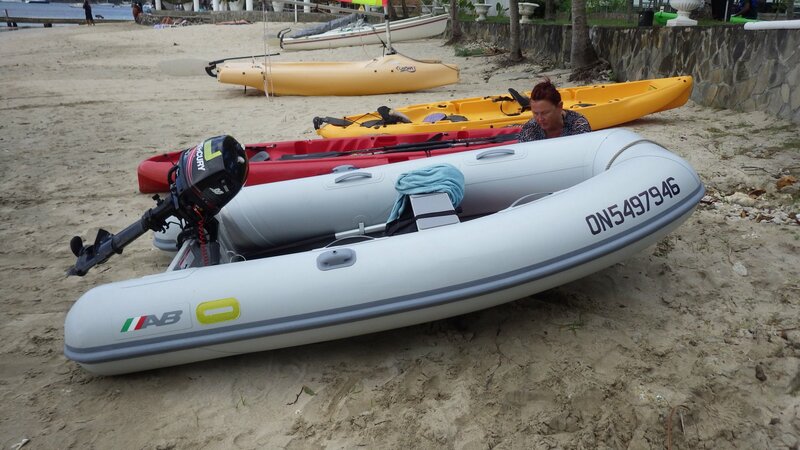 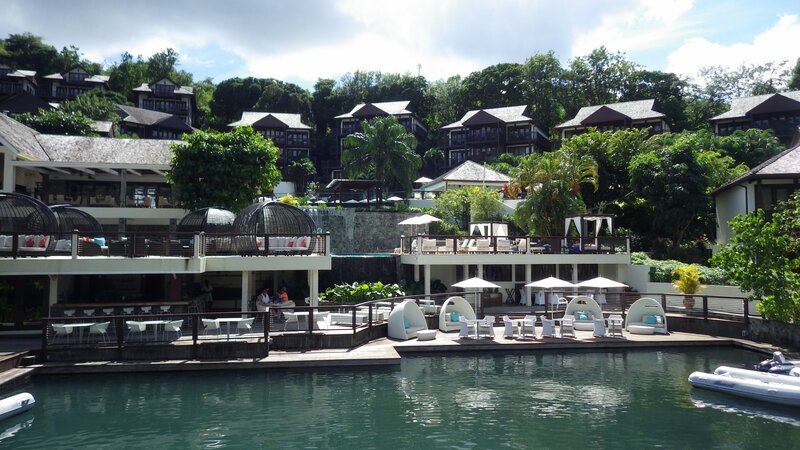 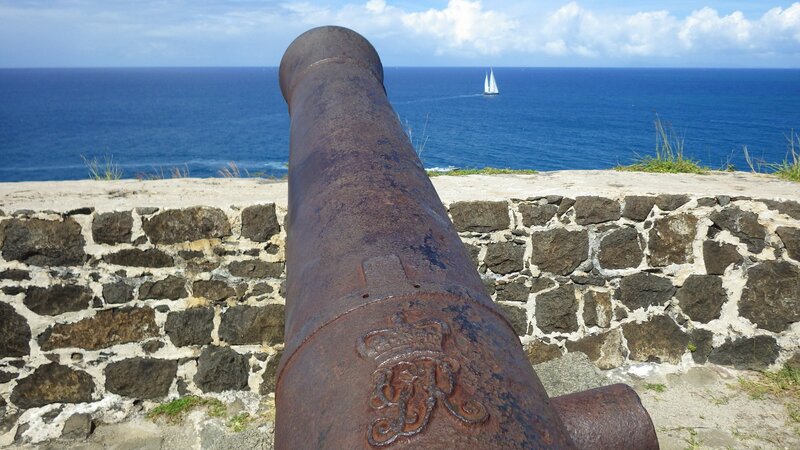 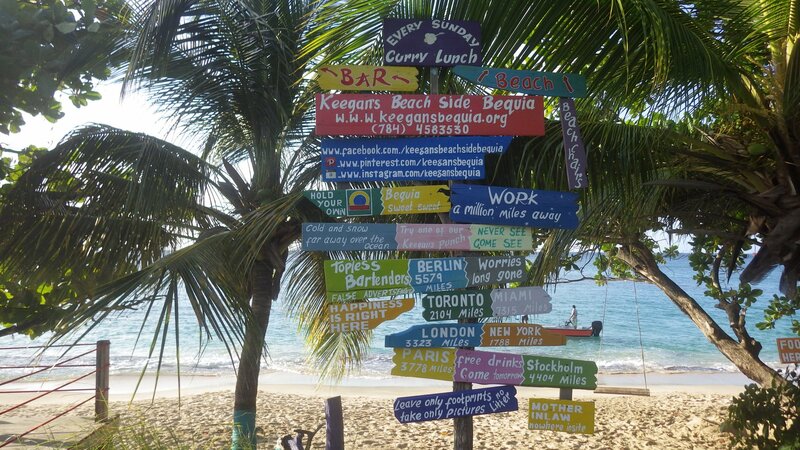 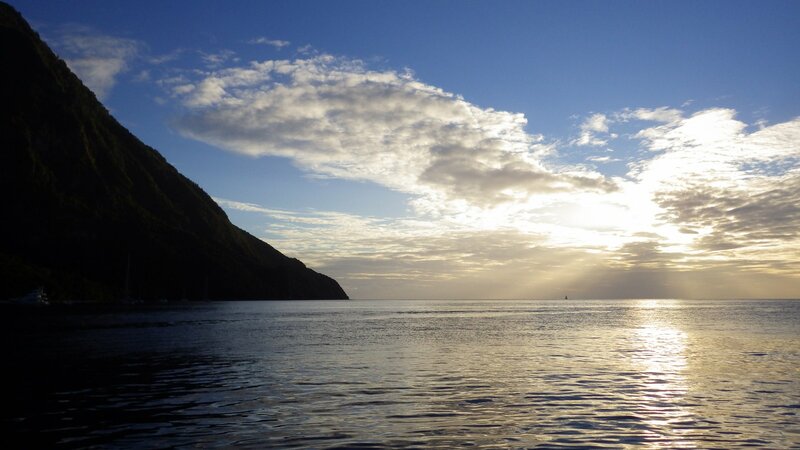 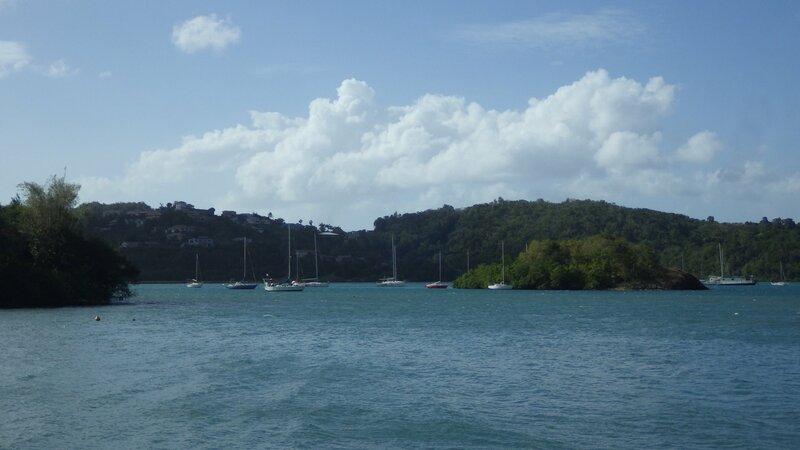 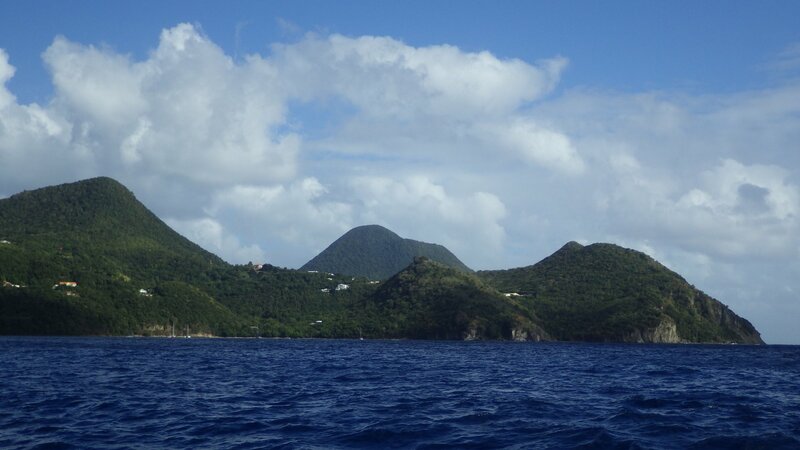 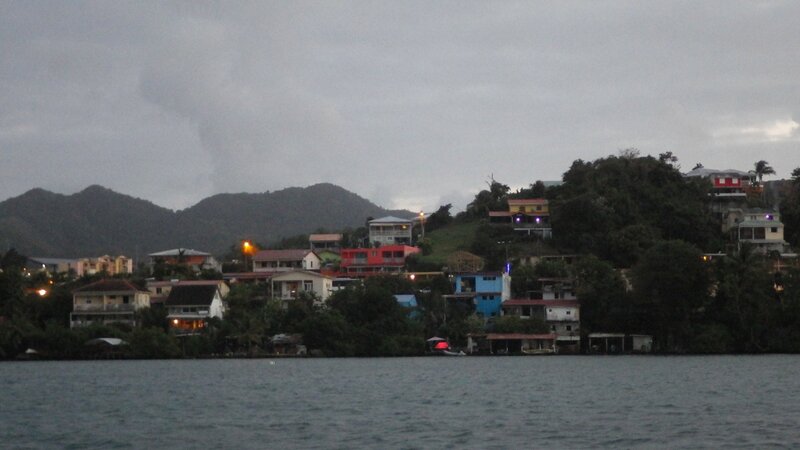 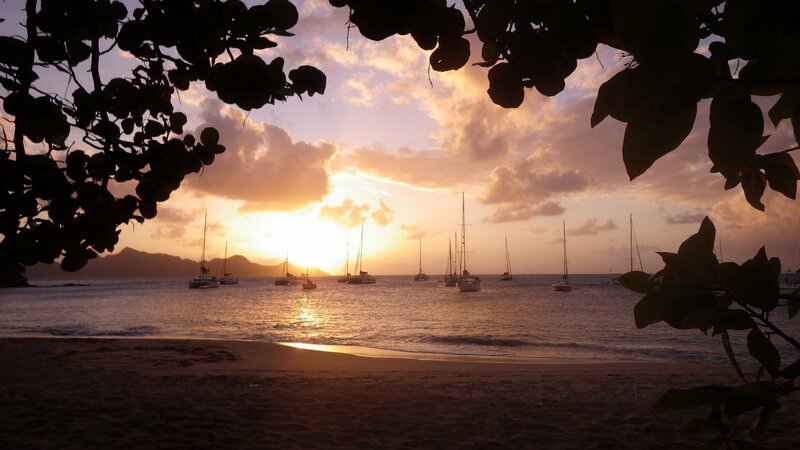 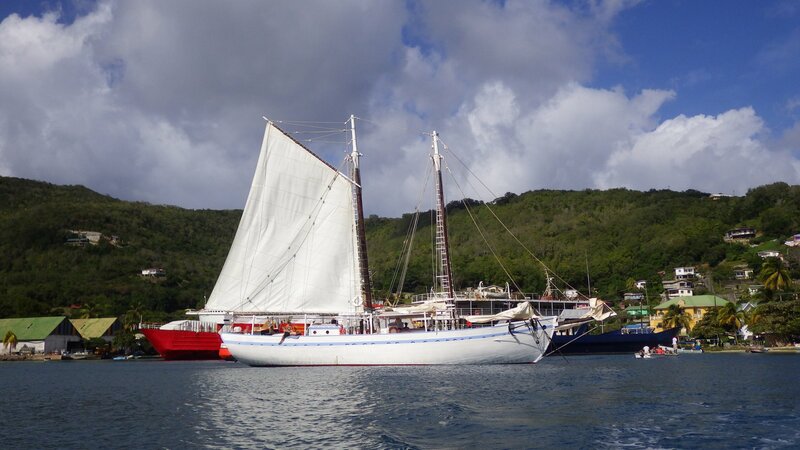 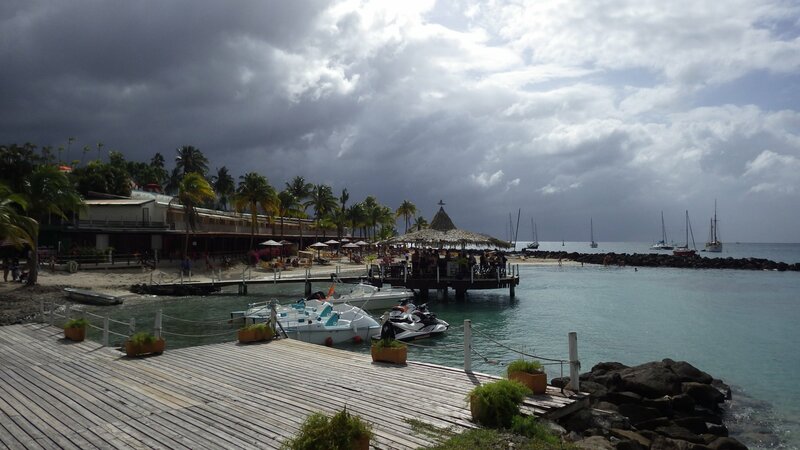 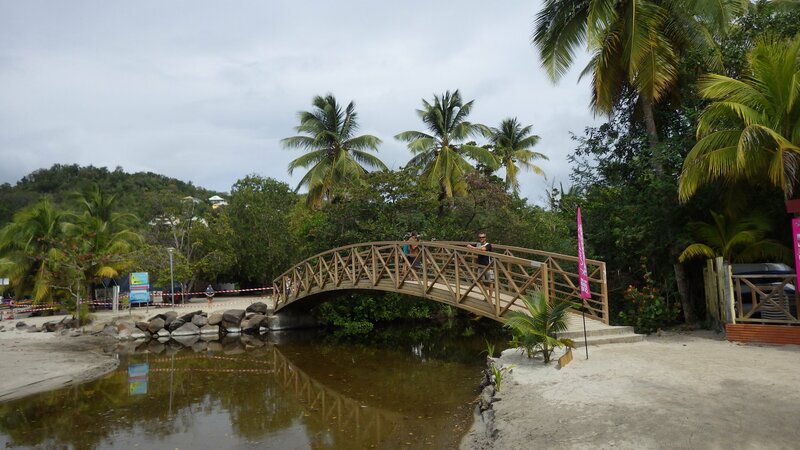 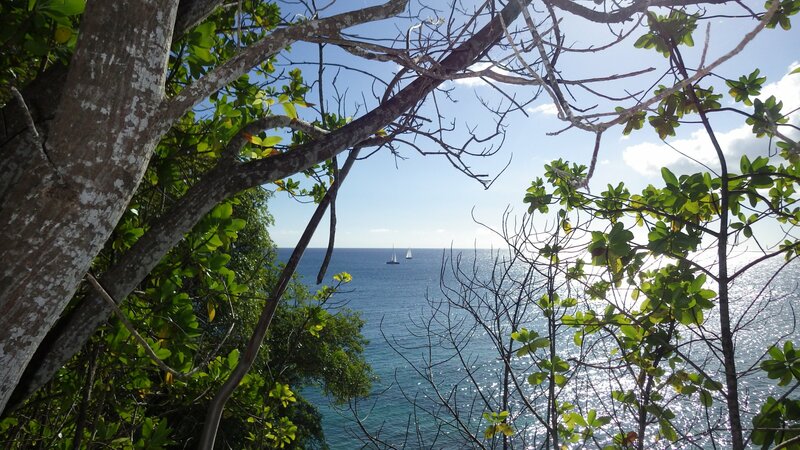 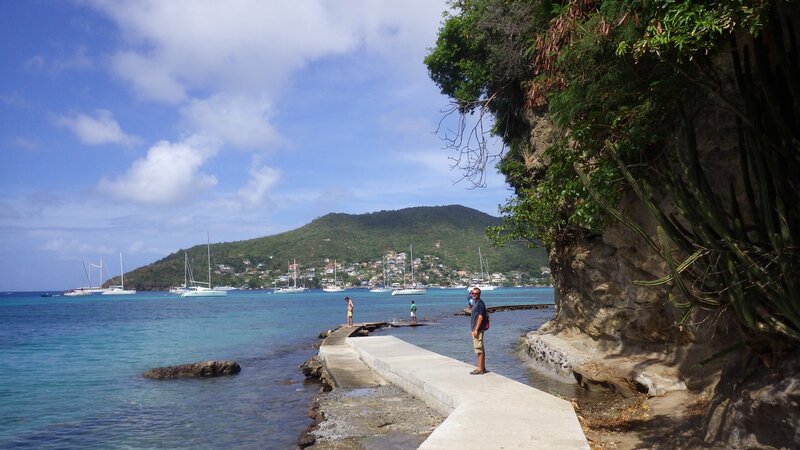 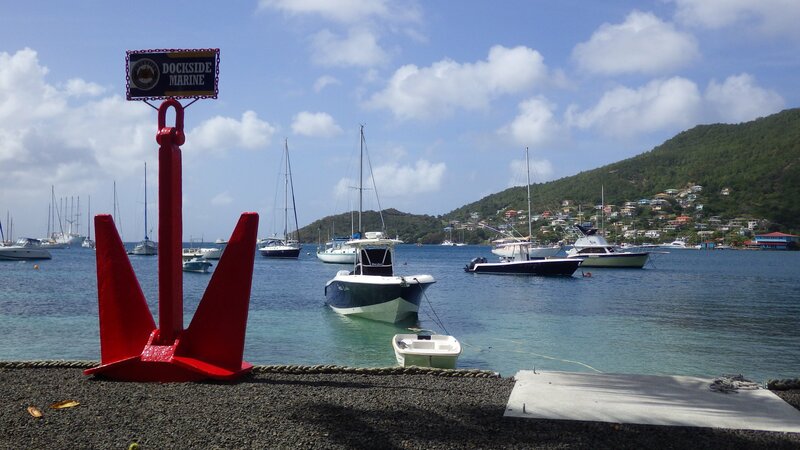 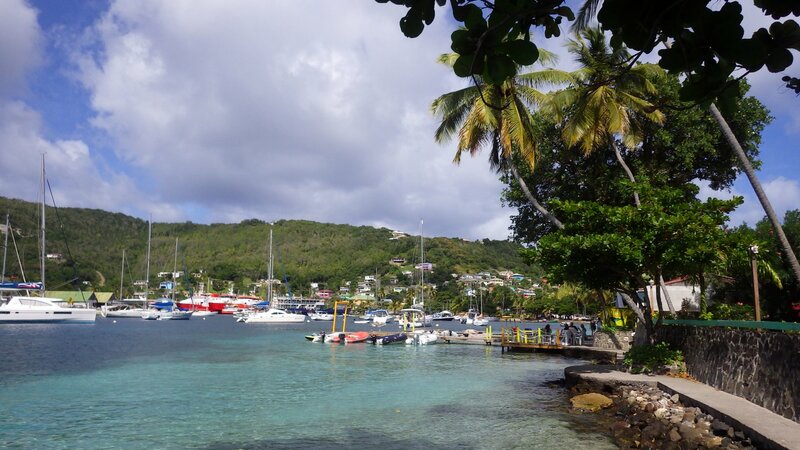 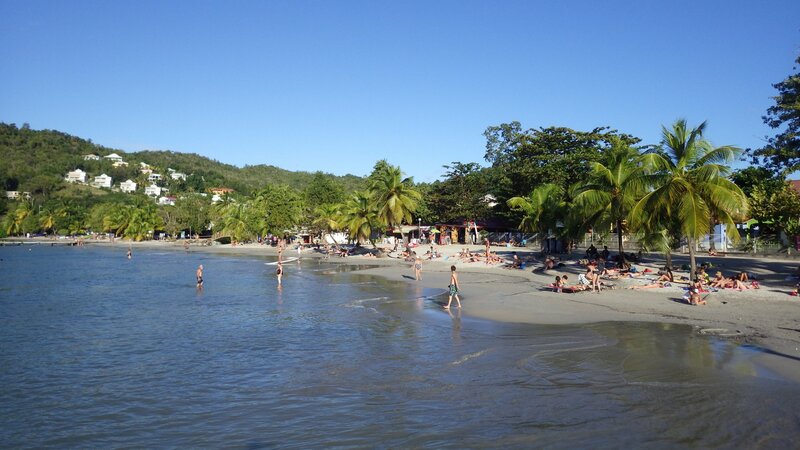 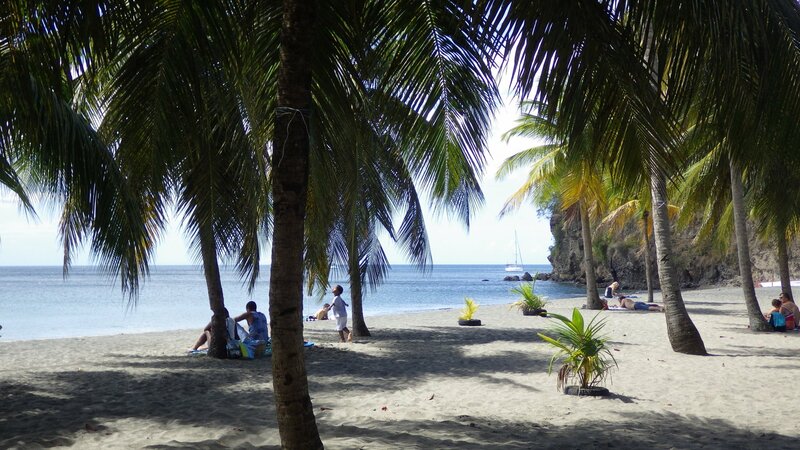 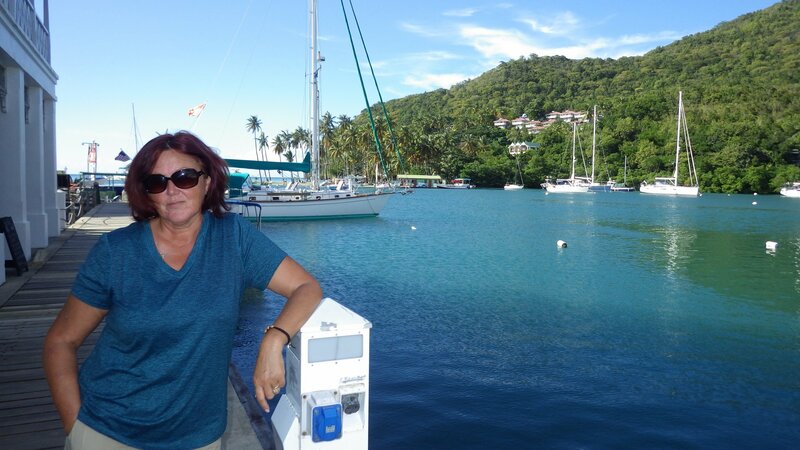 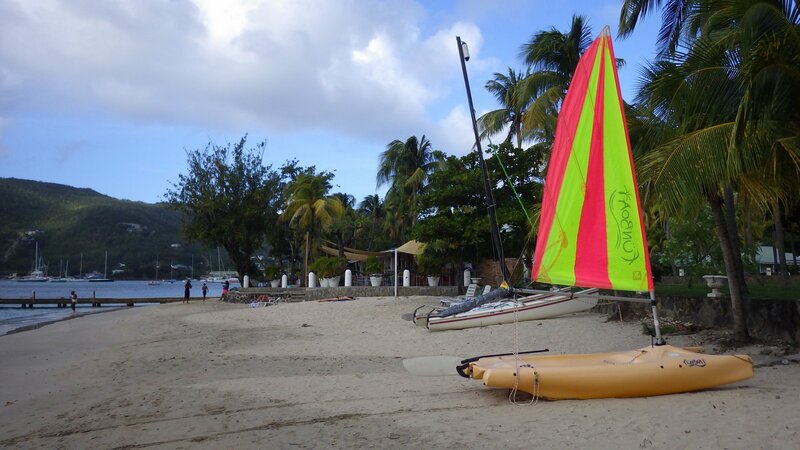 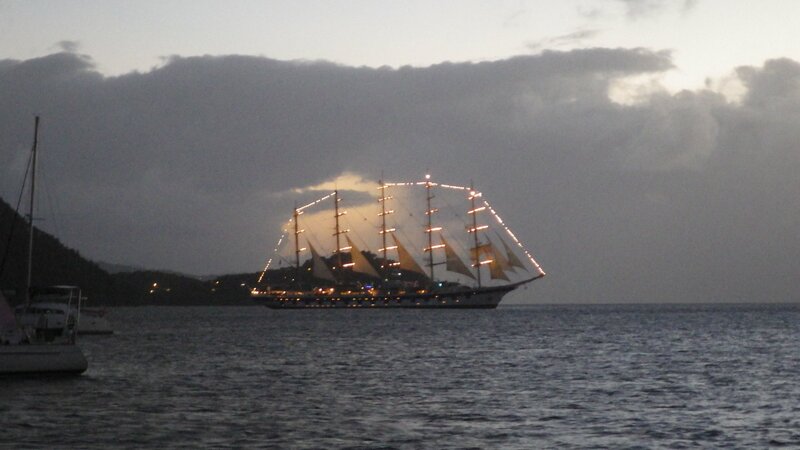 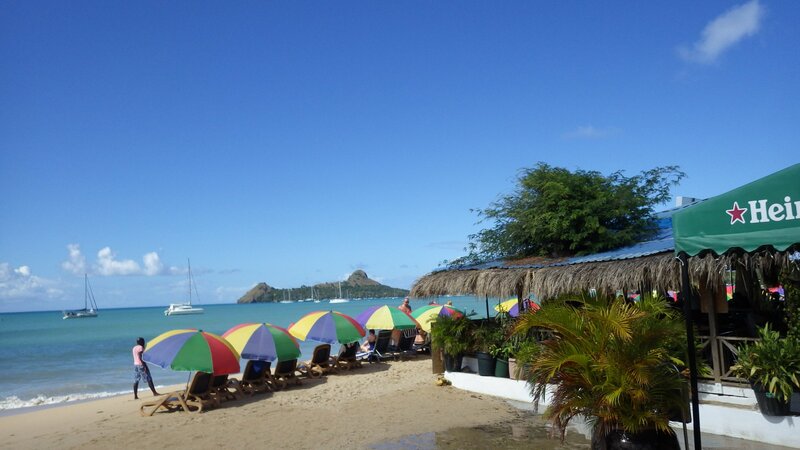 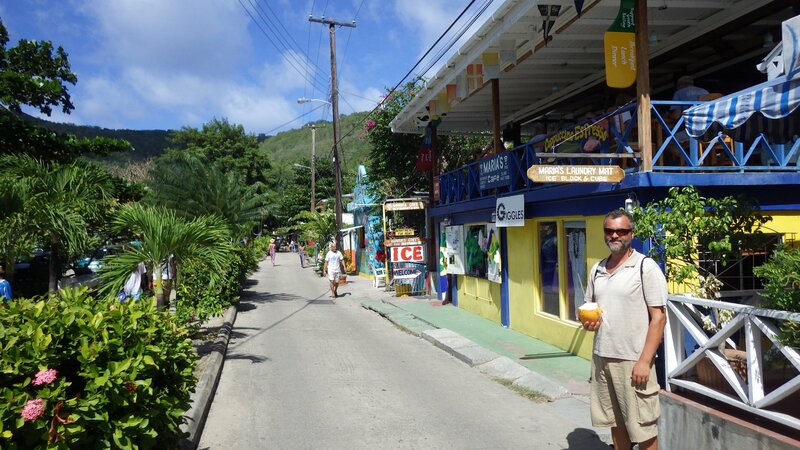 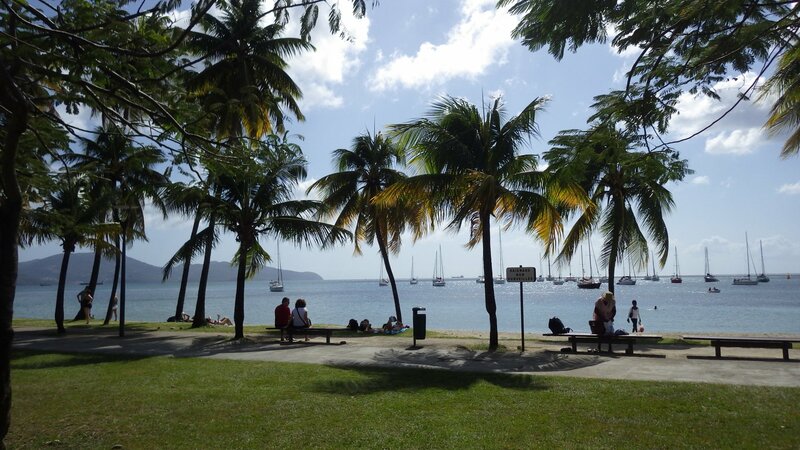 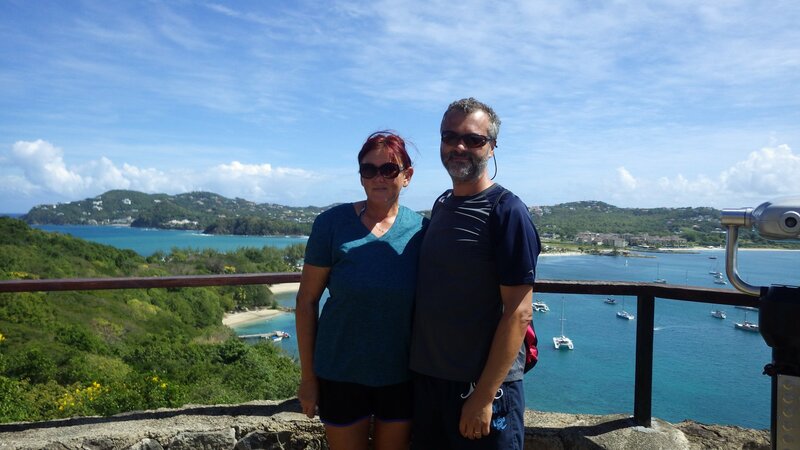 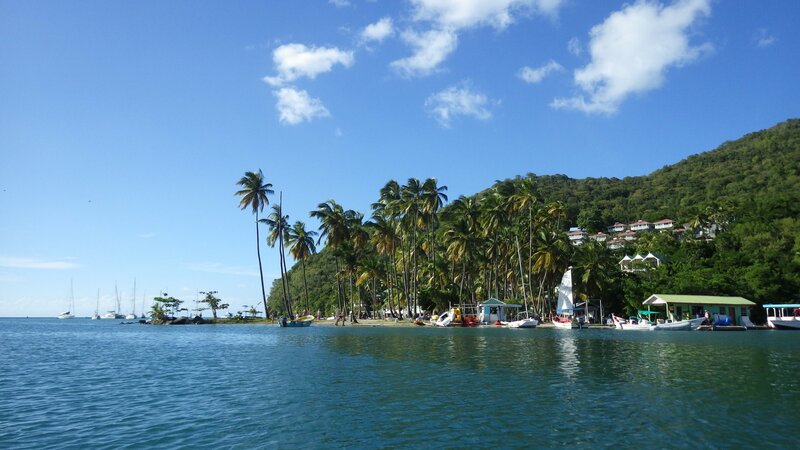 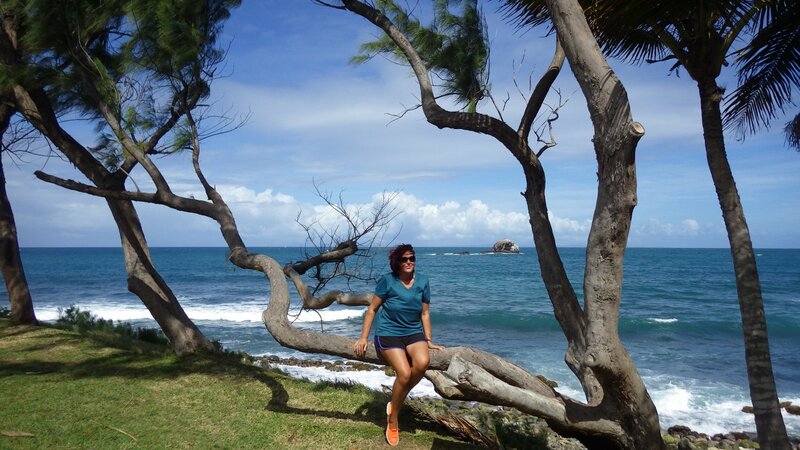 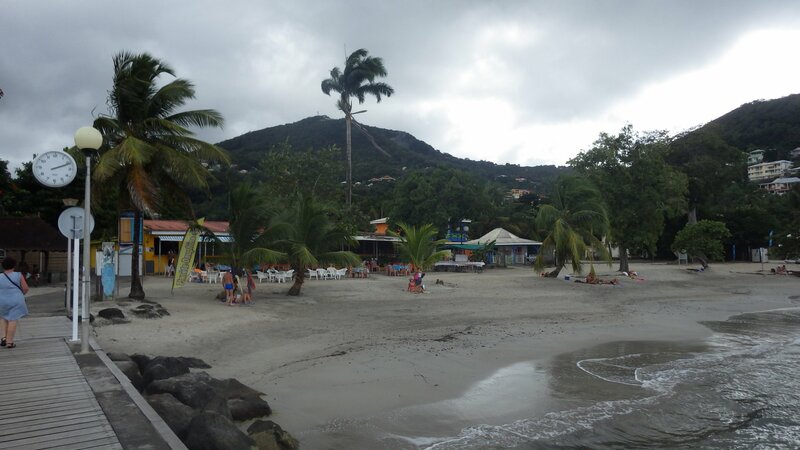 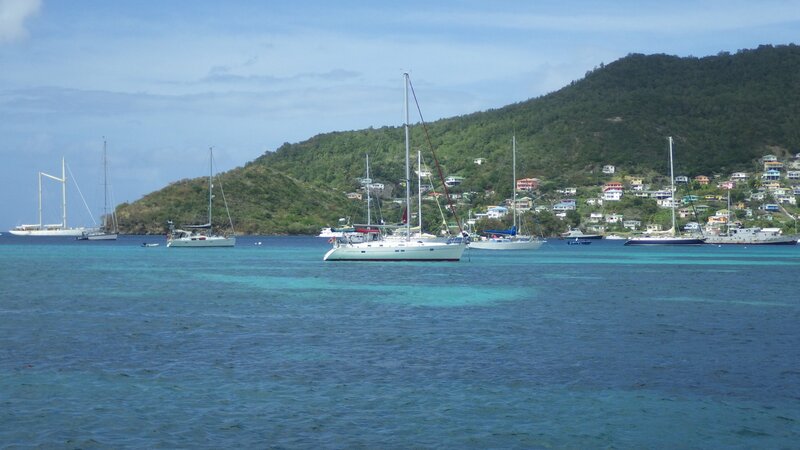 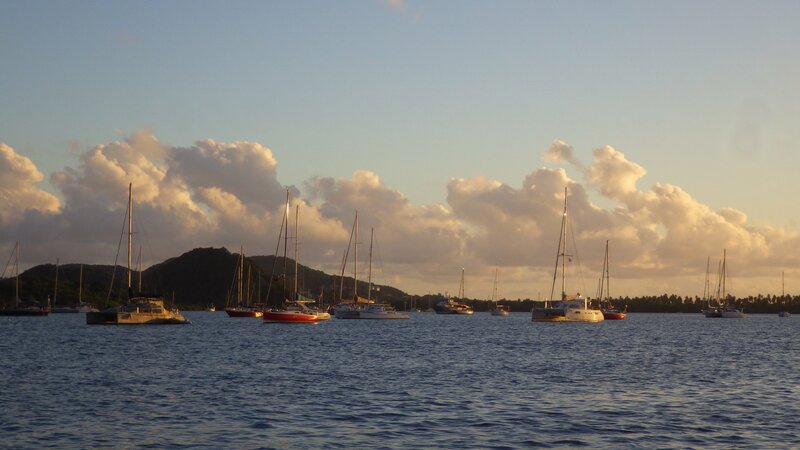 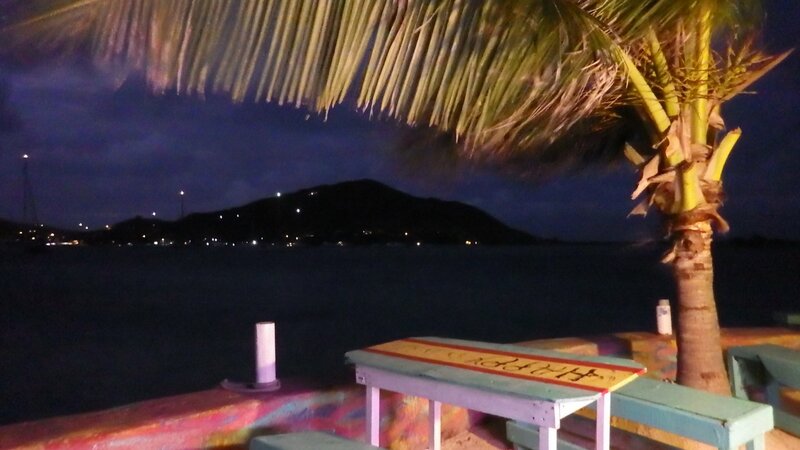 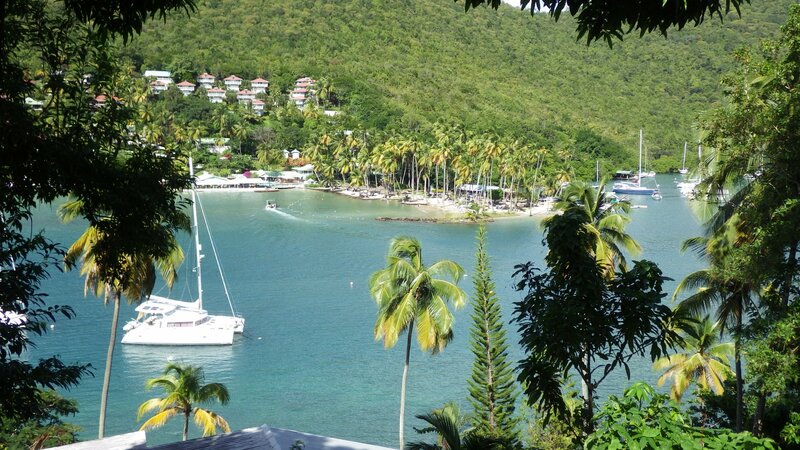 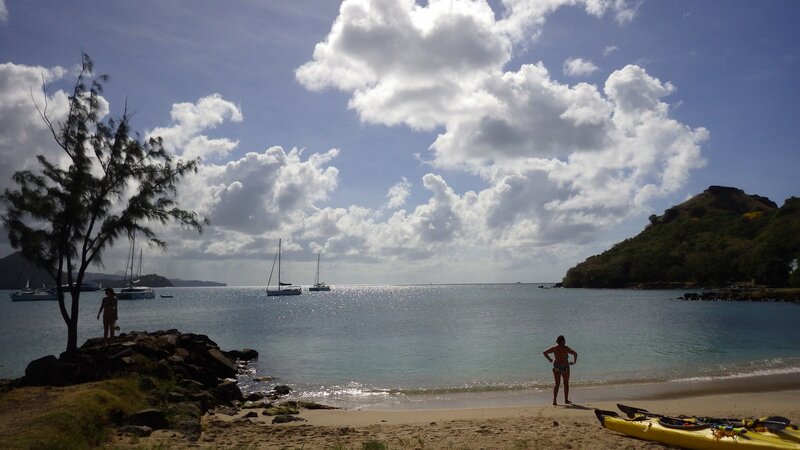 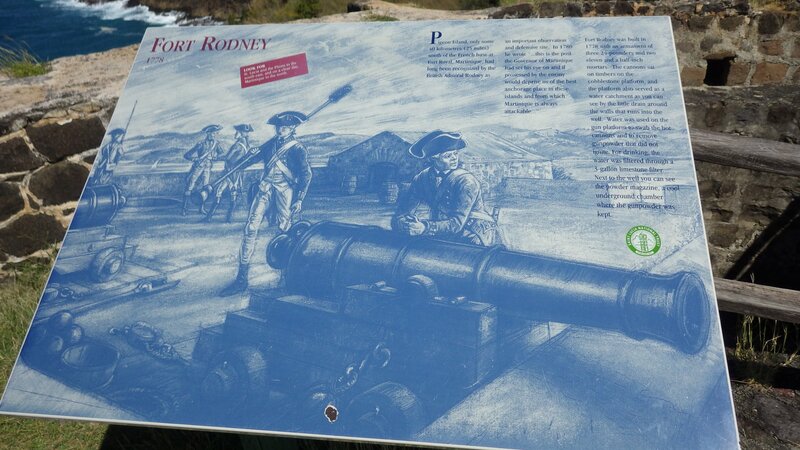 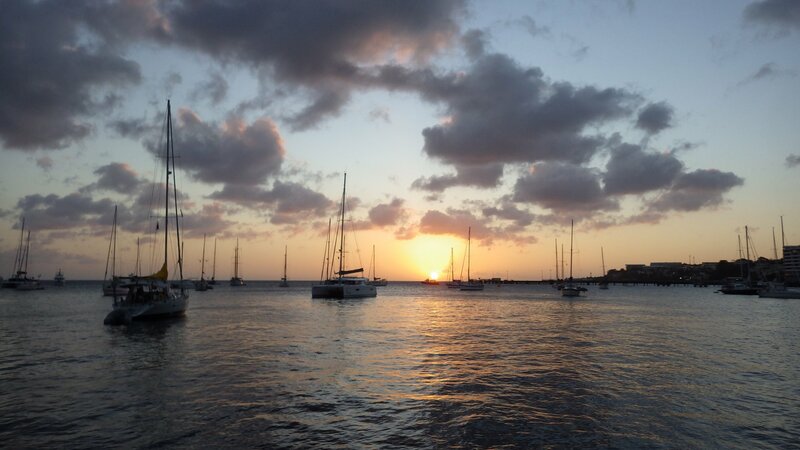 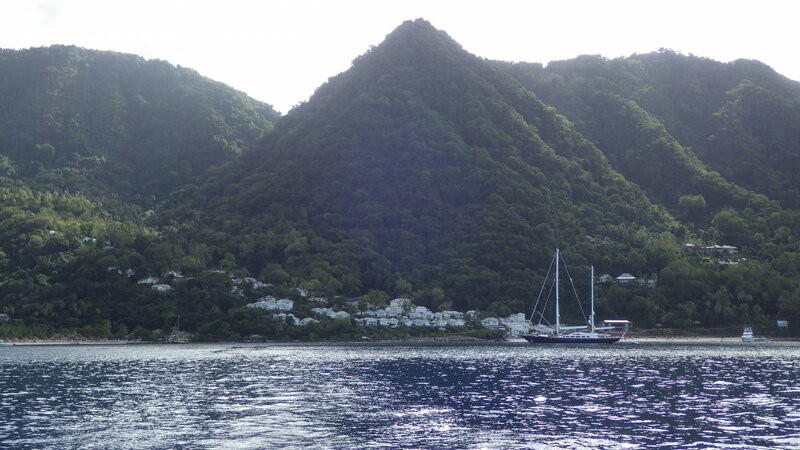 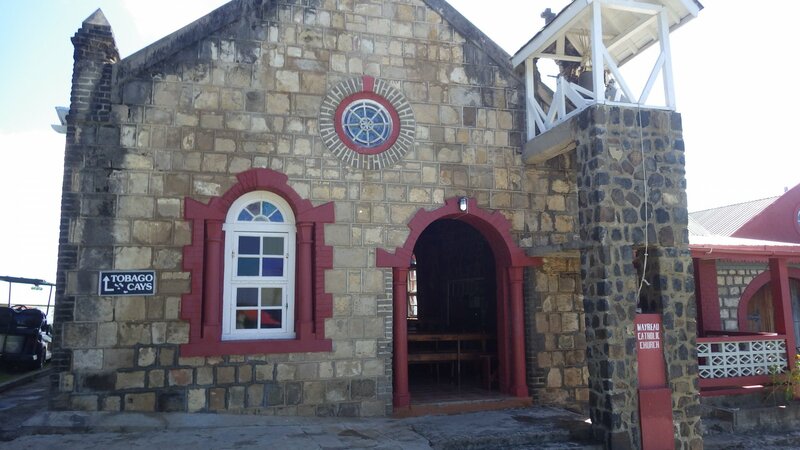 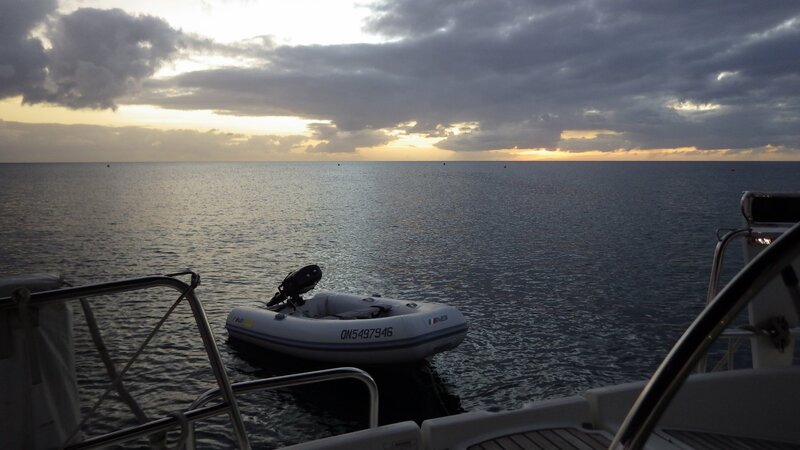 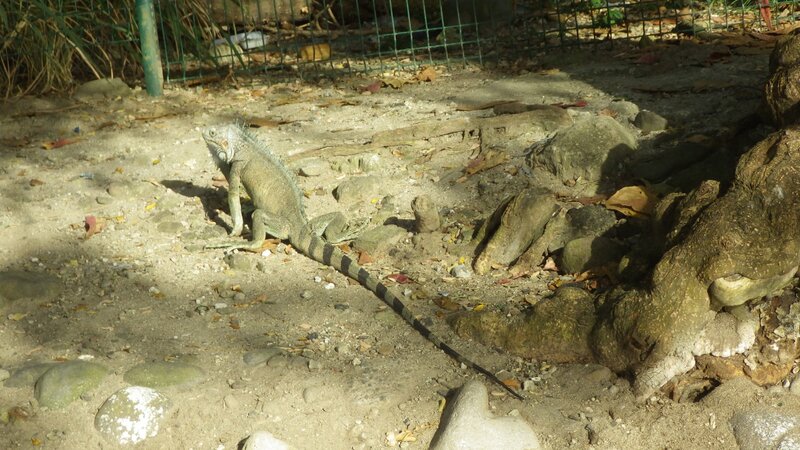 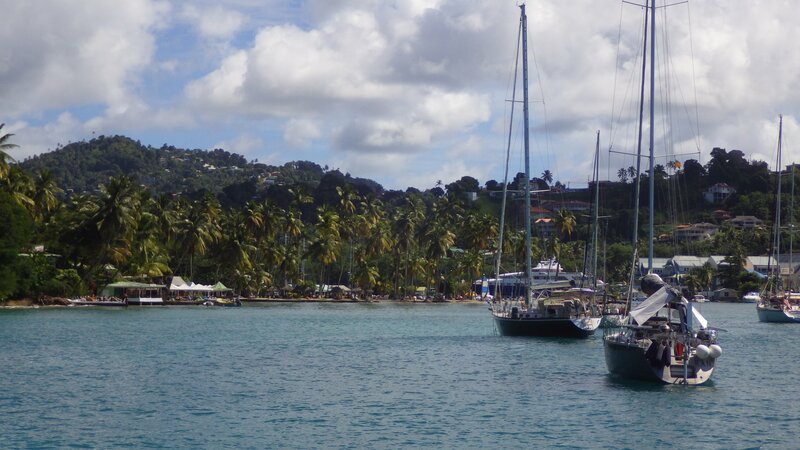 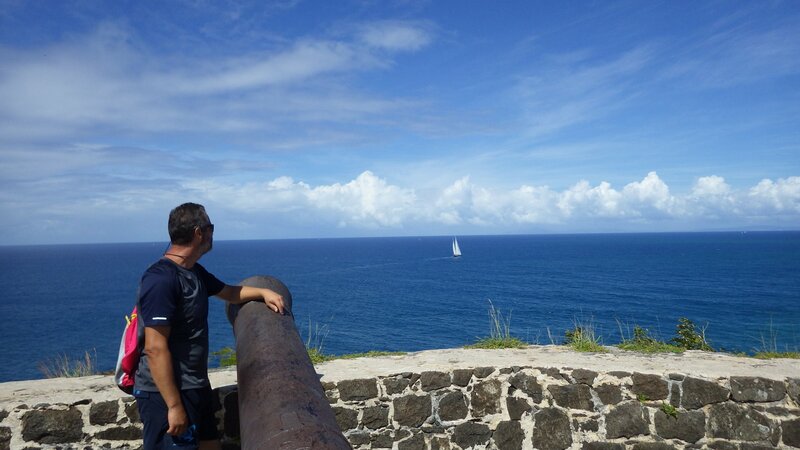 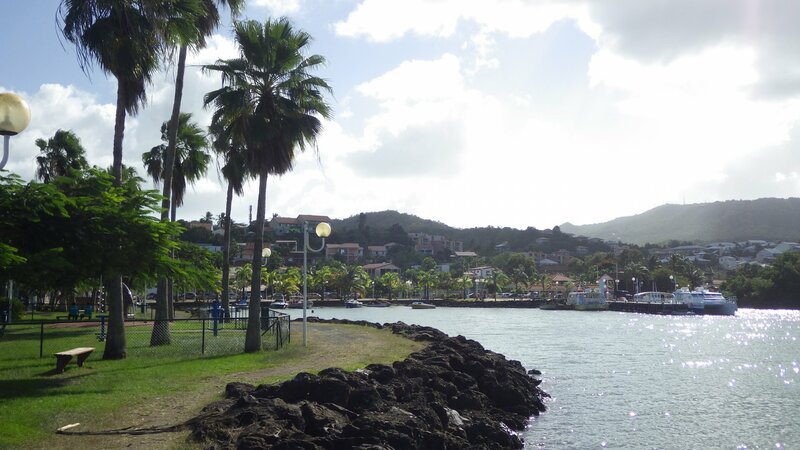 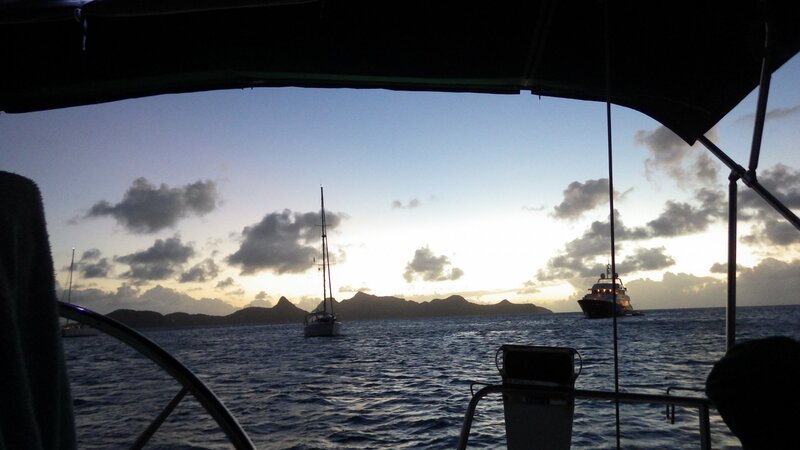 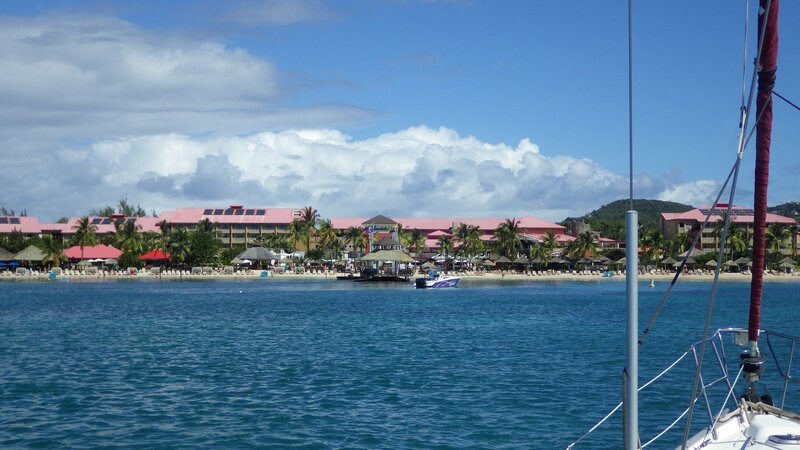 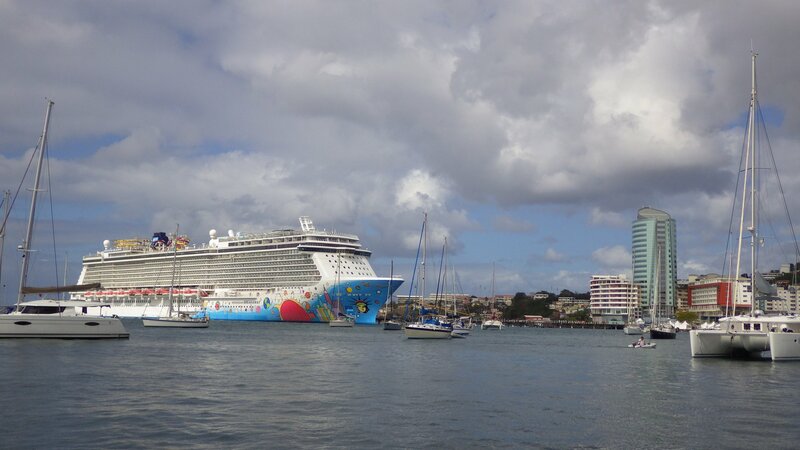 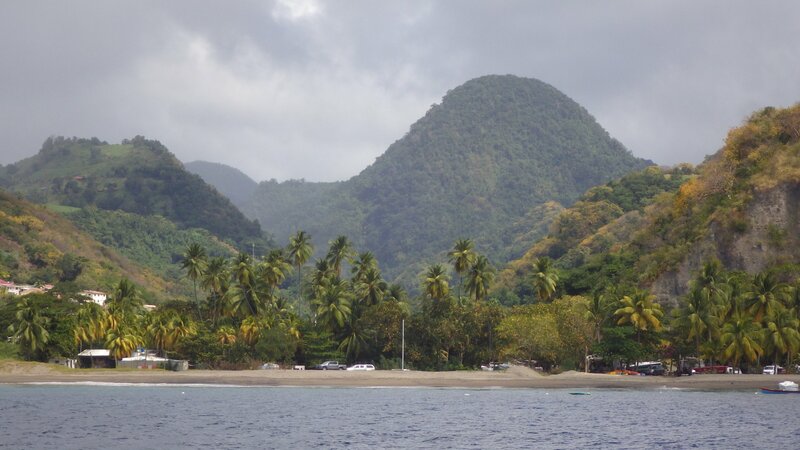 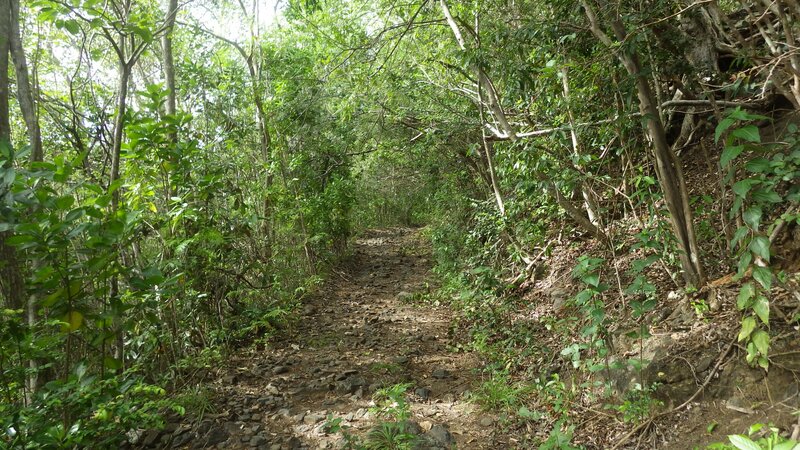 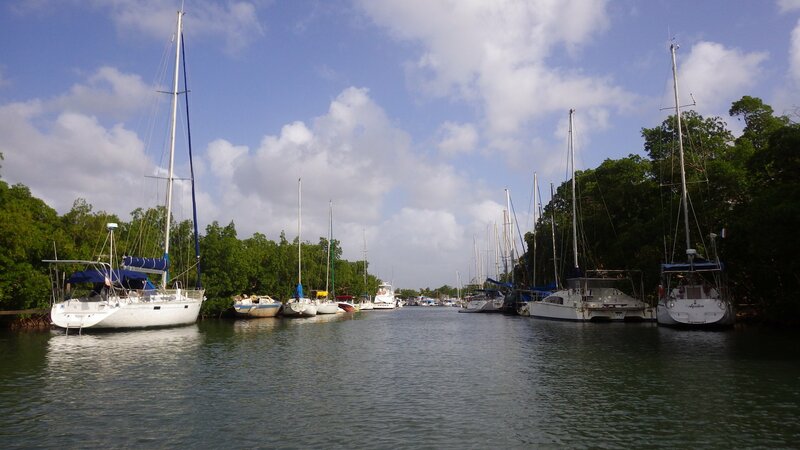 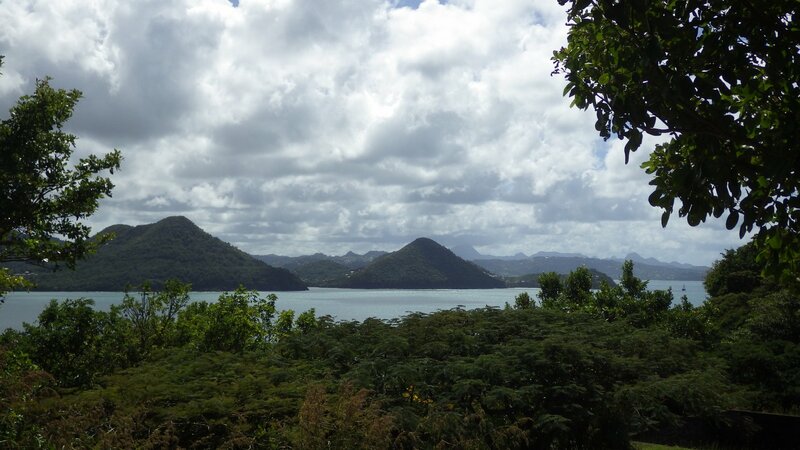 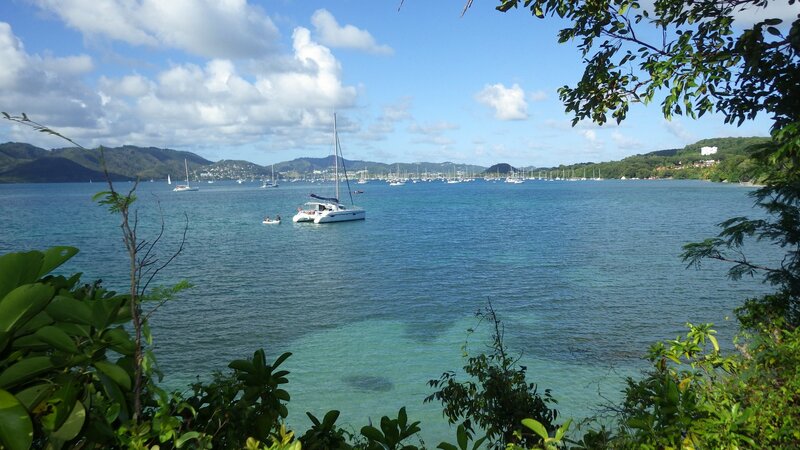 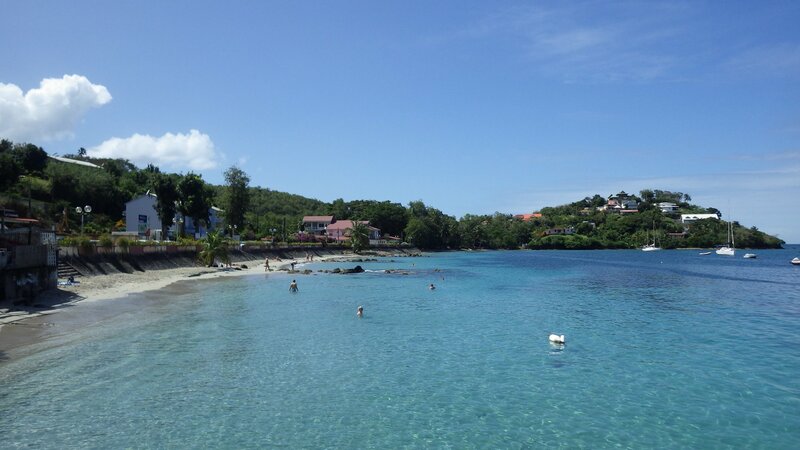 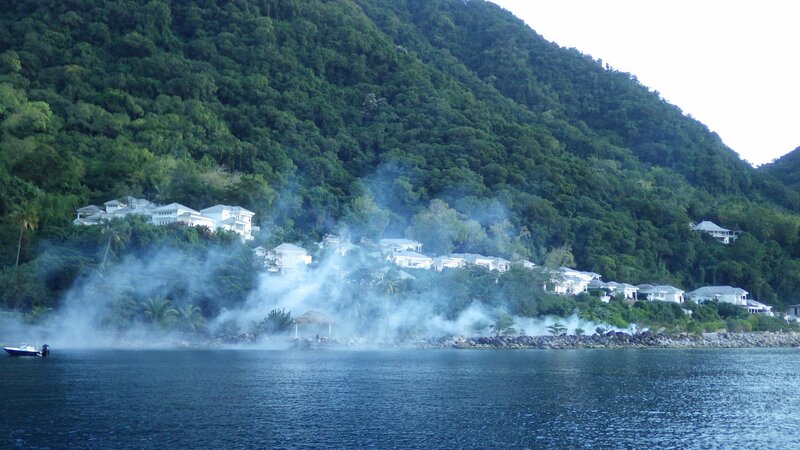 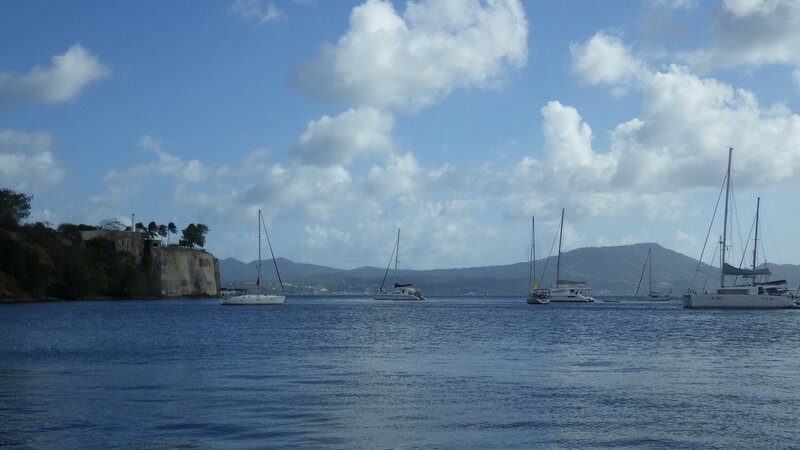 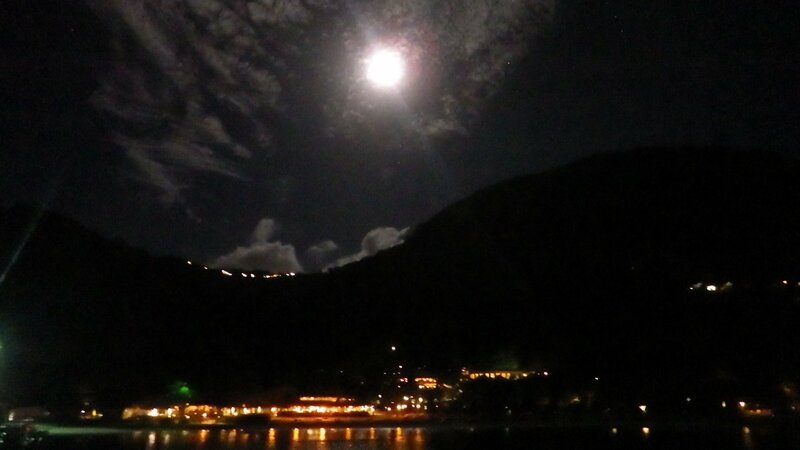 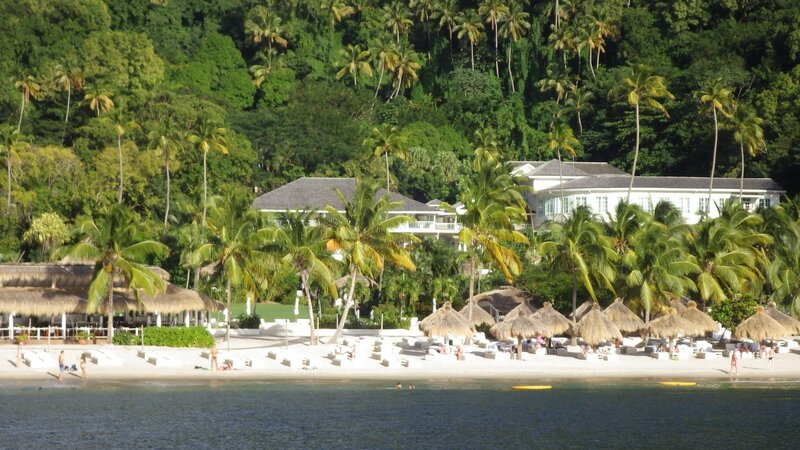 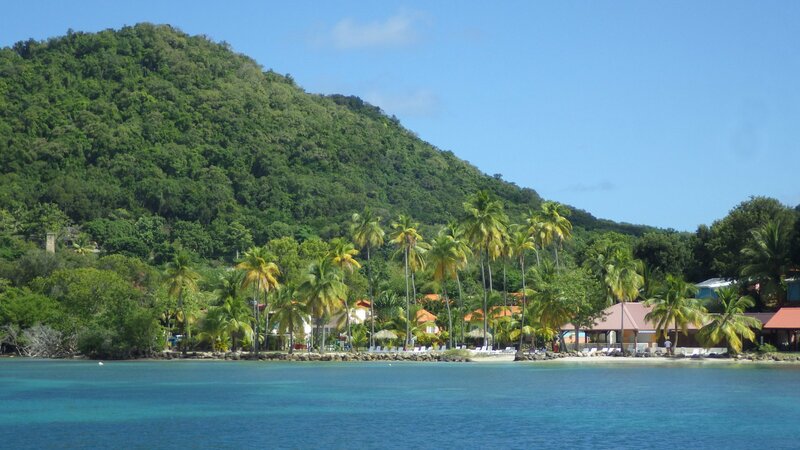 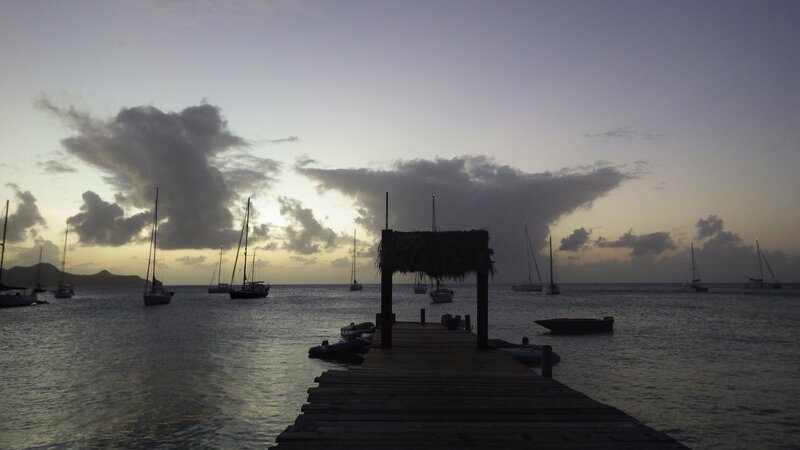 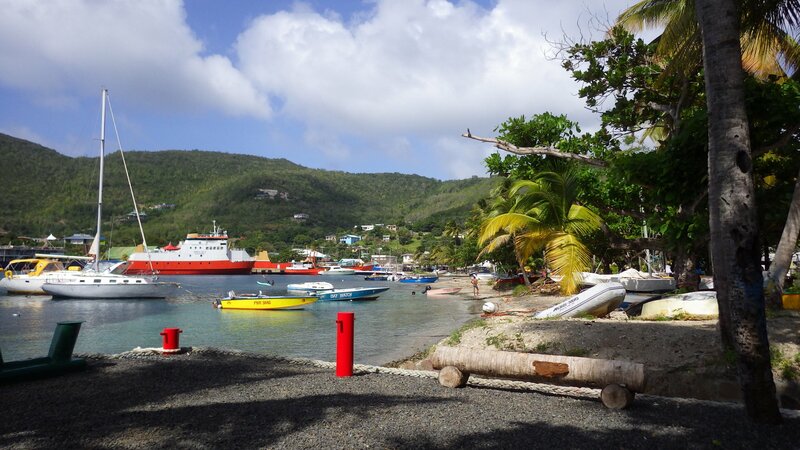 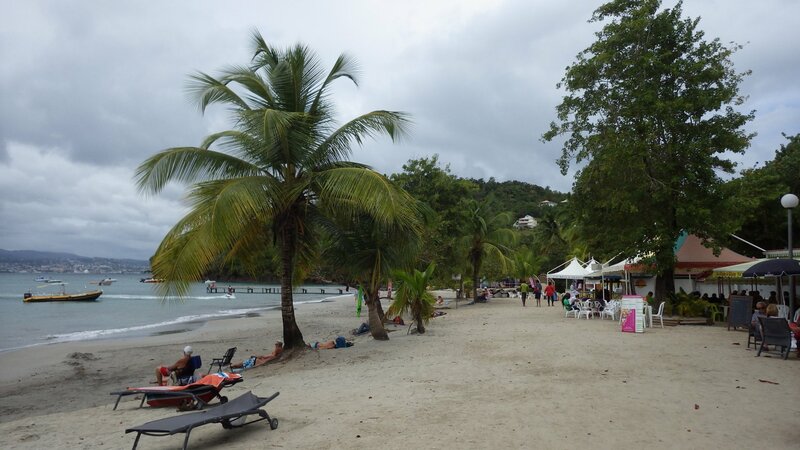 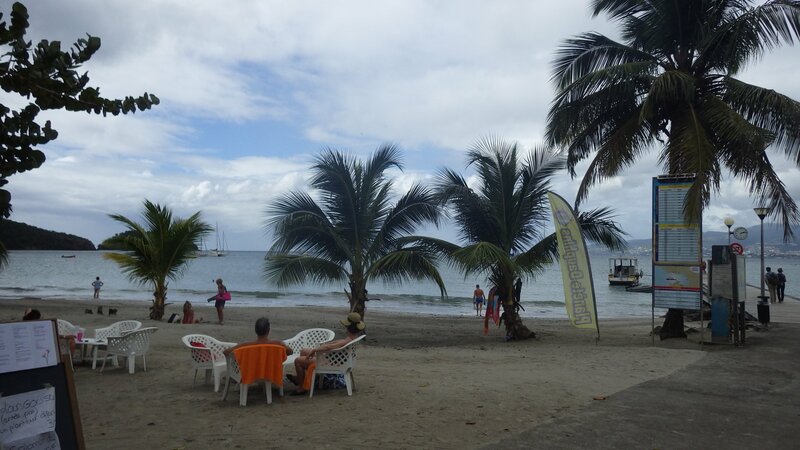 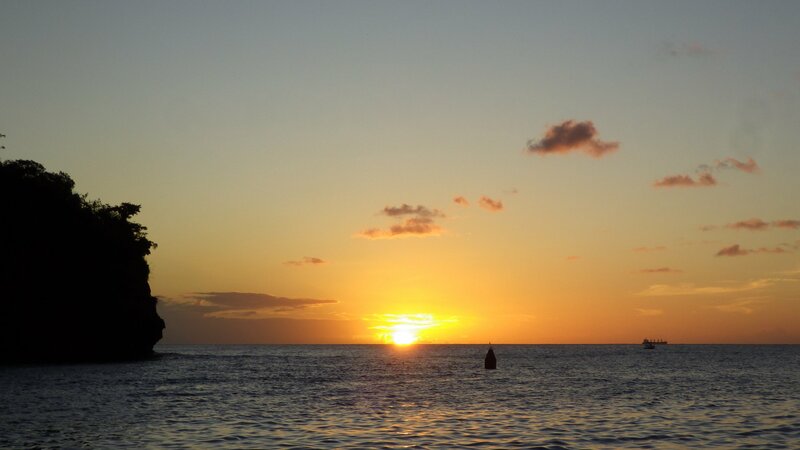 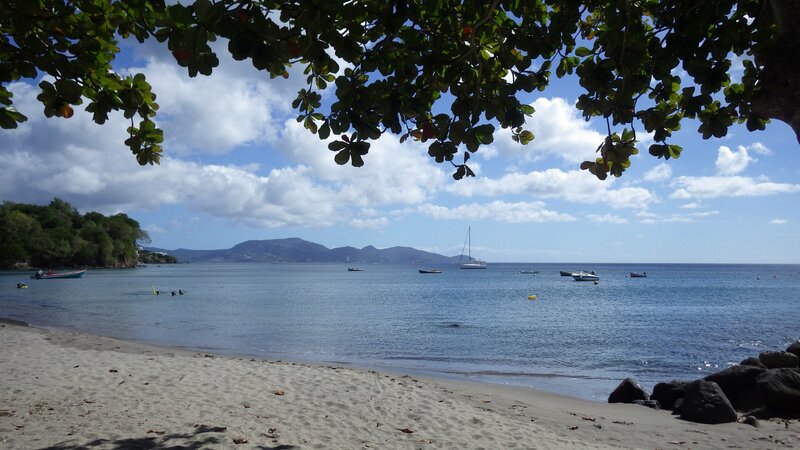 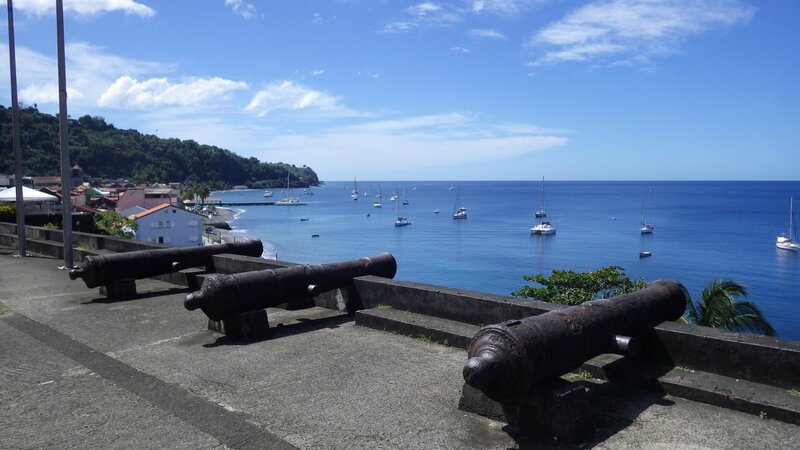 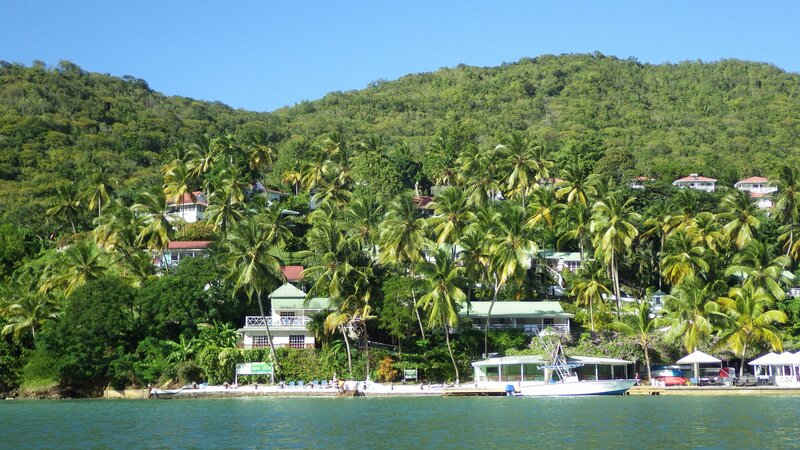 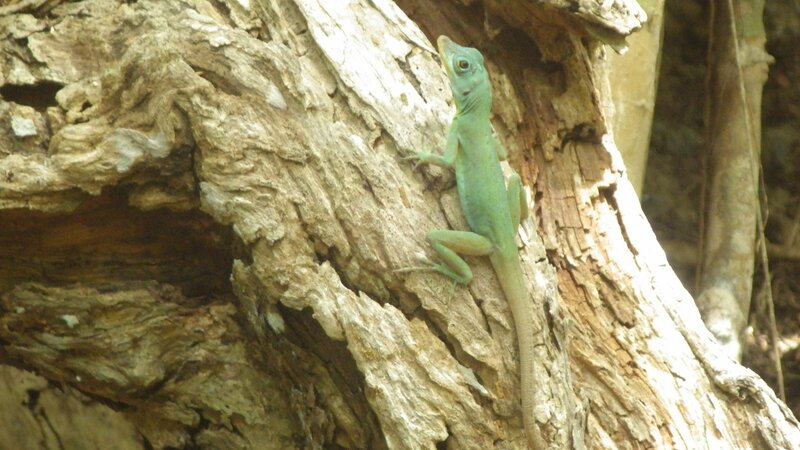 We stayed in 3 places this time in St. Lucia: the Pitons, Marigot Harbour and Rodney Bay. 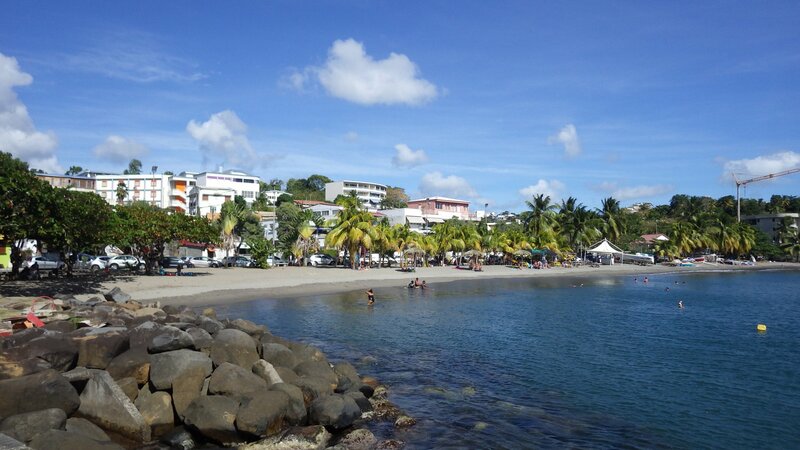 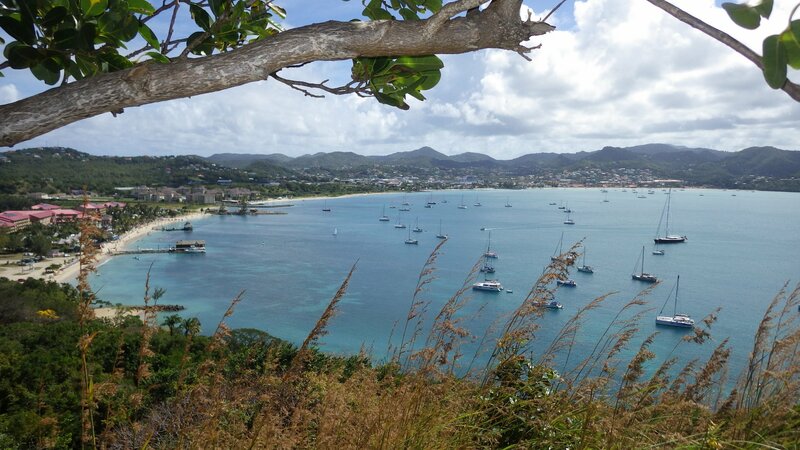 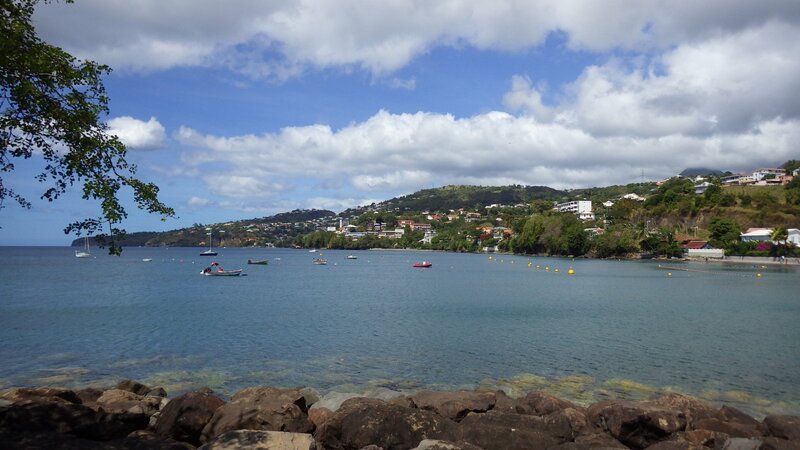 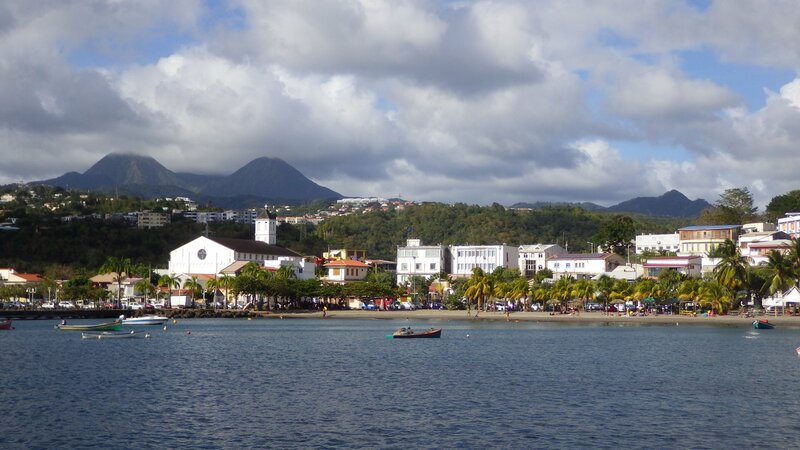 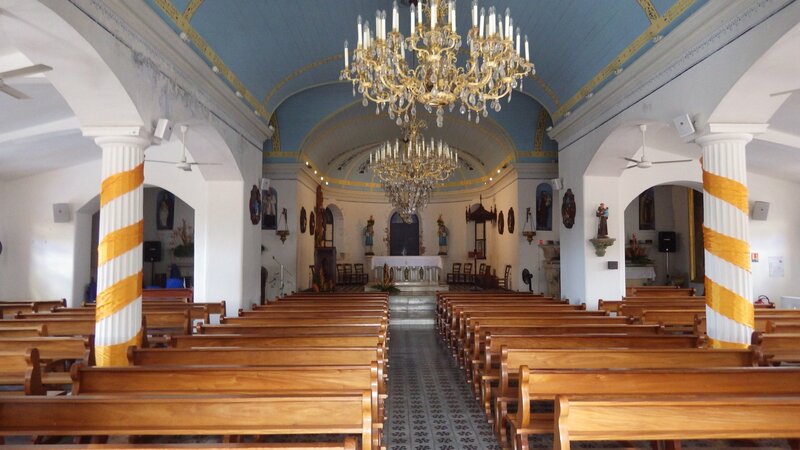 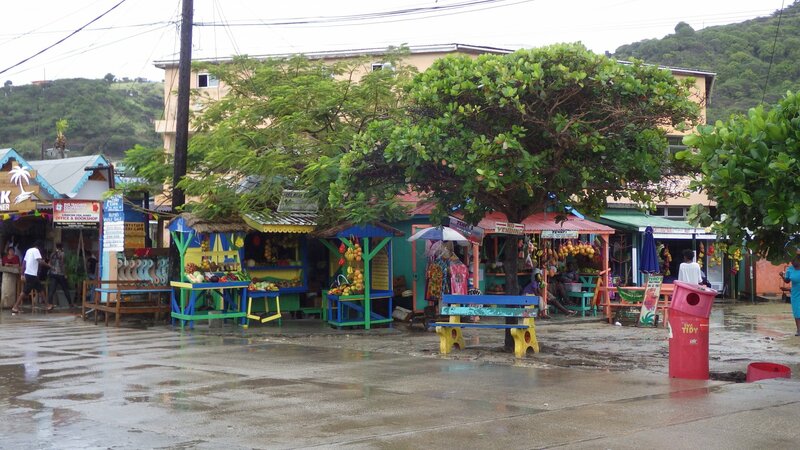 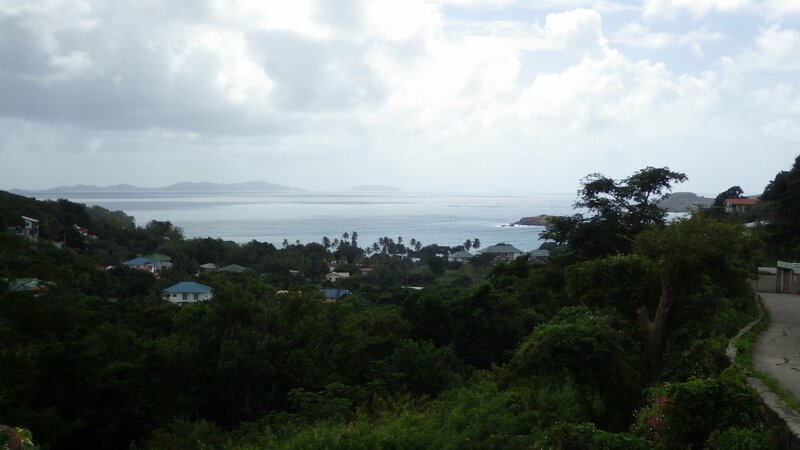 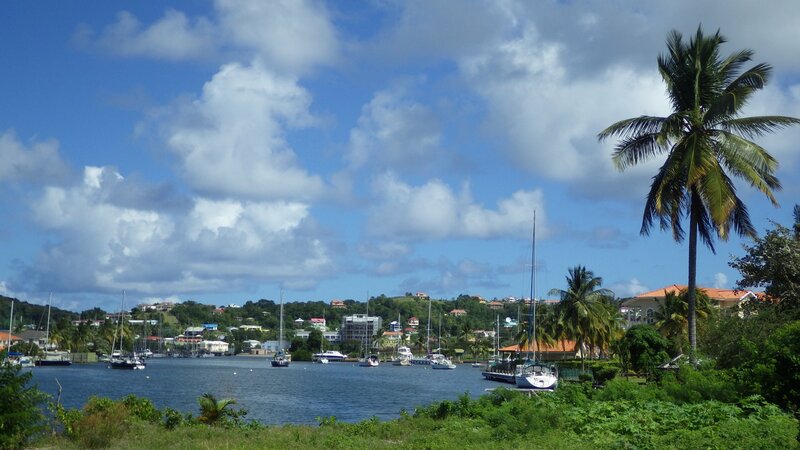 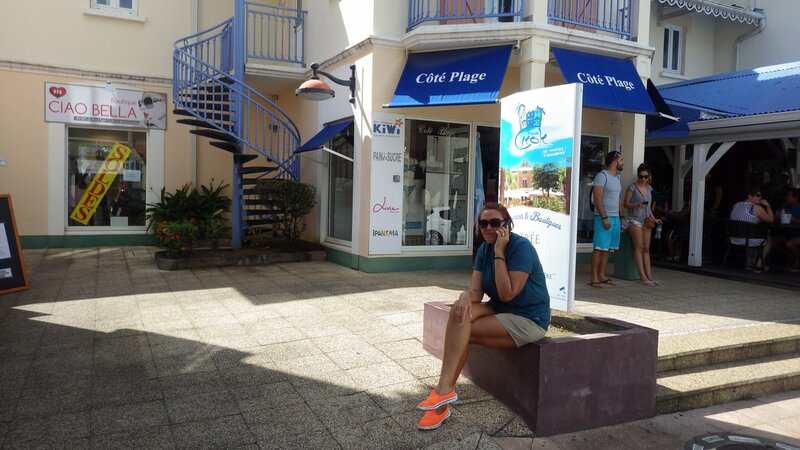 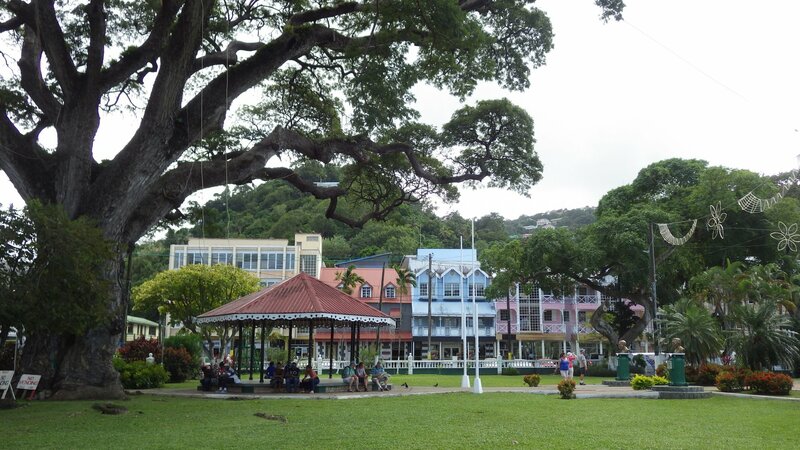 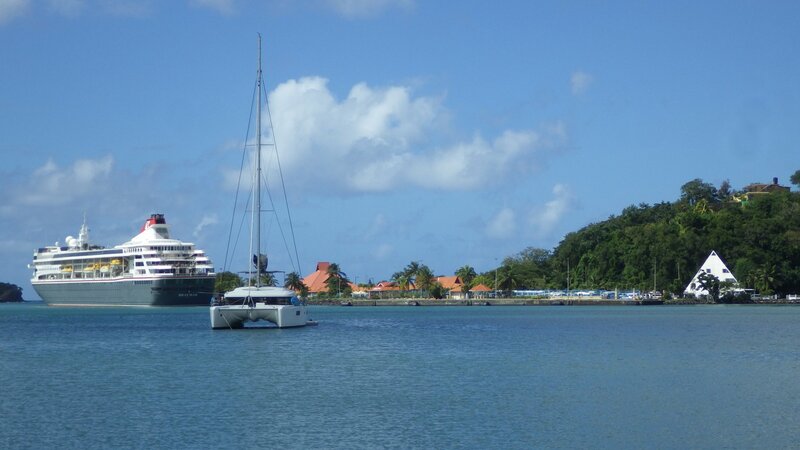 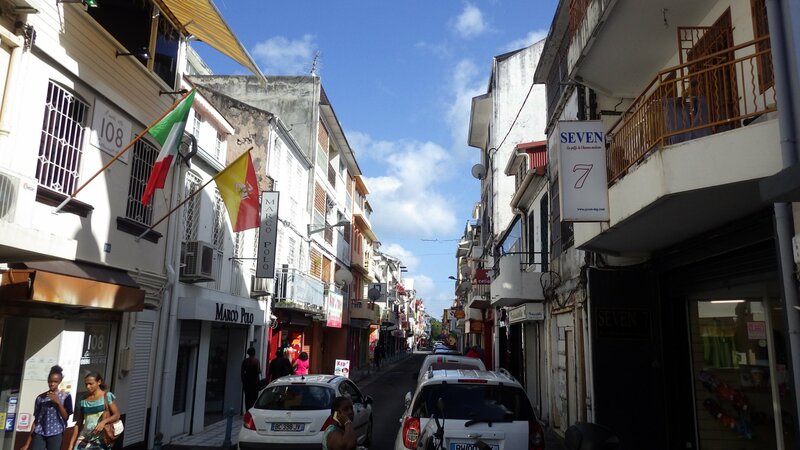 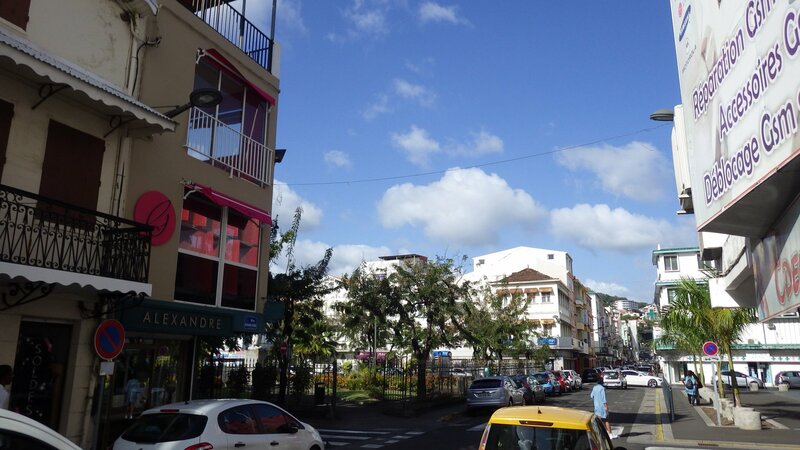 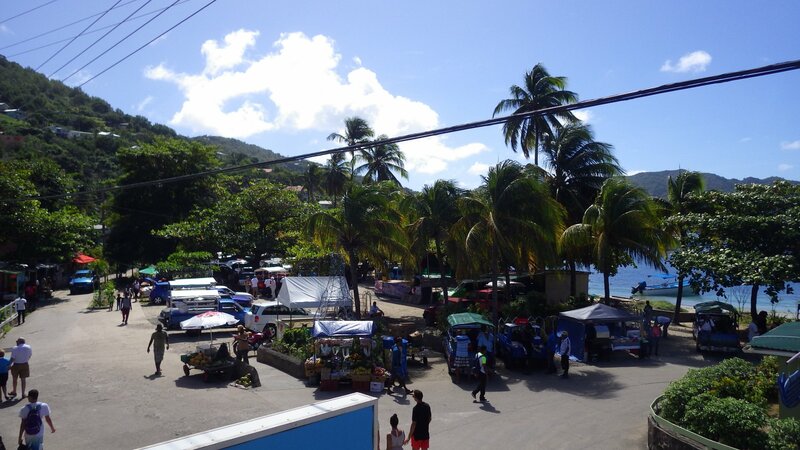 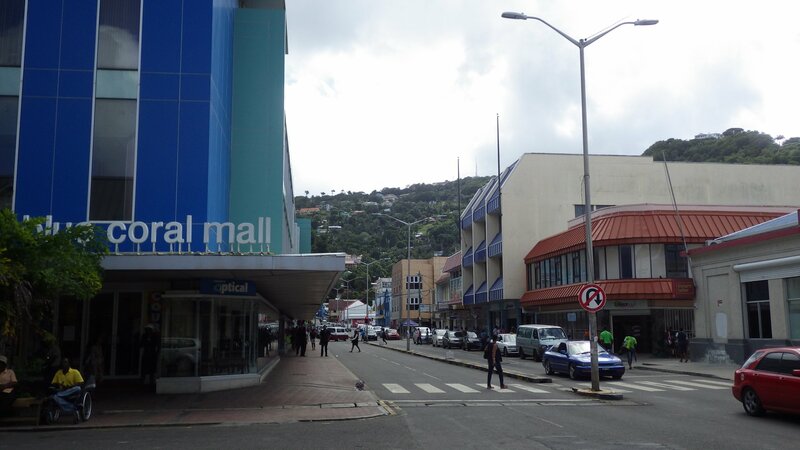 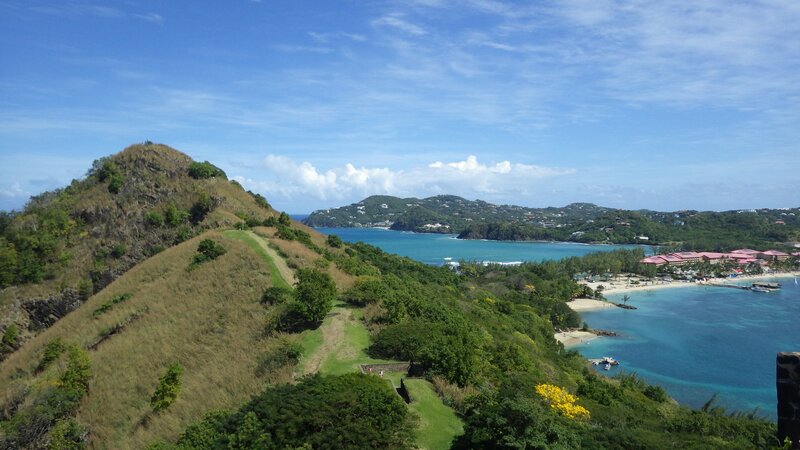 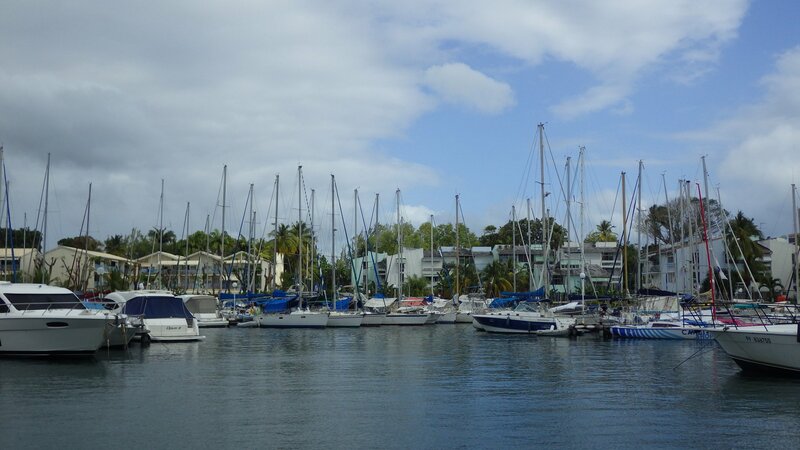 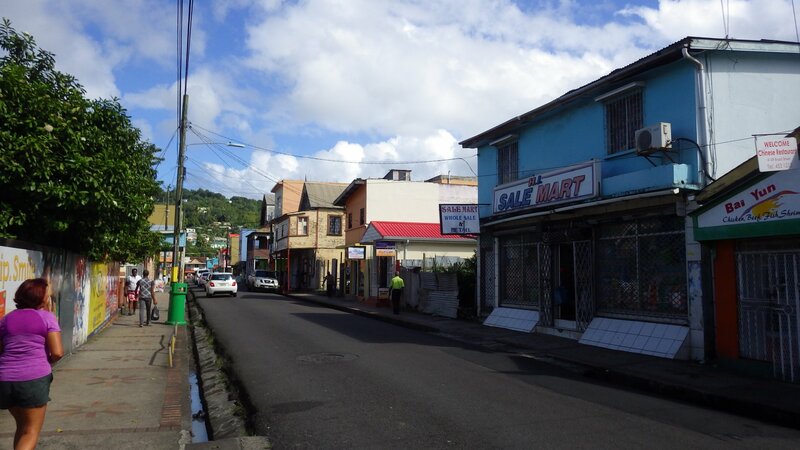 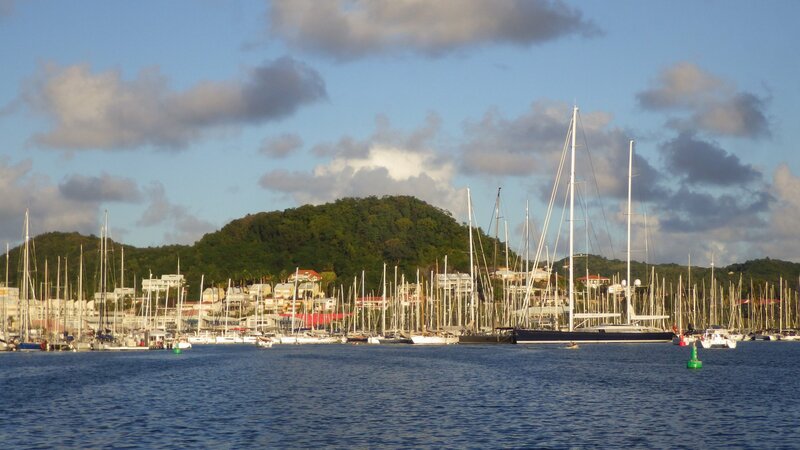 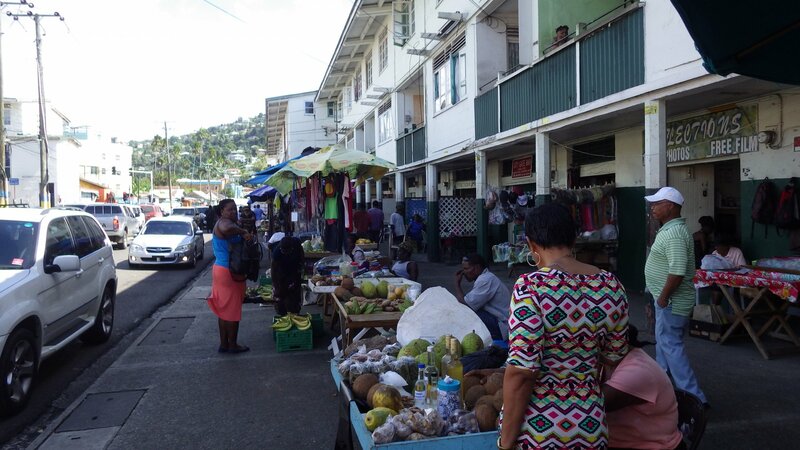 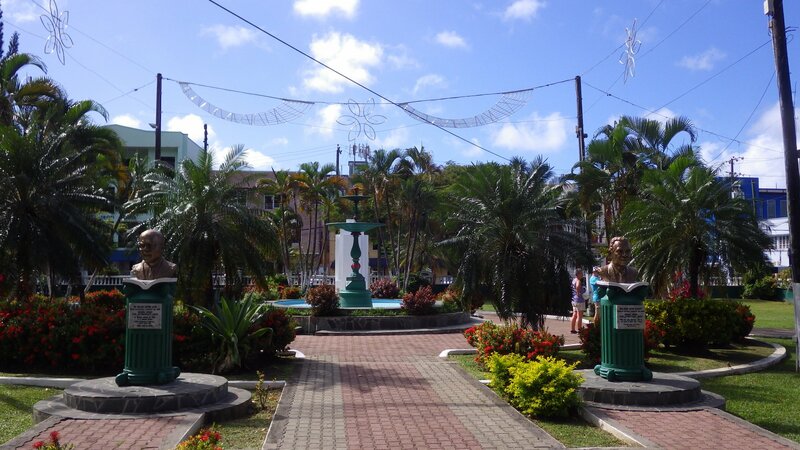 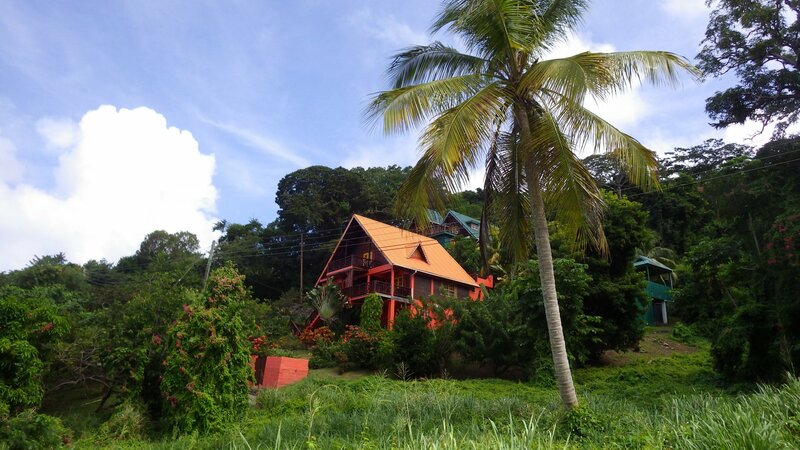 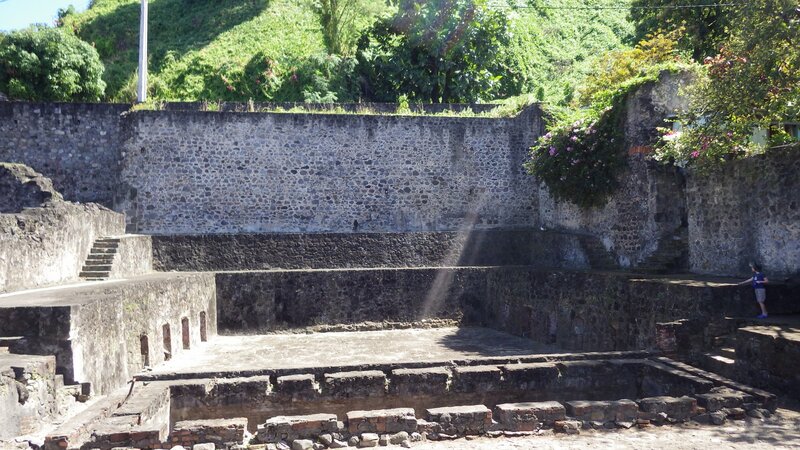 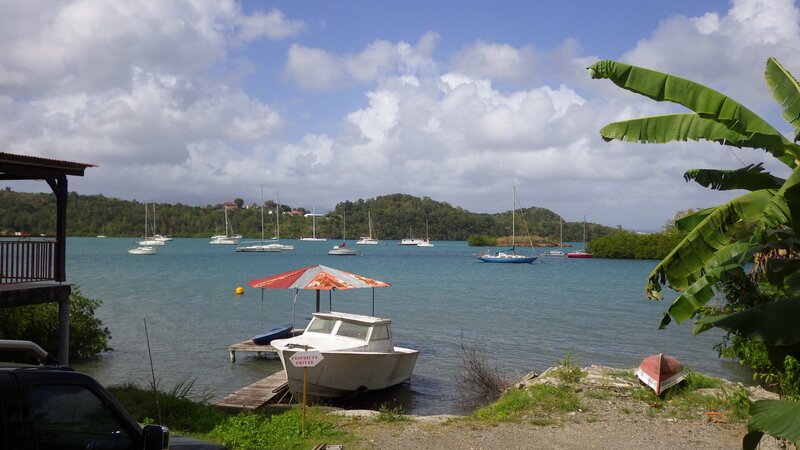 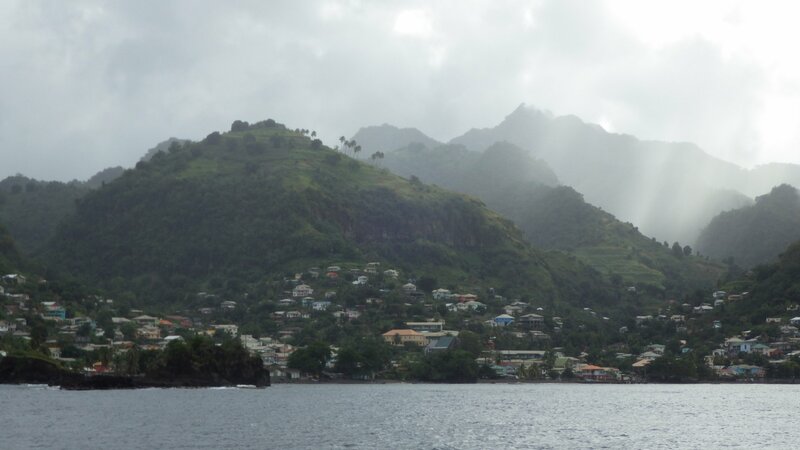 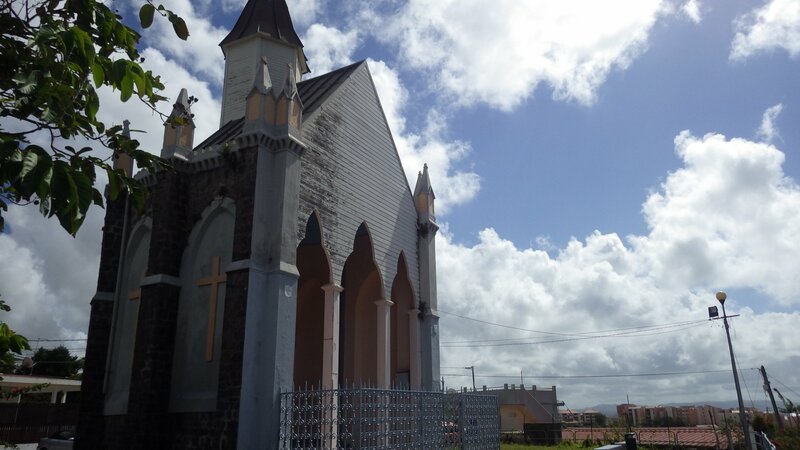 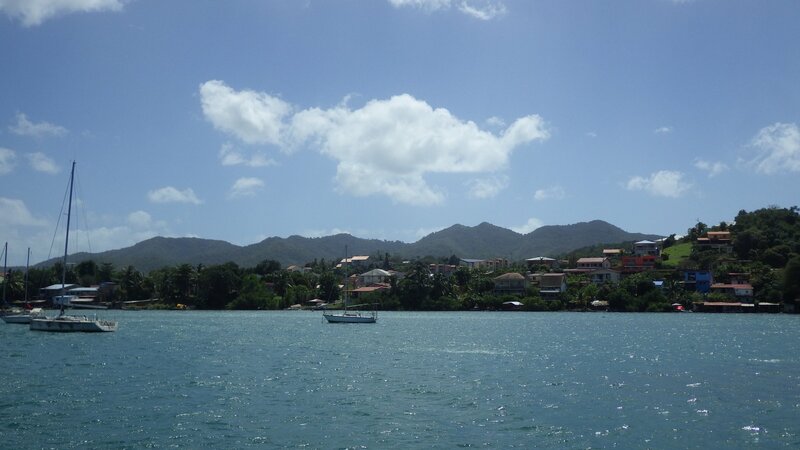 We also took a local bus trip to the capital city of Castries. 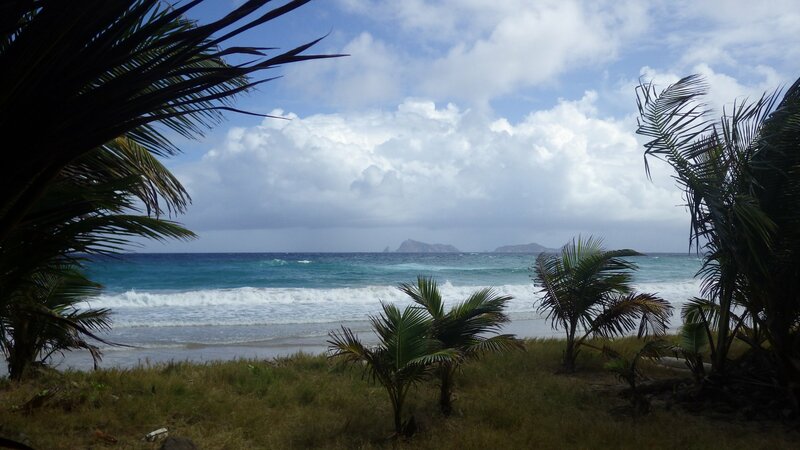 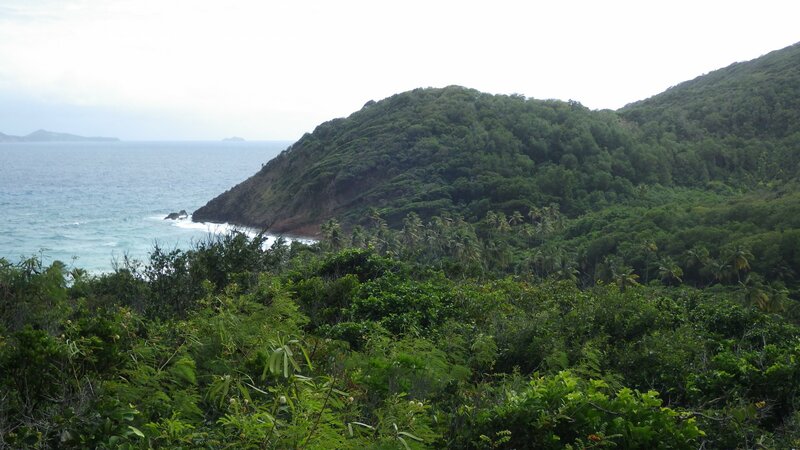 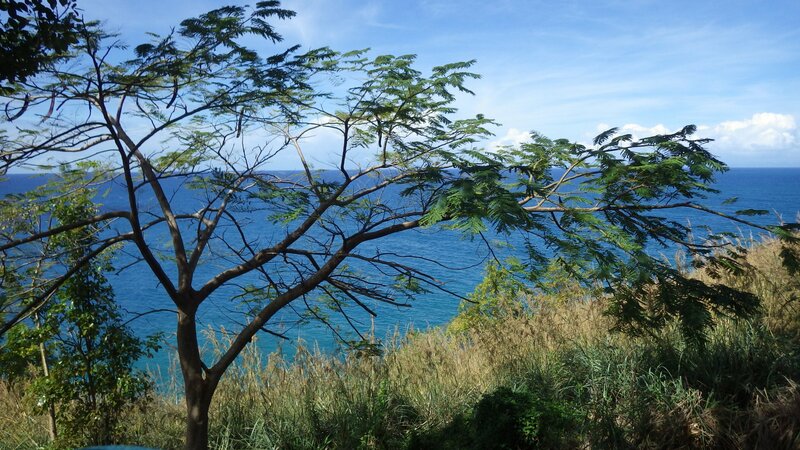 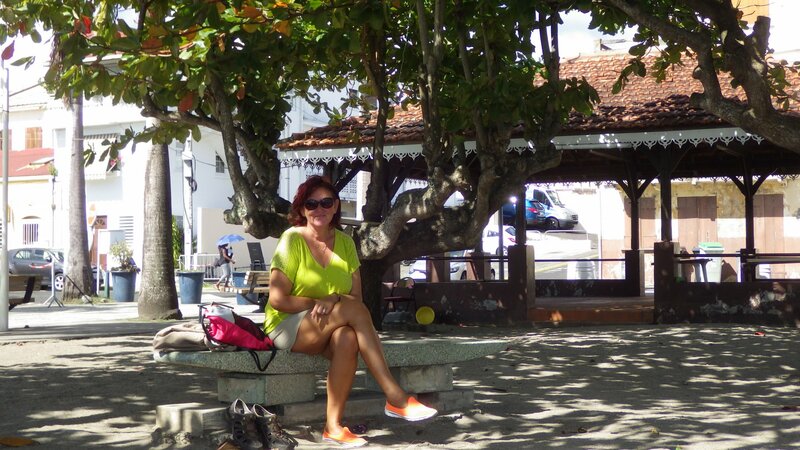 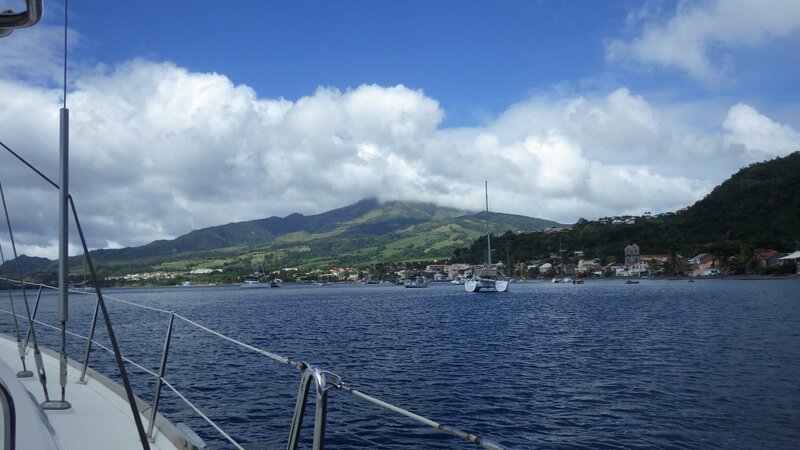 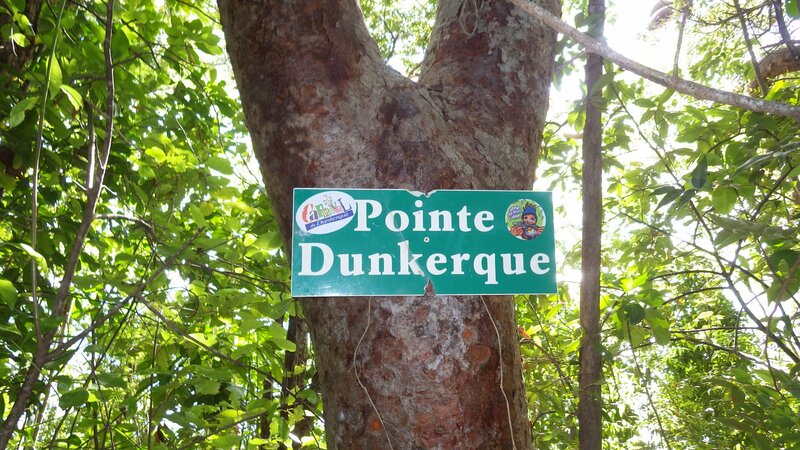 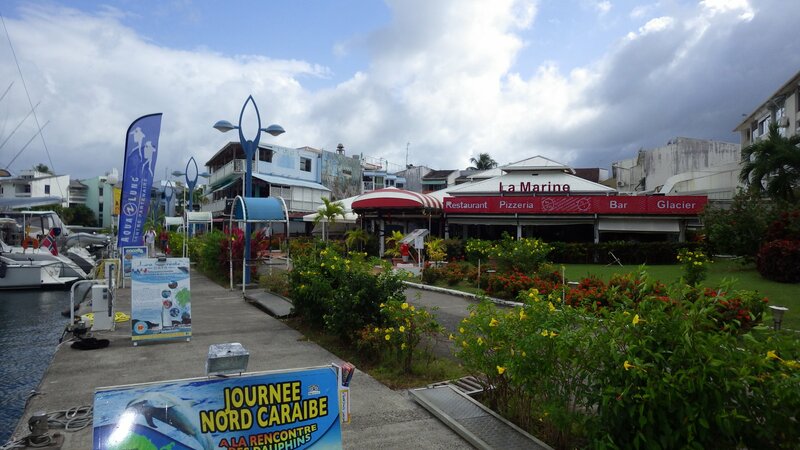 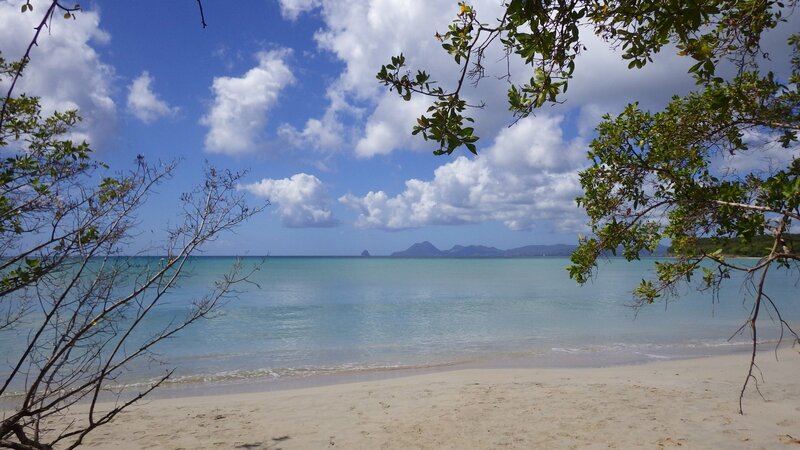 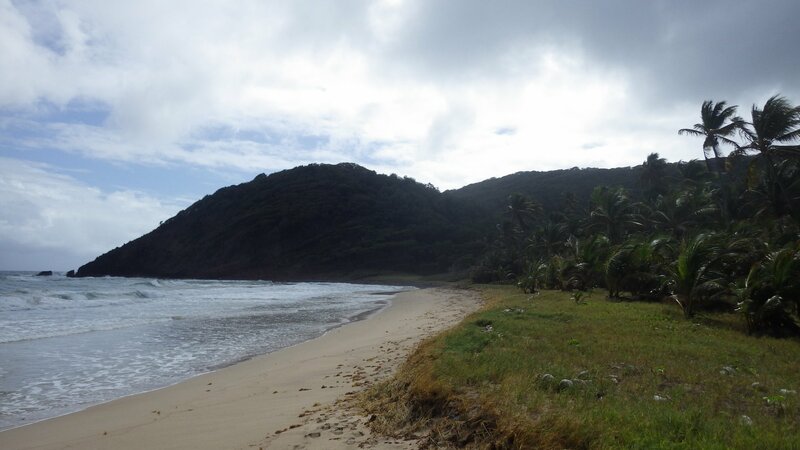 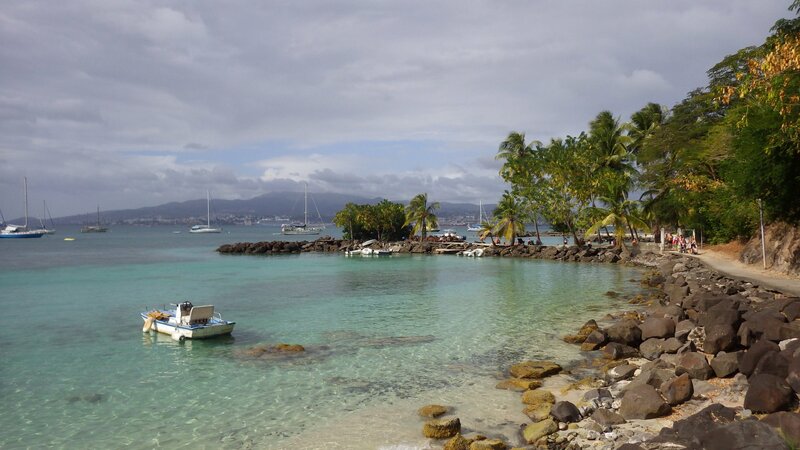 We loved Martinique Island, again. 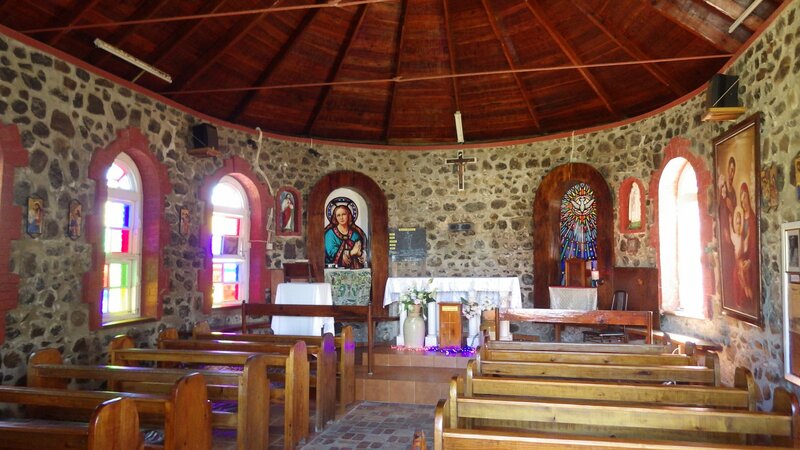 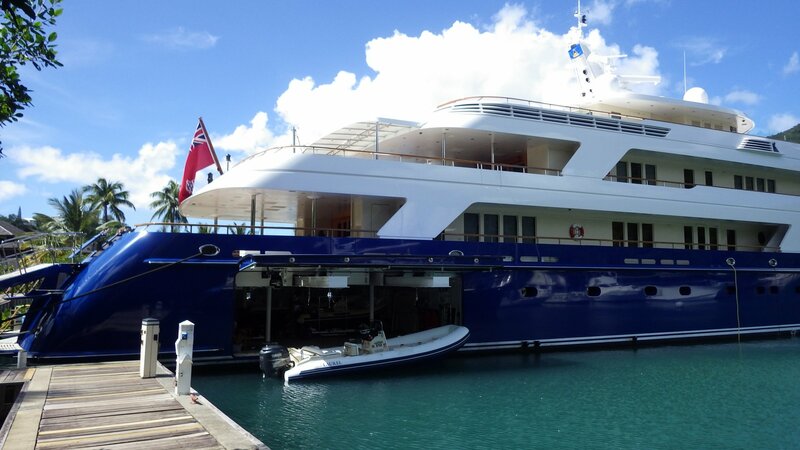 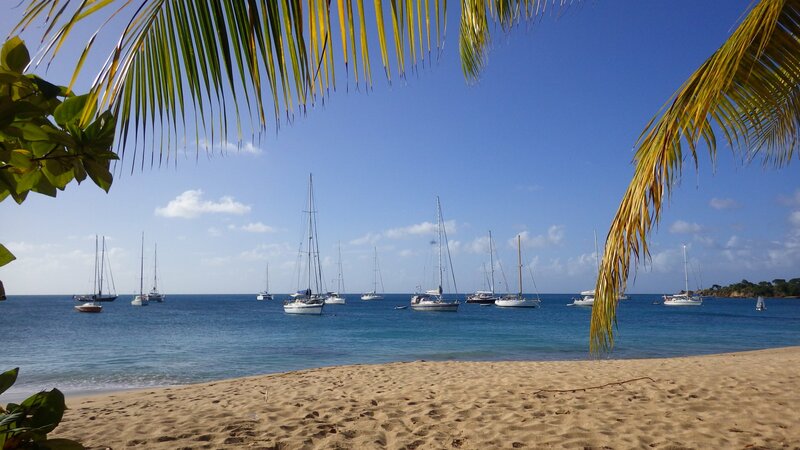 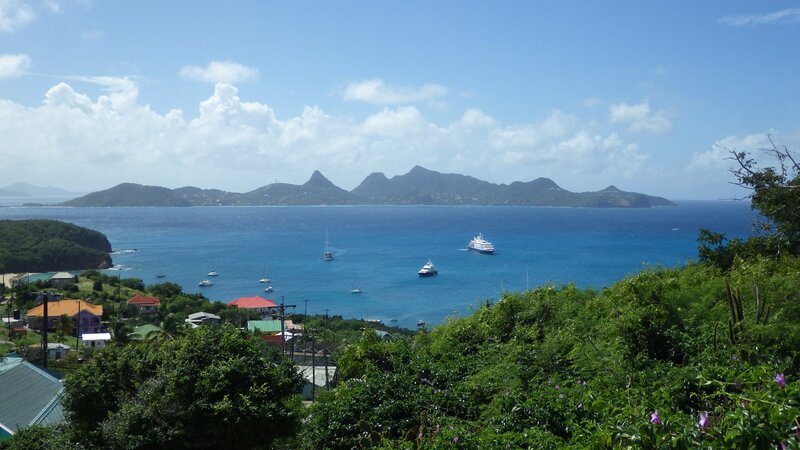 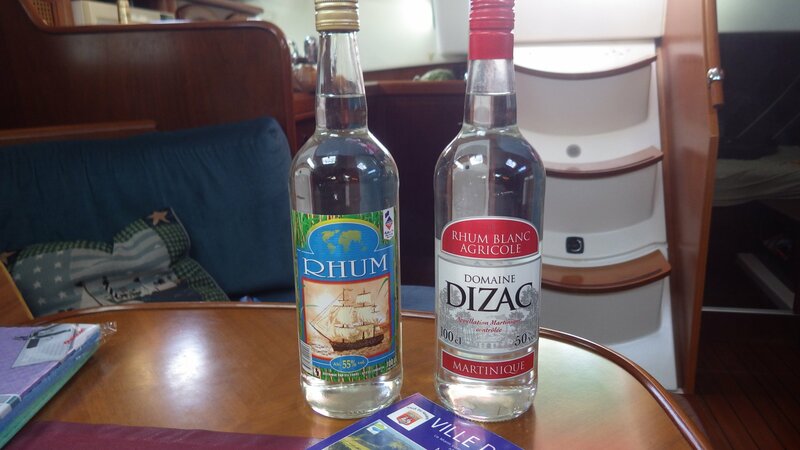 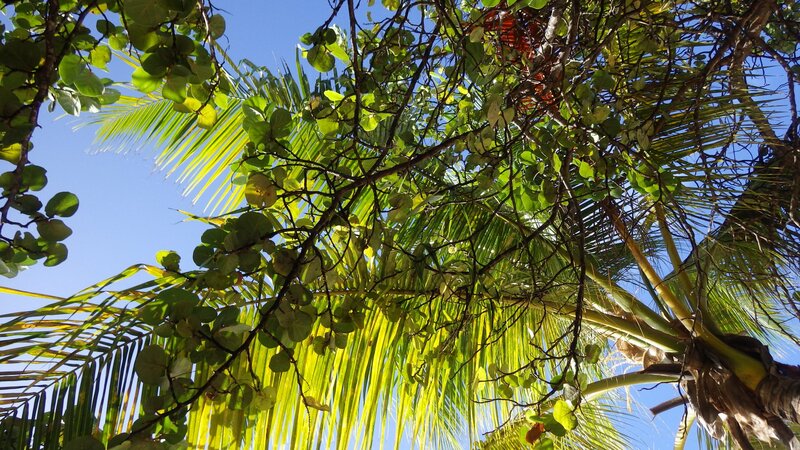 The French Caribbean islands are quite distinct from others, independent-country islands. 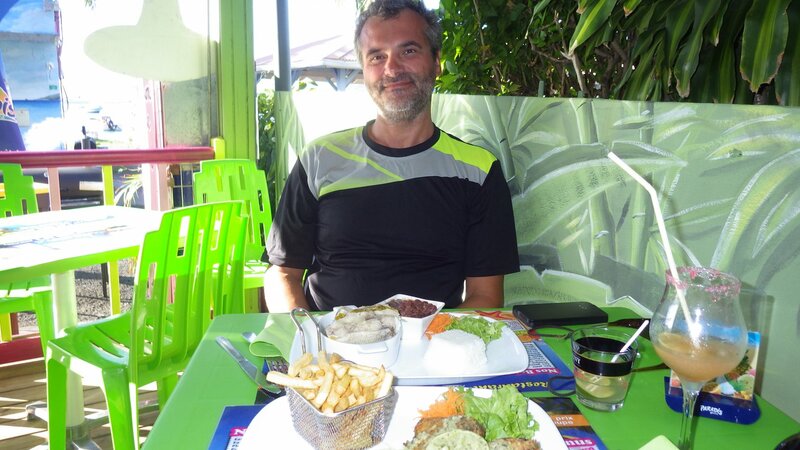 They are part of France, and hence the EU. 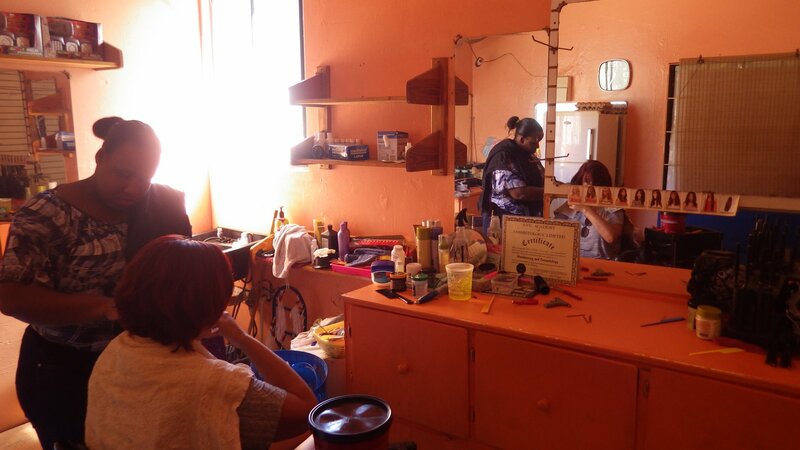 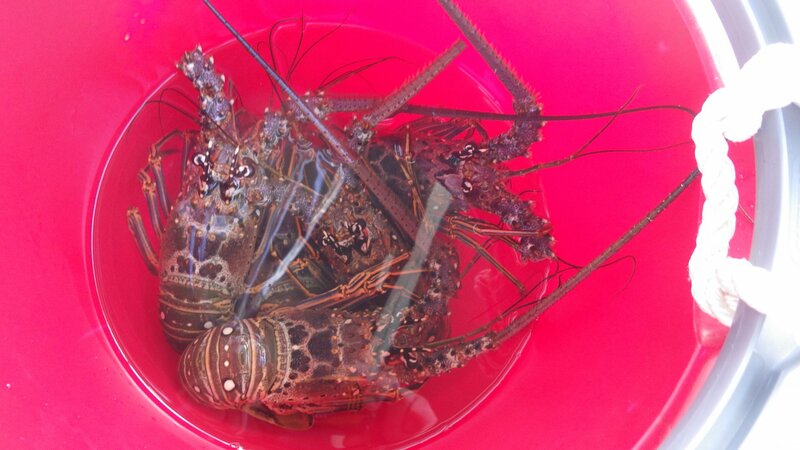 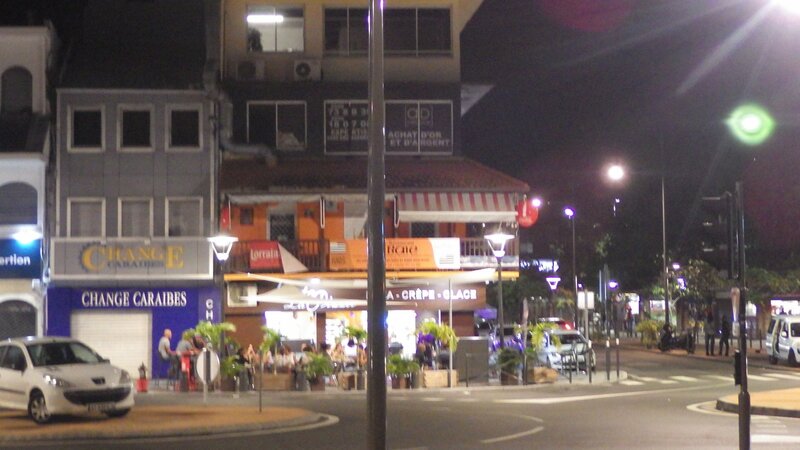 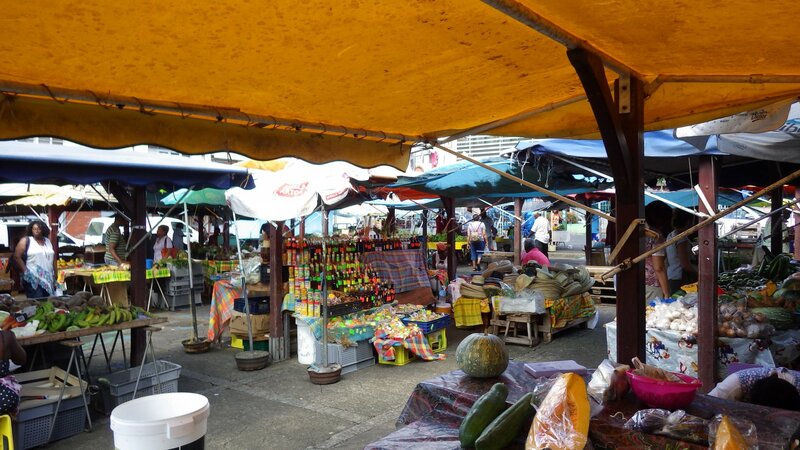 We found them cleaner, more civilized, with good services, stores stocked with European produce and reasonable prices. 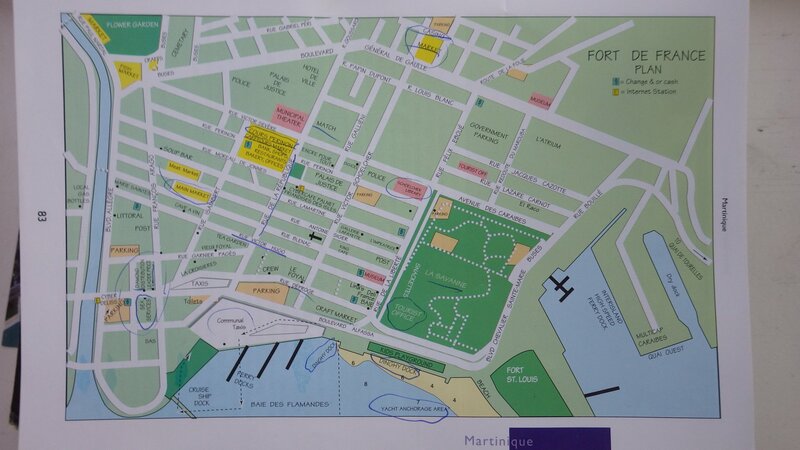 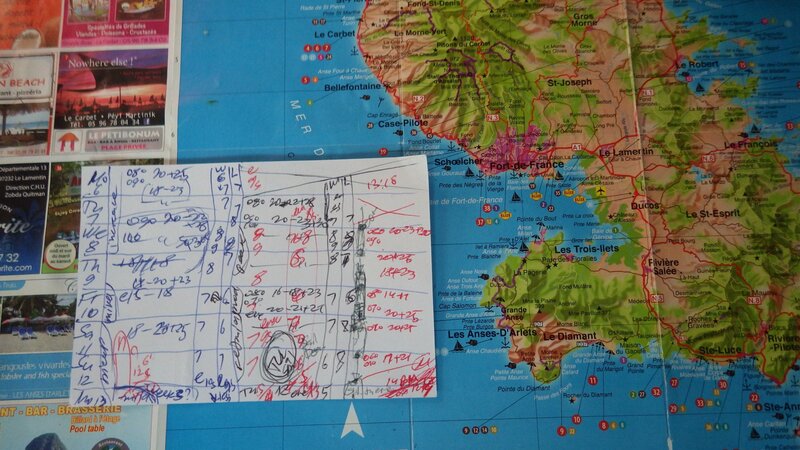 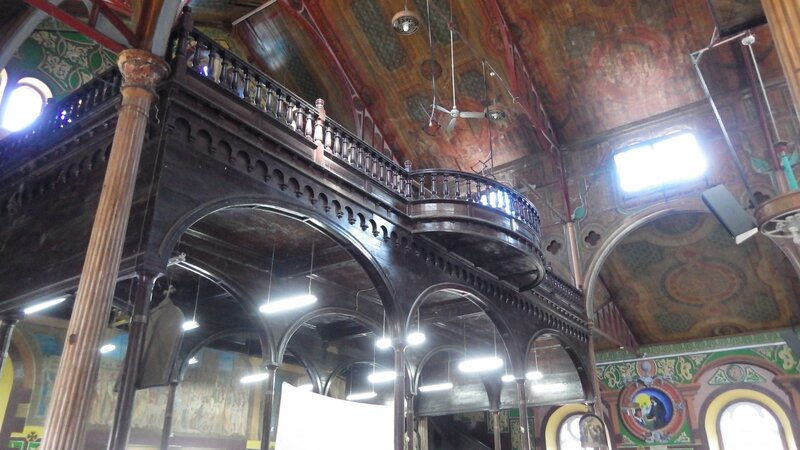 Here, we have visited some touristy places, some urban, as well as some remote. 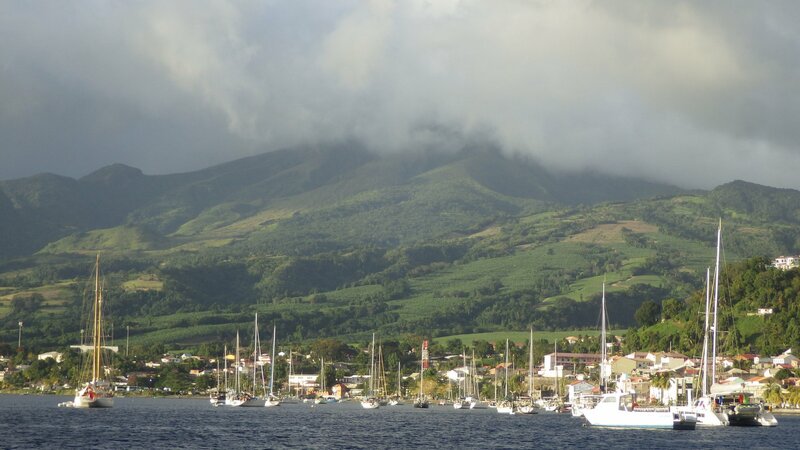 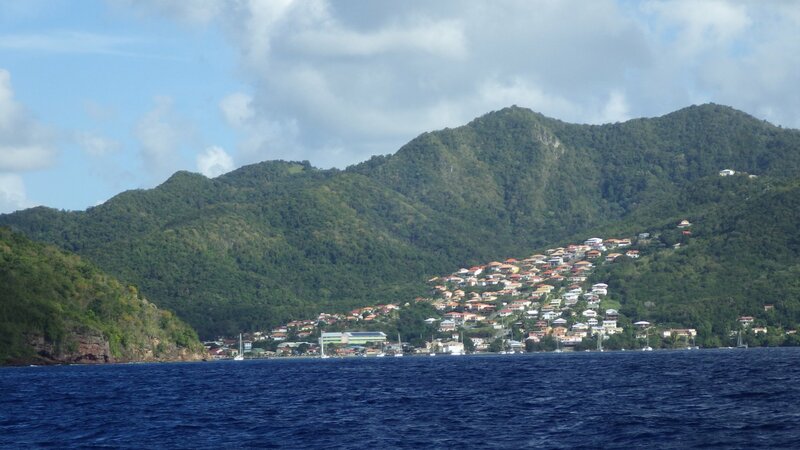 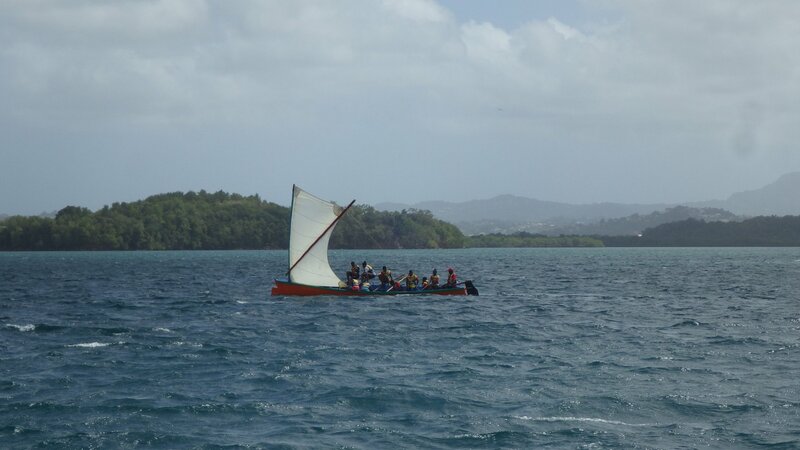 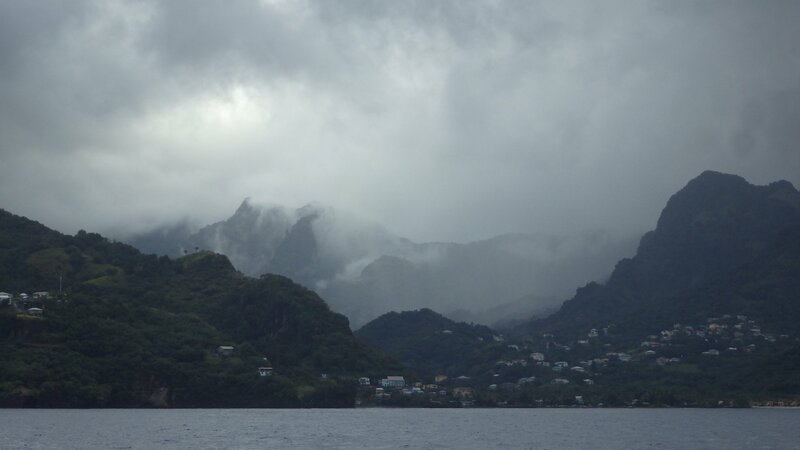 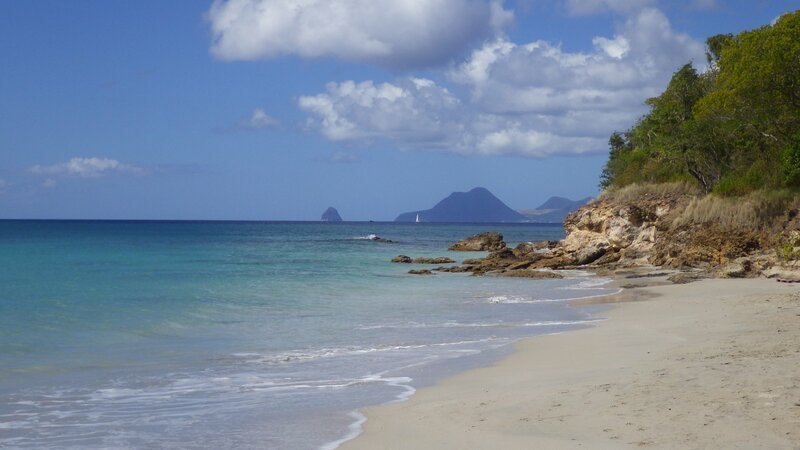 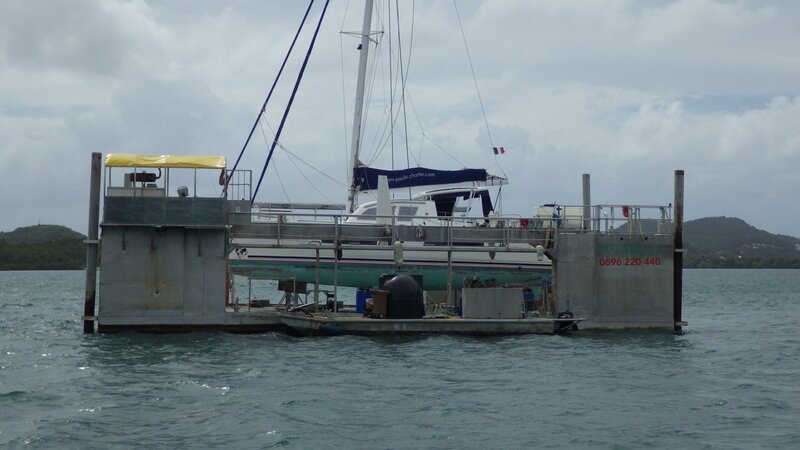 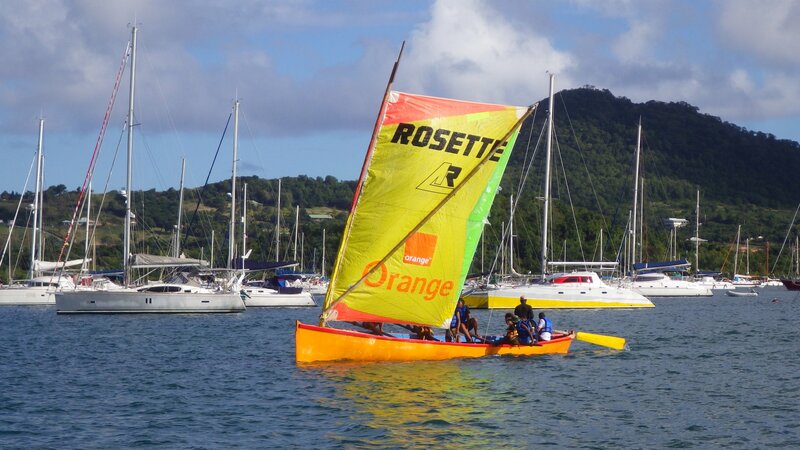 In some we have been before (St-Pierre, Fort de France, Les Trois Ilets, Anse Mitan, Le Marin, Ste-Anne), and in some we were for the first time (Baie des Anglias on the south windward side, Anse a L'Ane, Cohe du Lamnetin, Schoelcher). 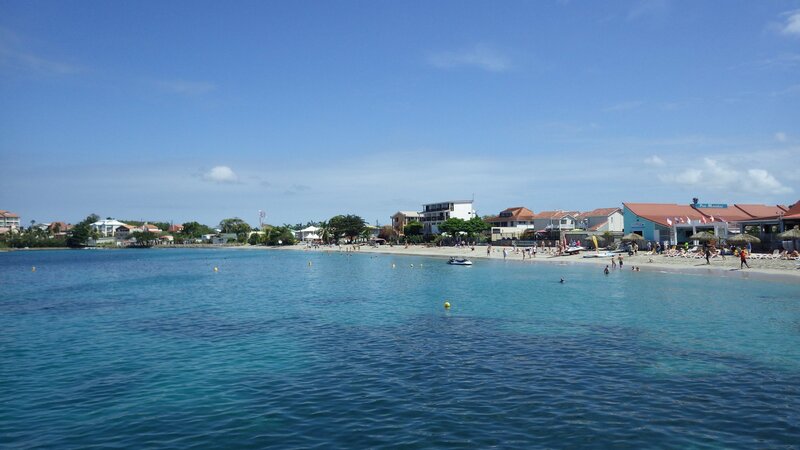 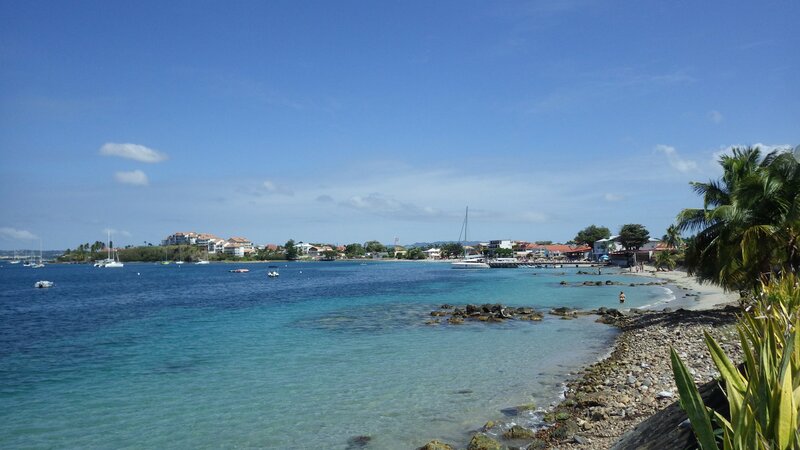 French come to this island for vacation from mainland France, creating a vibrant mix of locals and visitors. 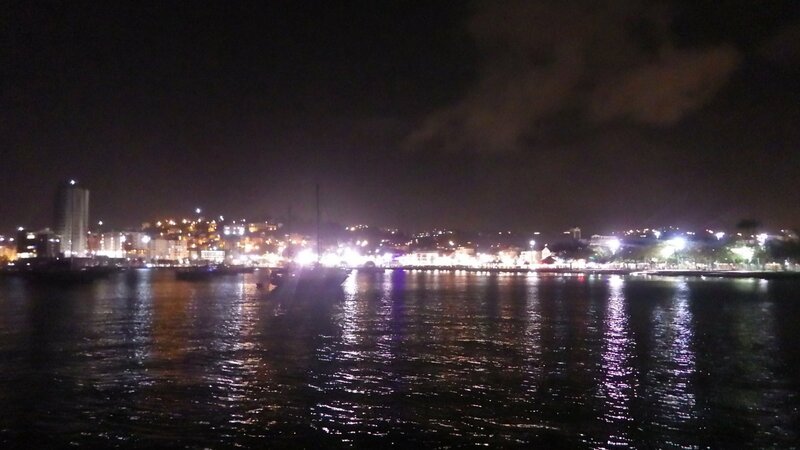 The atmosphere is lively; there are daily and nightly entertainment, and there always seem some parade or party going on. 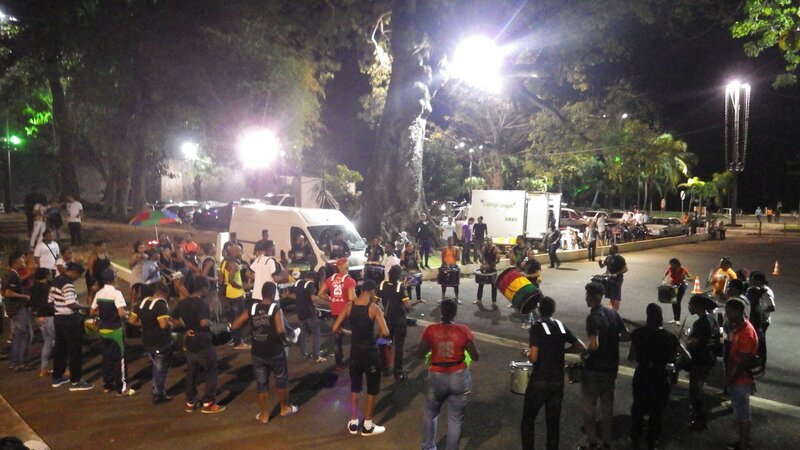 As a (amateur) drummer, I especially liked the drum marching bands � a very strong beat. 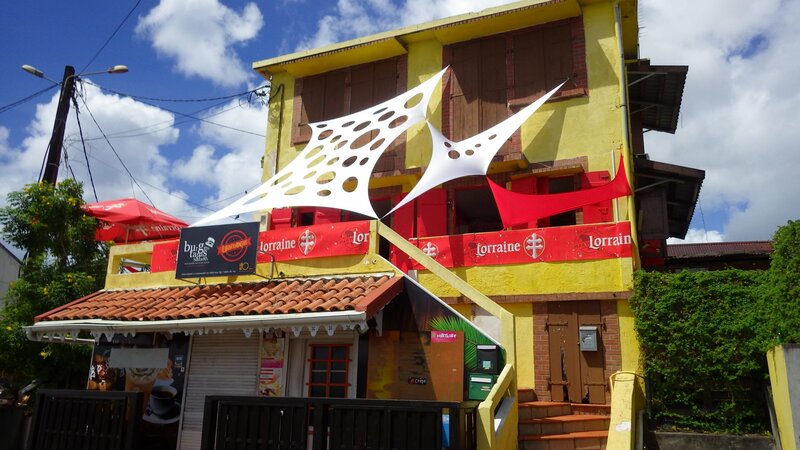 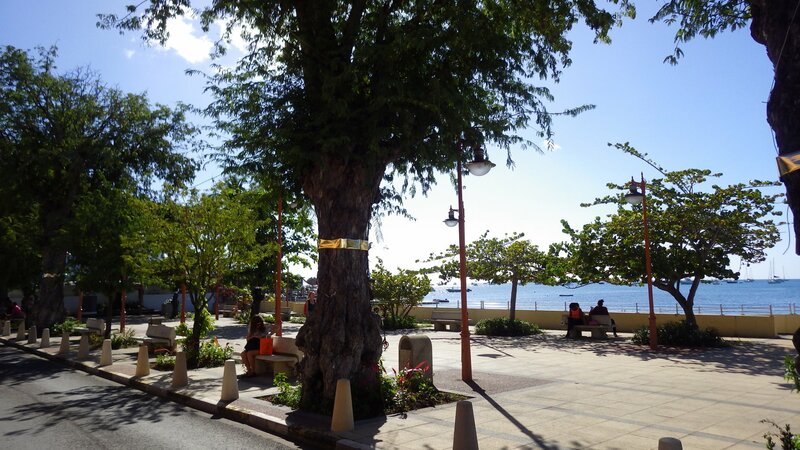 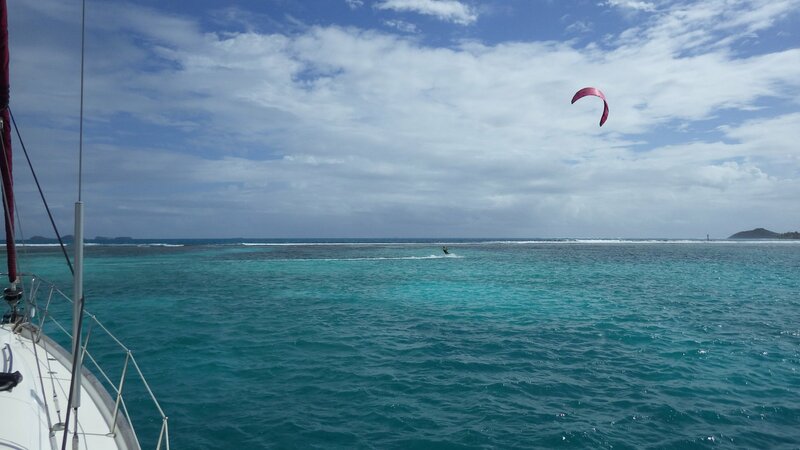 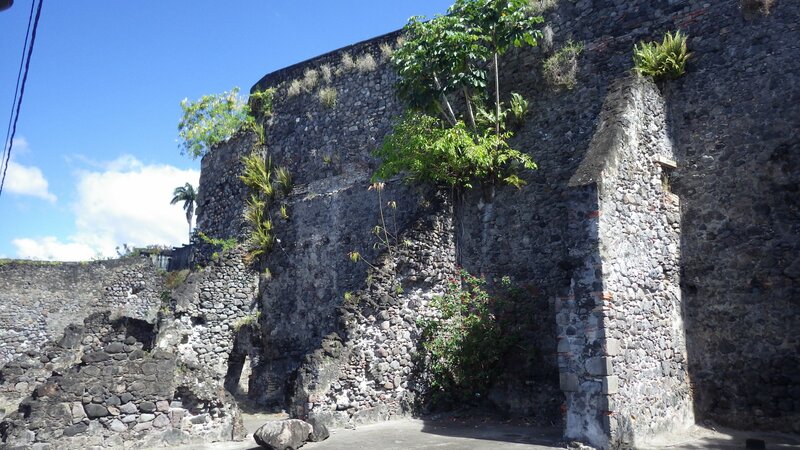 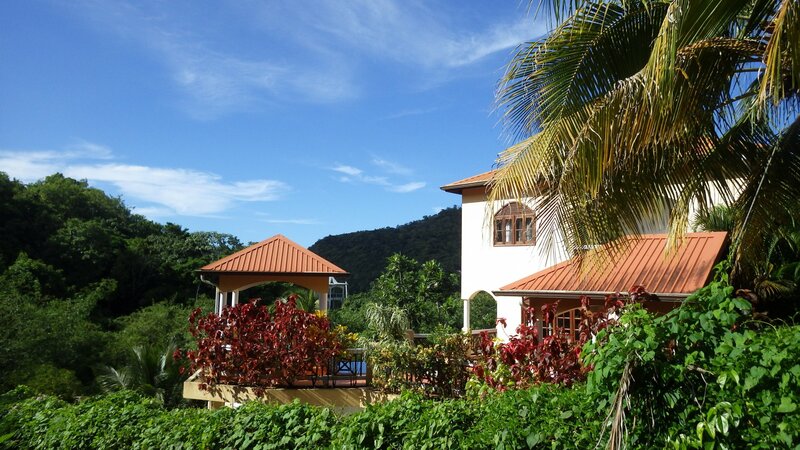 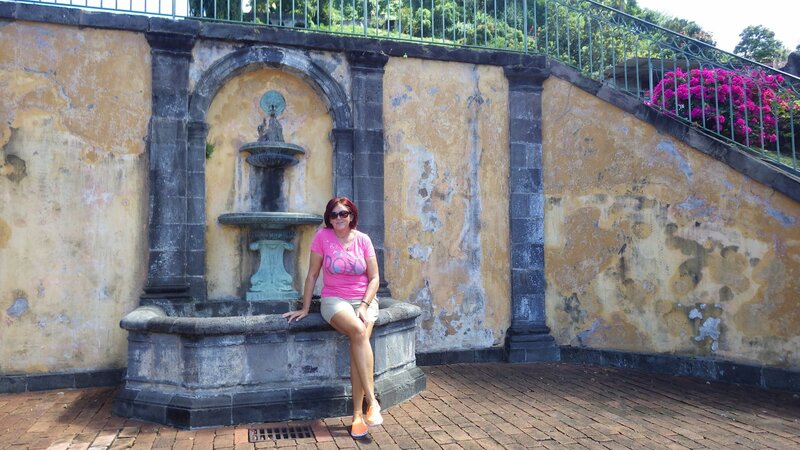 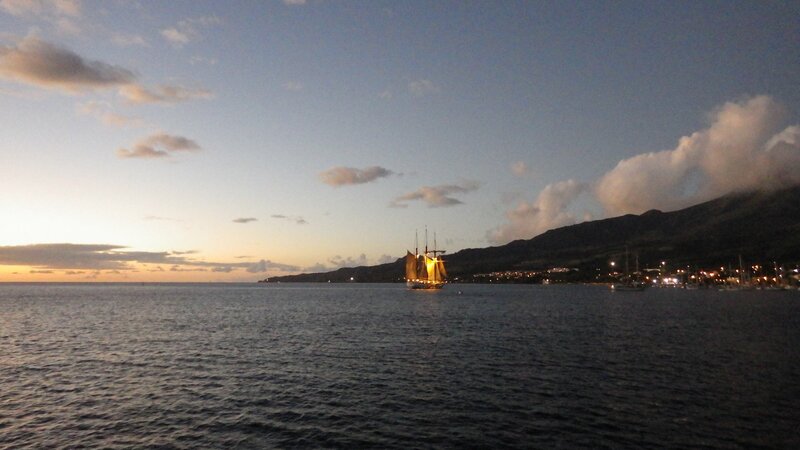 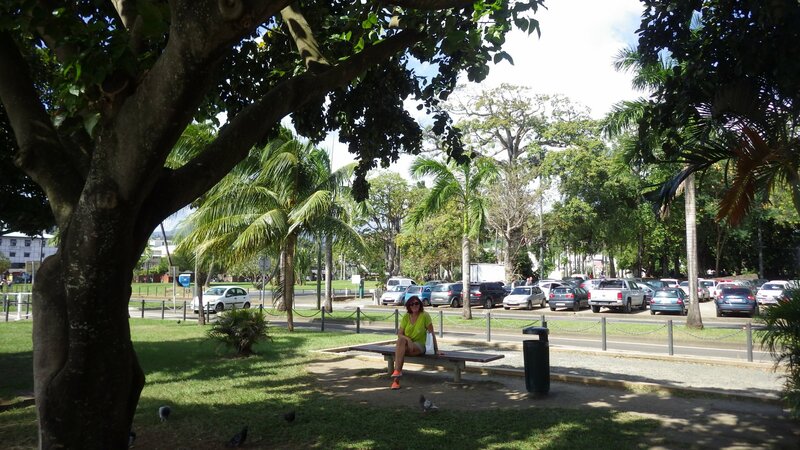 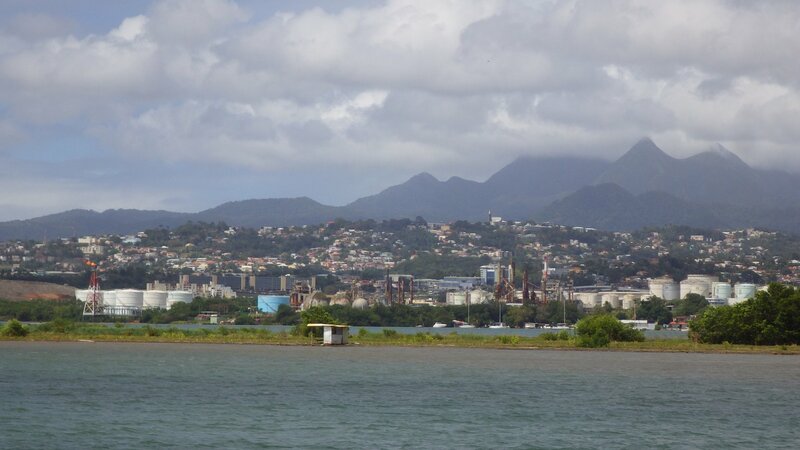 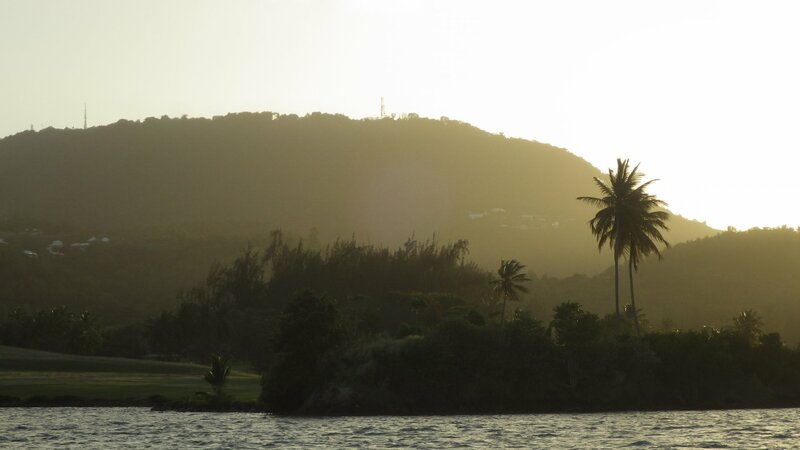 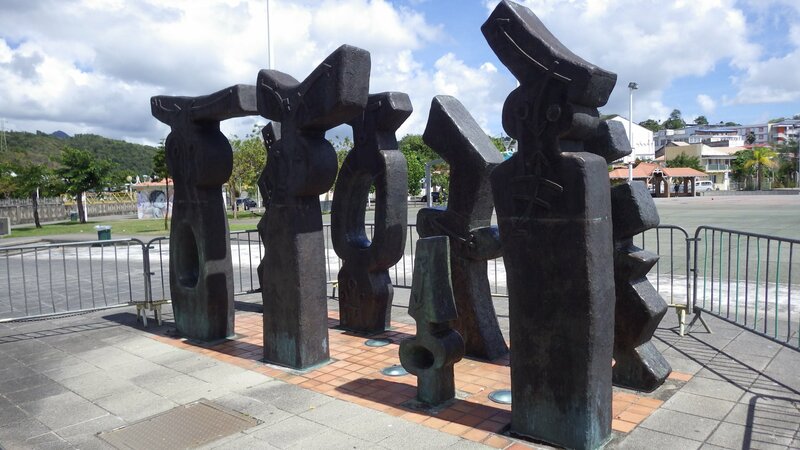 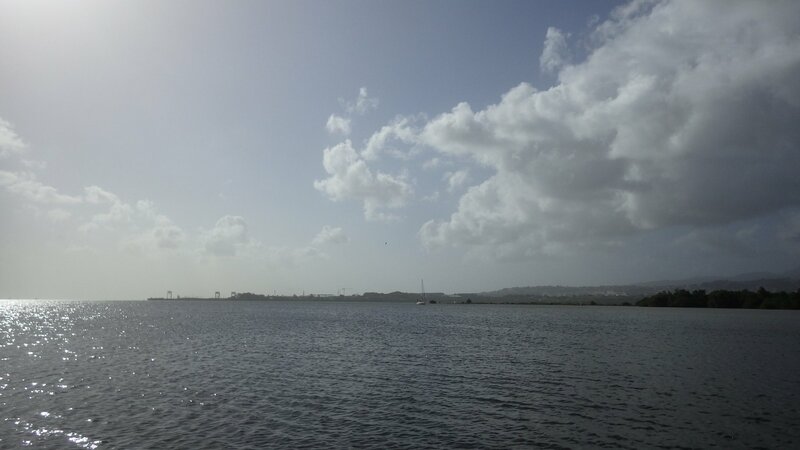 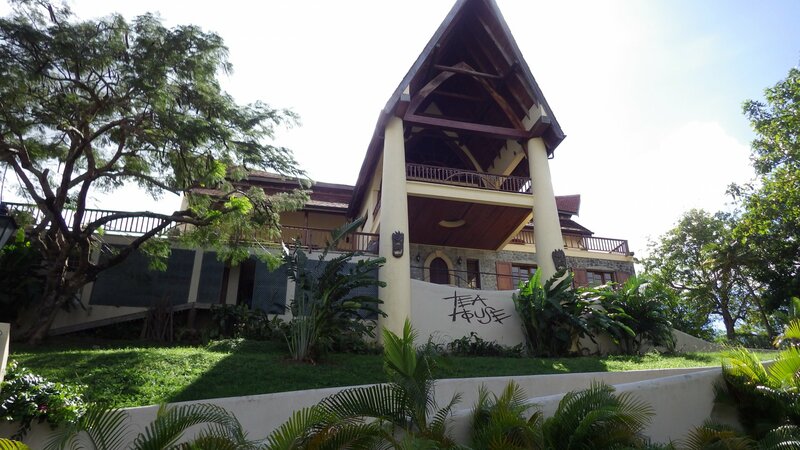 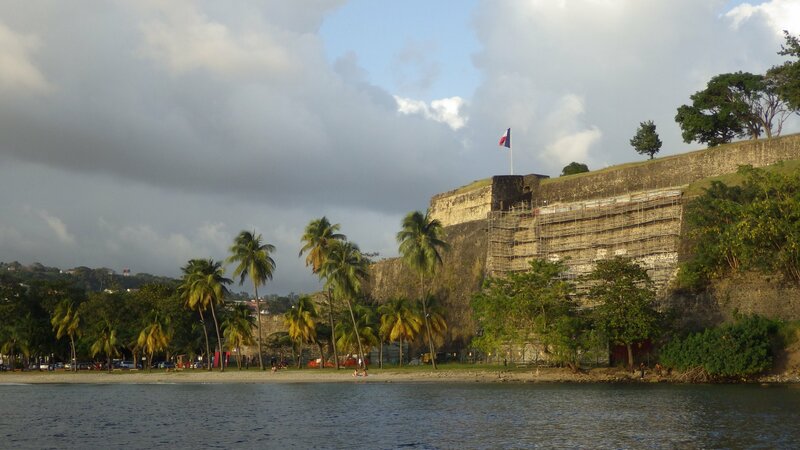 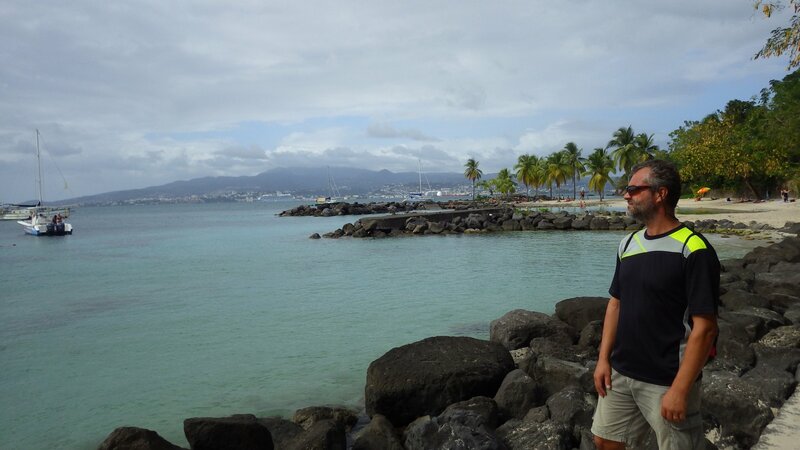 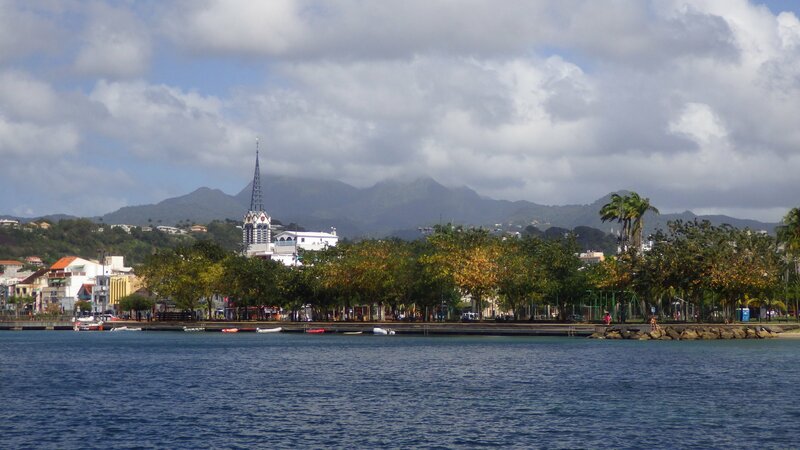 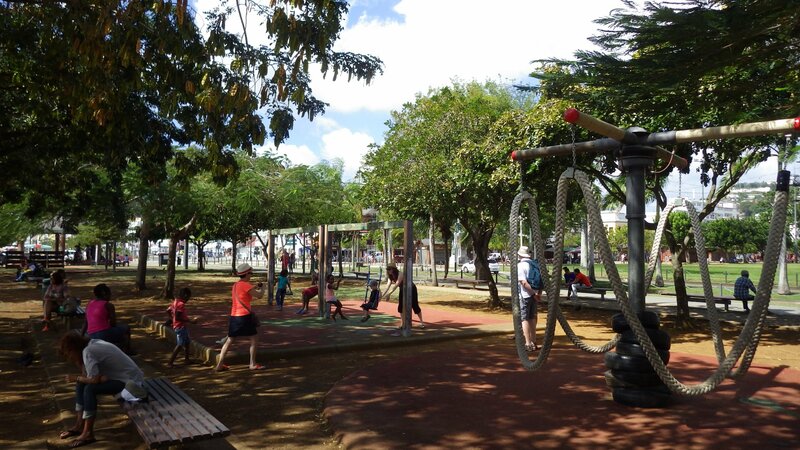 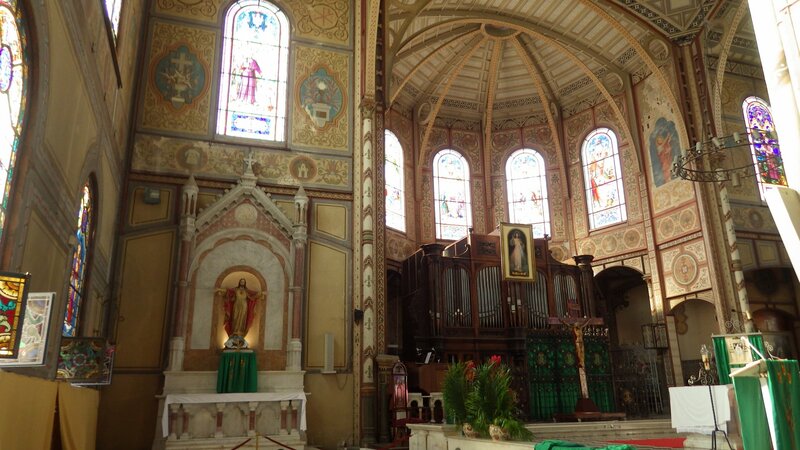 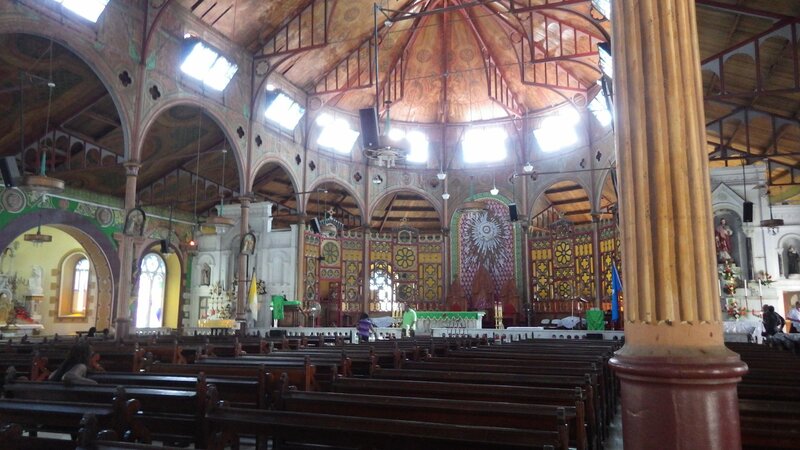 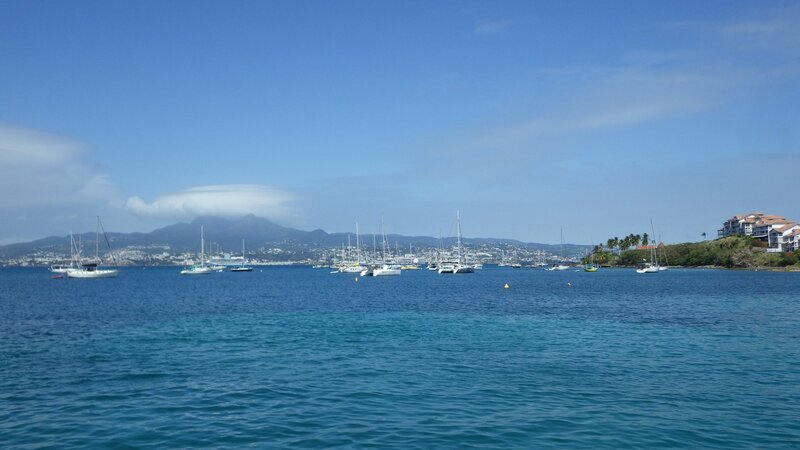 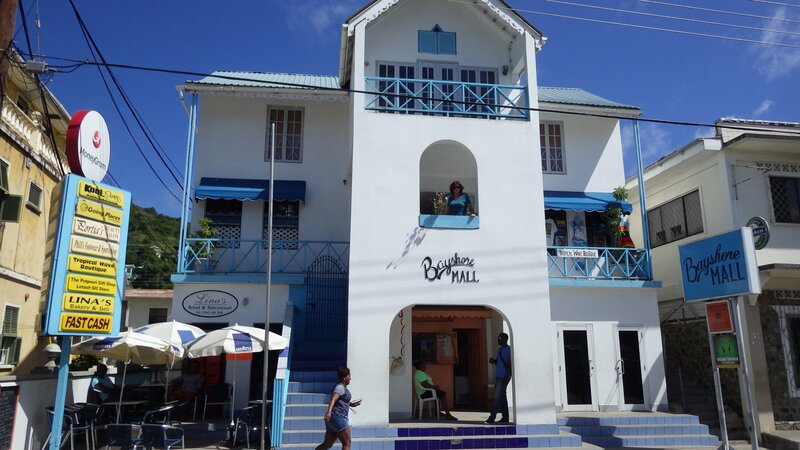 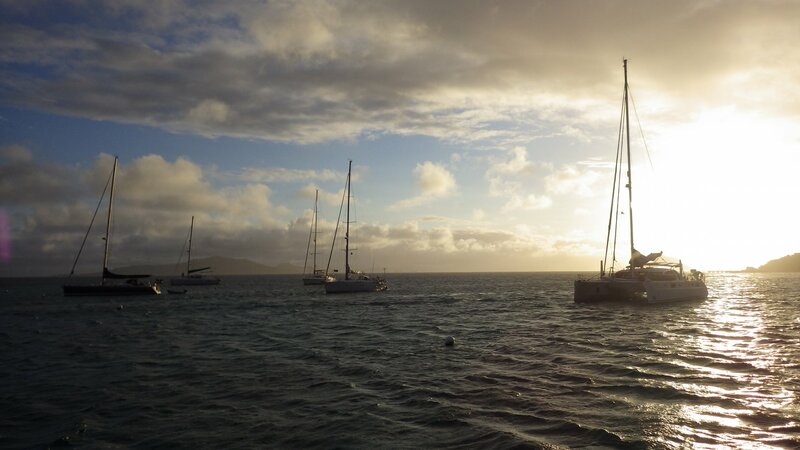 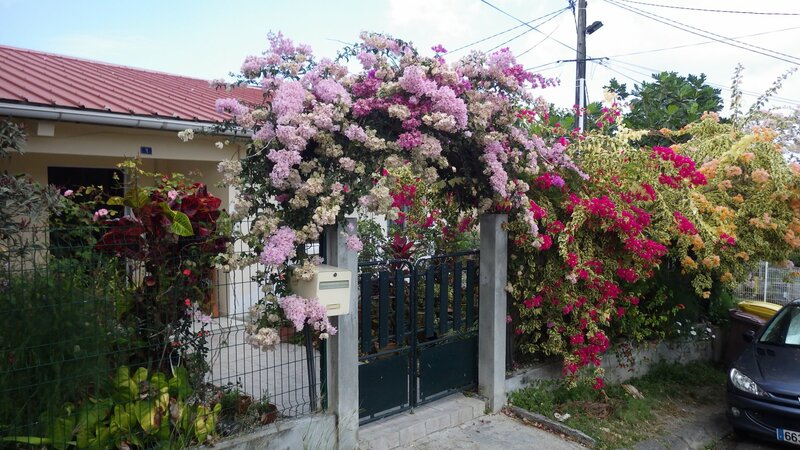 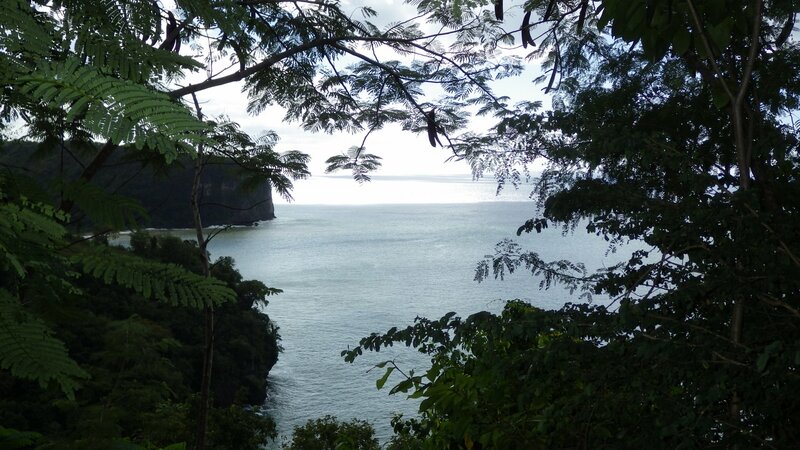 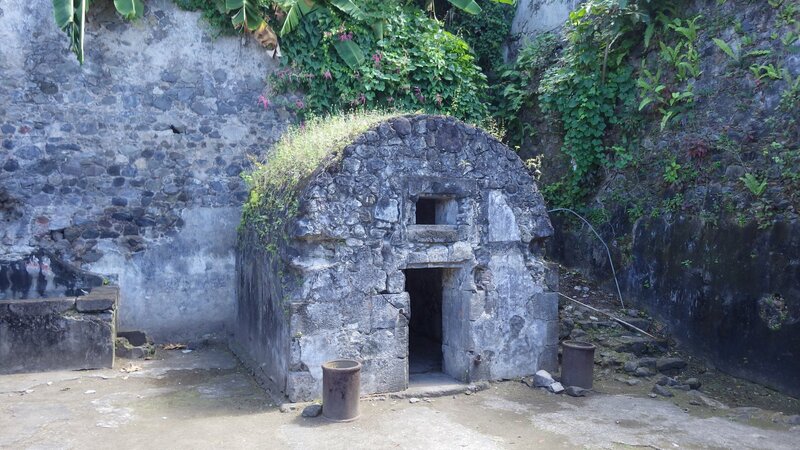 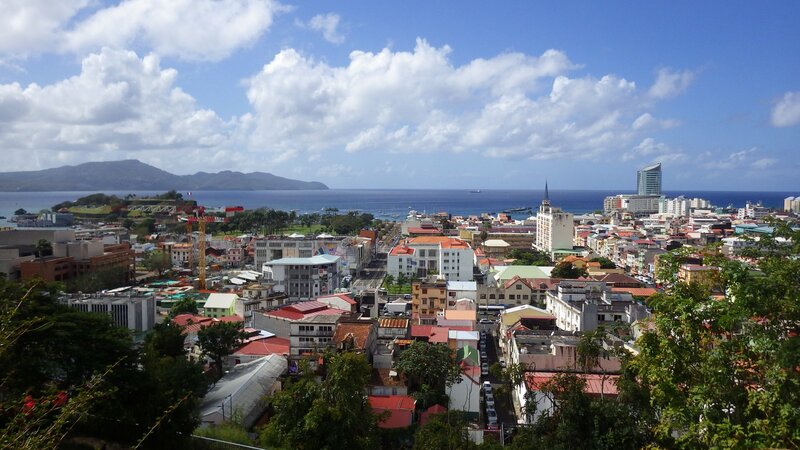 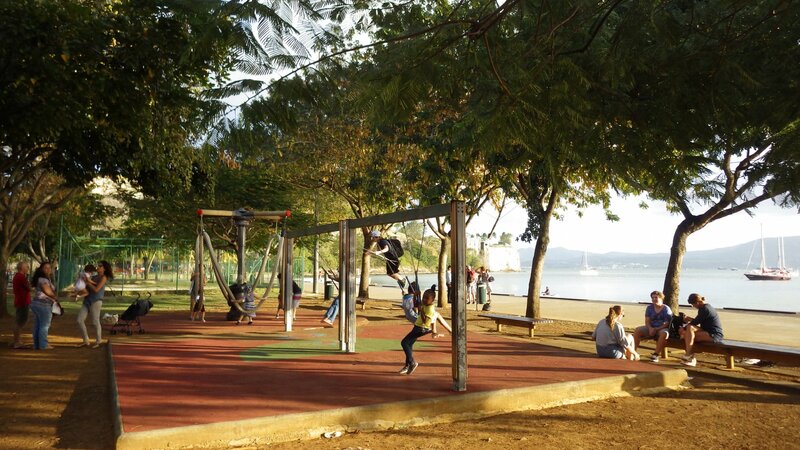 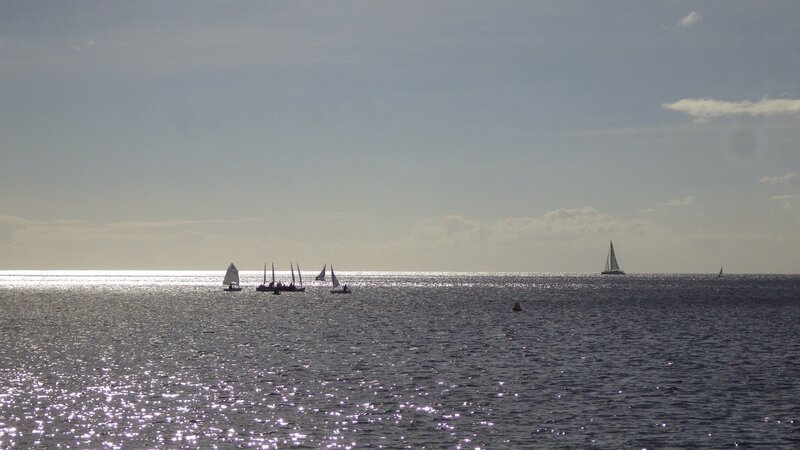 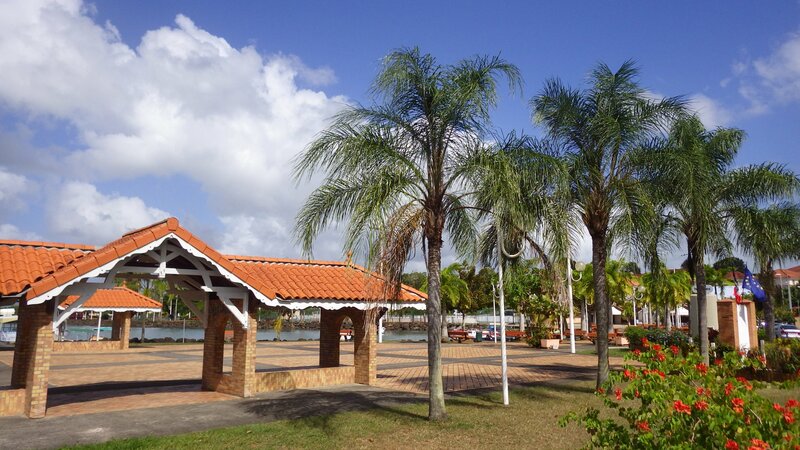 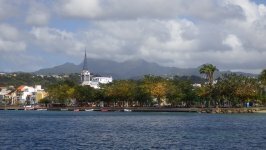 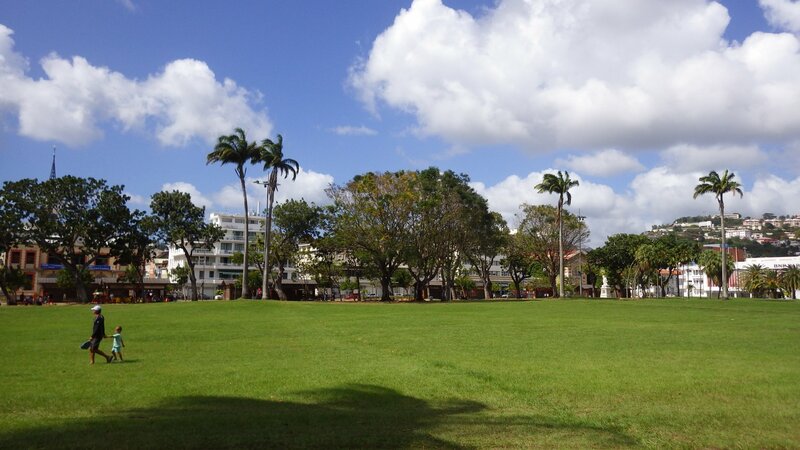 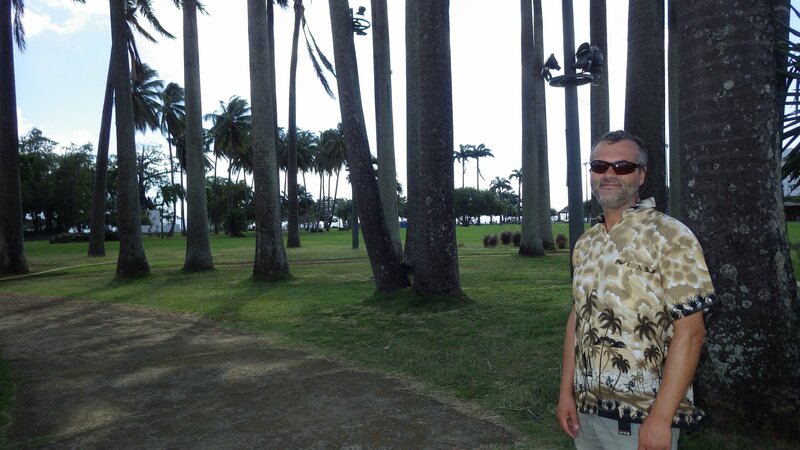 Fort de France has become our favorite Caribbean city - it is as metropolitan as it can get in the region.